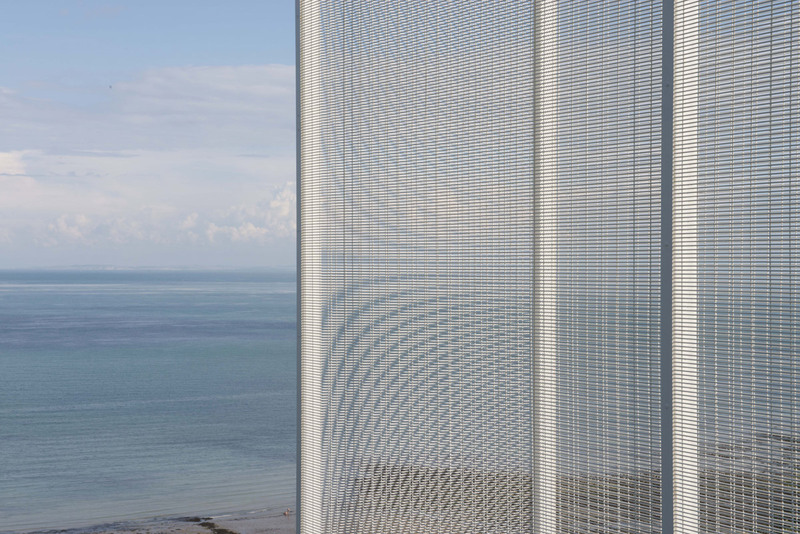 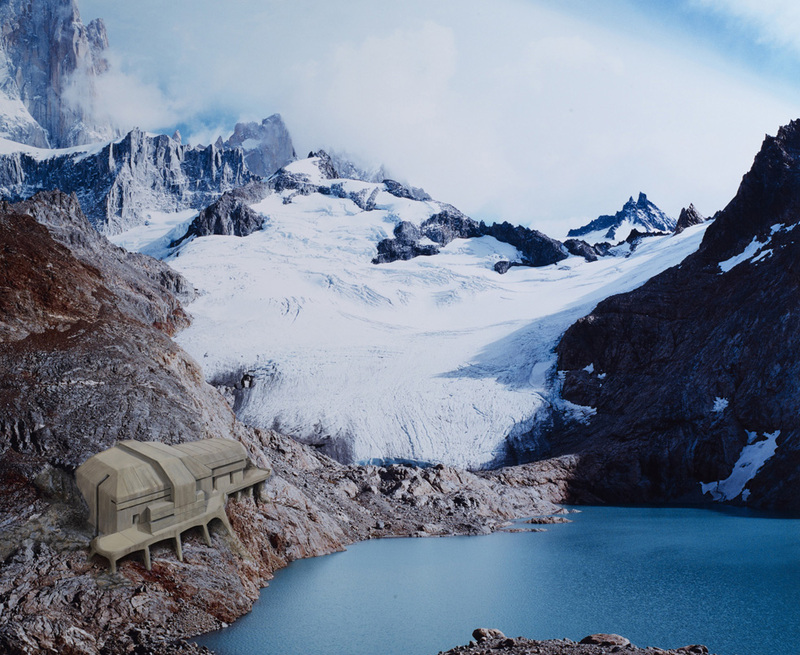 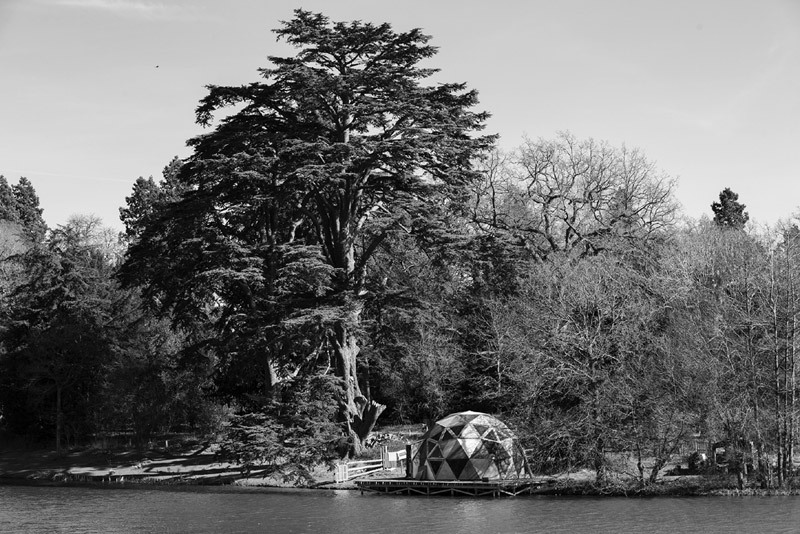 Alex Hartley is a UK based artist whose work destabilises ideas of both iconic architecture and nature by exploring our understanding of utopian ideologies. 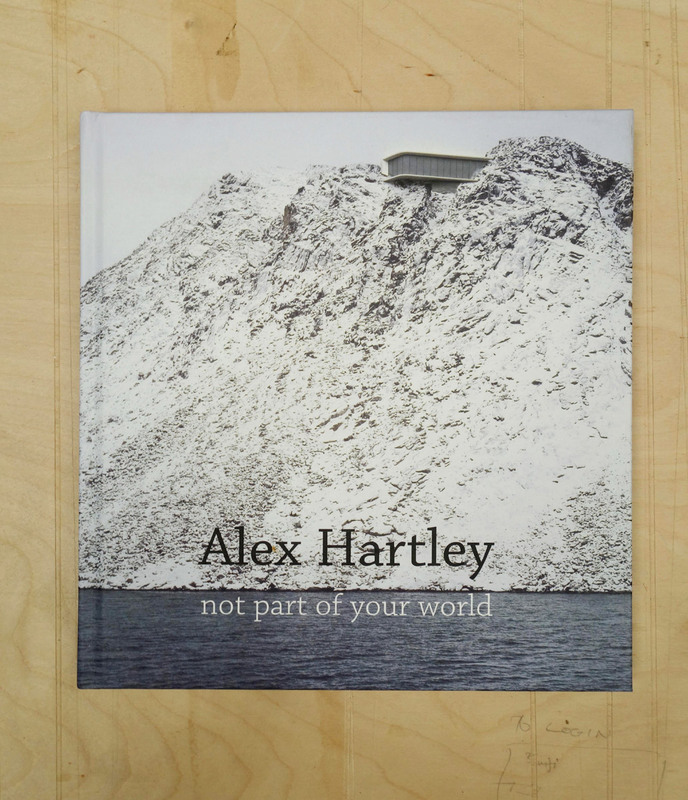 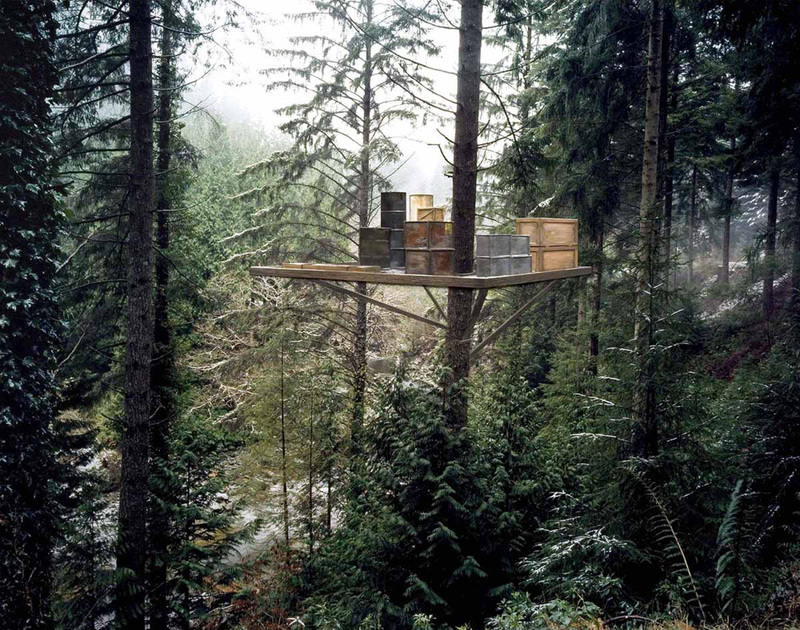 Hartley has taken his work into the public realm expanding the context with ambitious works of land-art, employing his practice to test our notions of utopia, the individual, and the critical relationship we have with the environment that questions how we occupy the world's wild places. 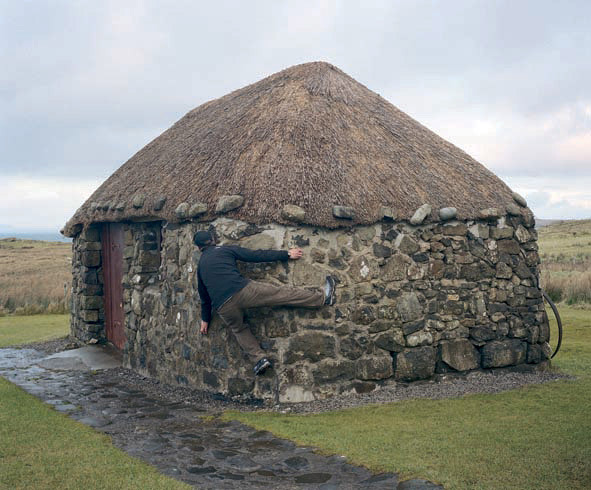 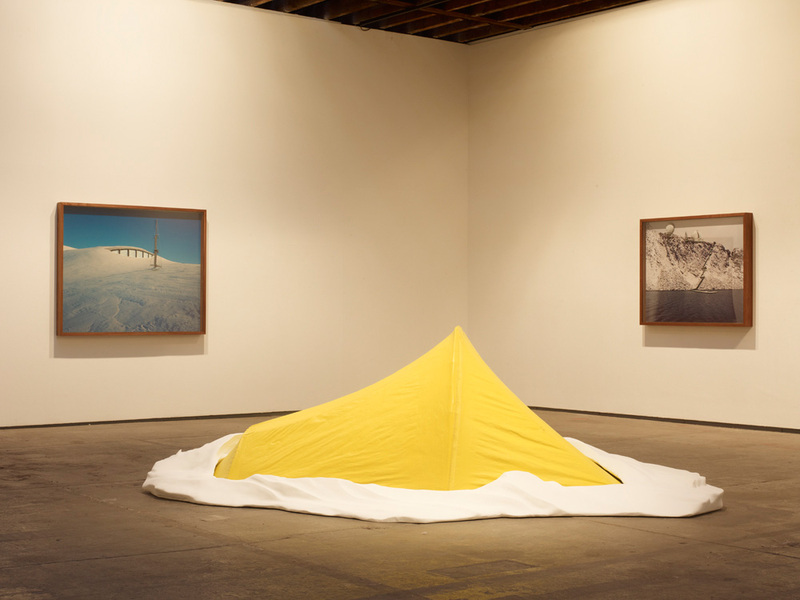 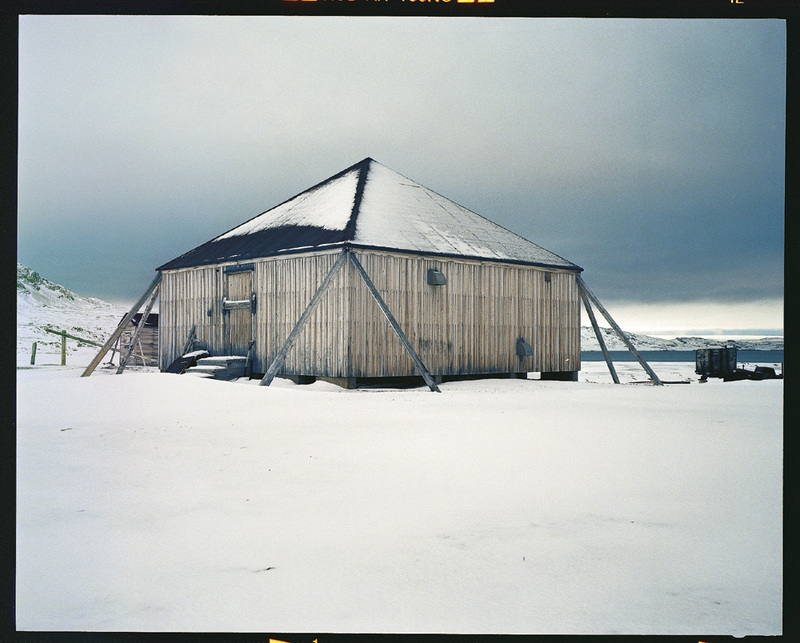 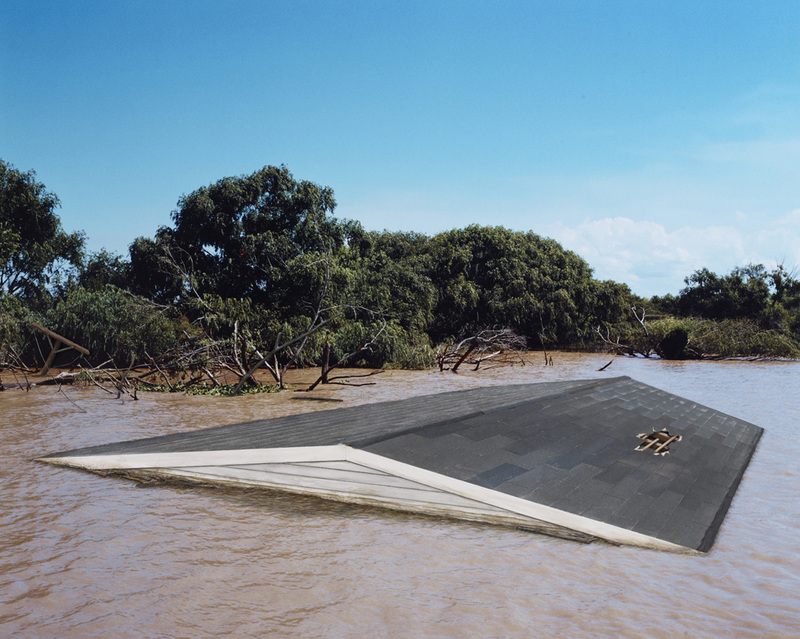 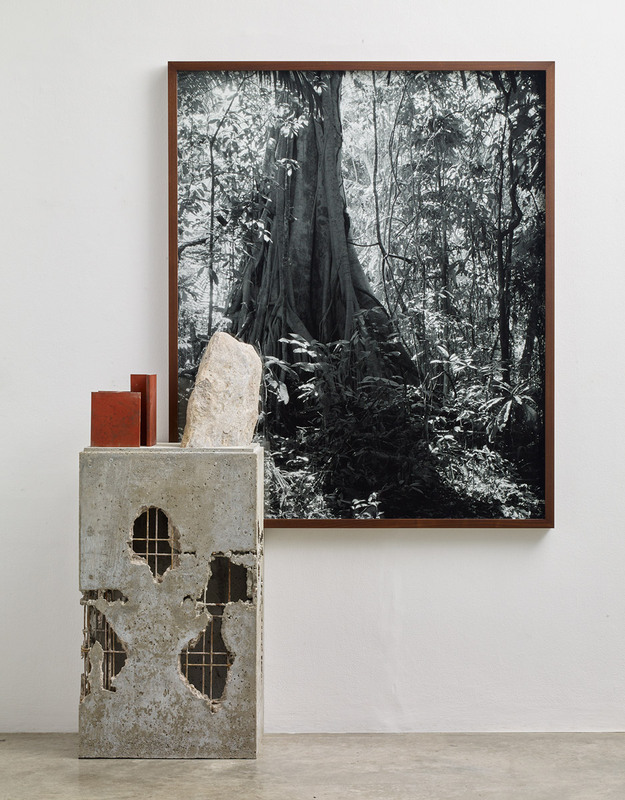 His practice is wide ranging, comprising wall-based sculptural photographic compositions, film-making, climbing, artist publications, room-sized architectural installations, participatory site-specific works, and it often involves him travelling to remote places as a trigger for his work. 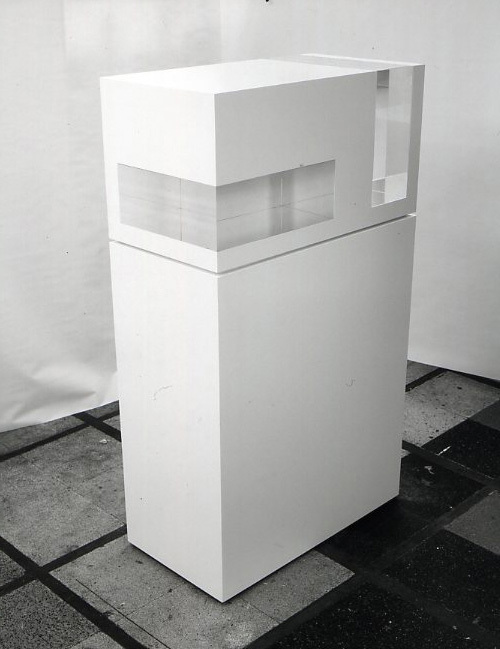 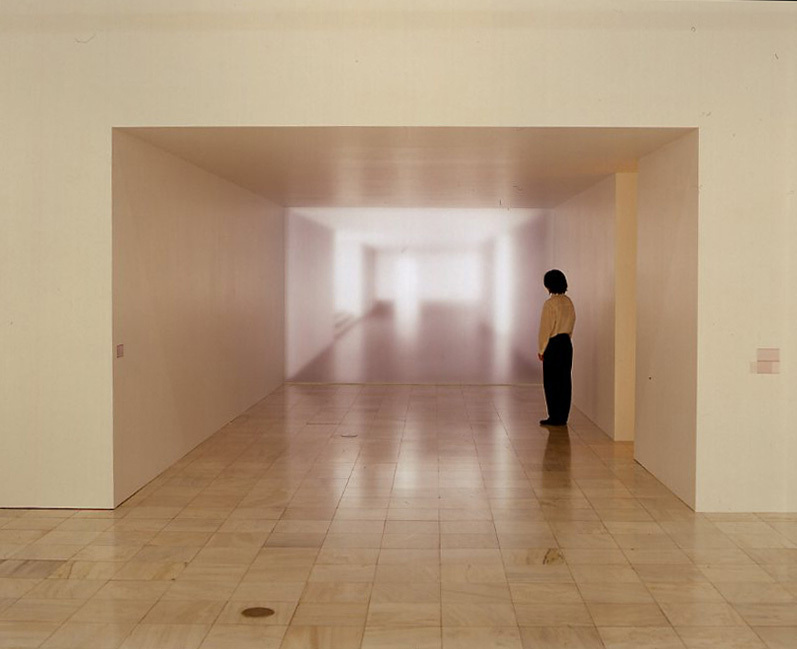 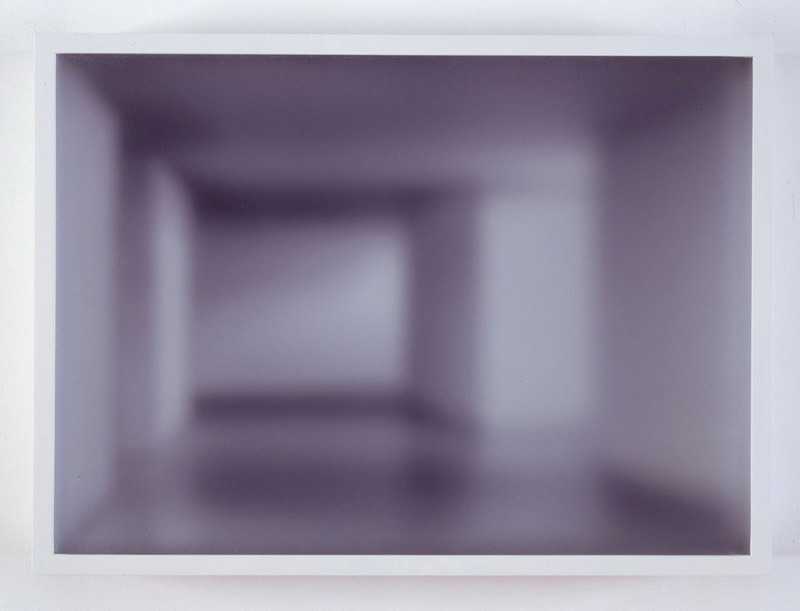 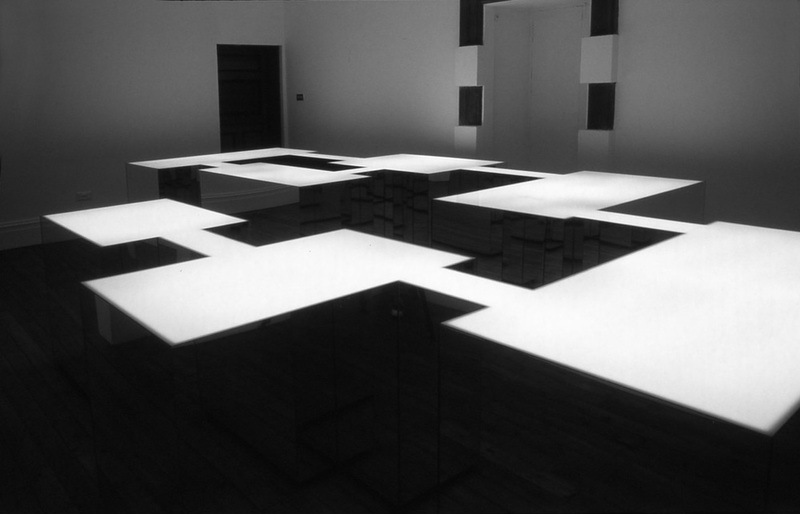 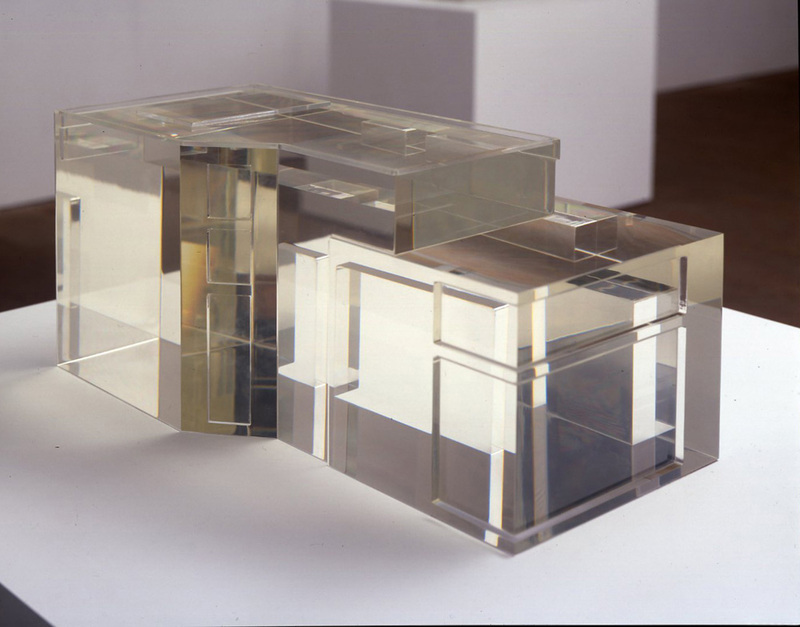 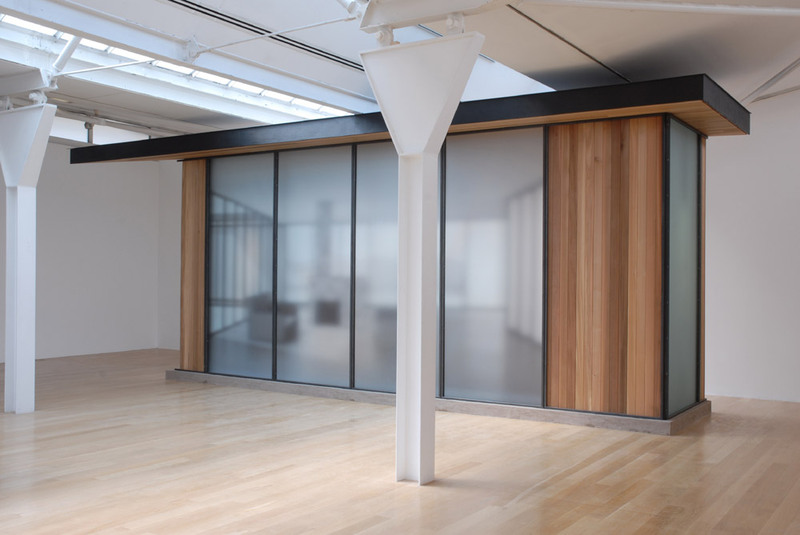 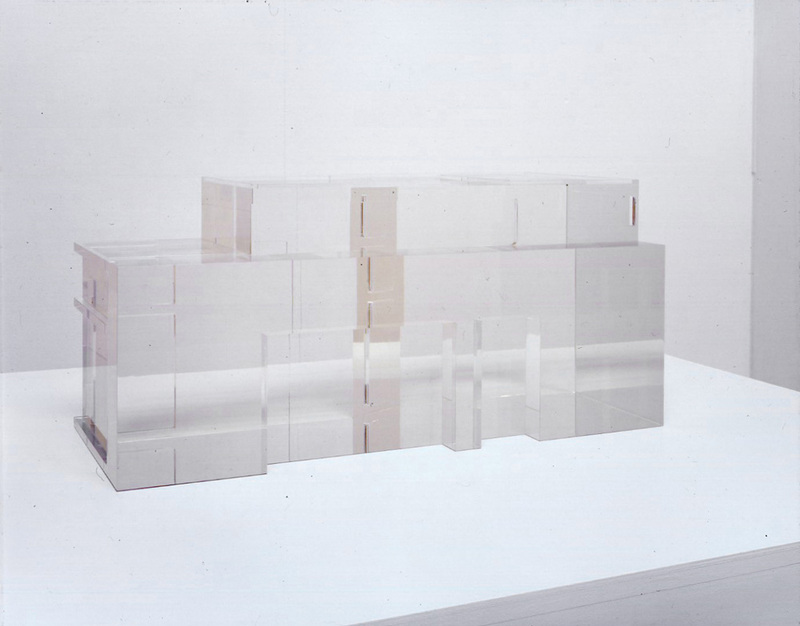 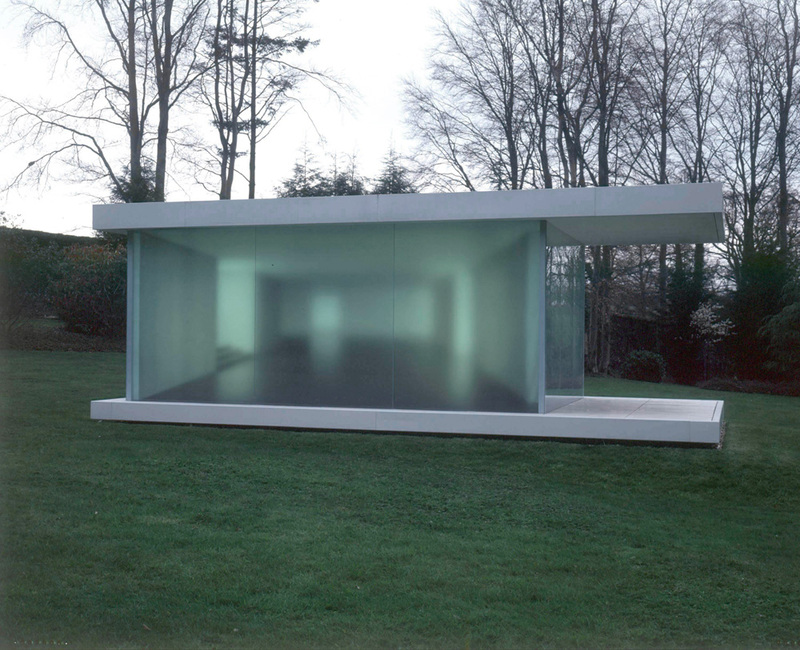 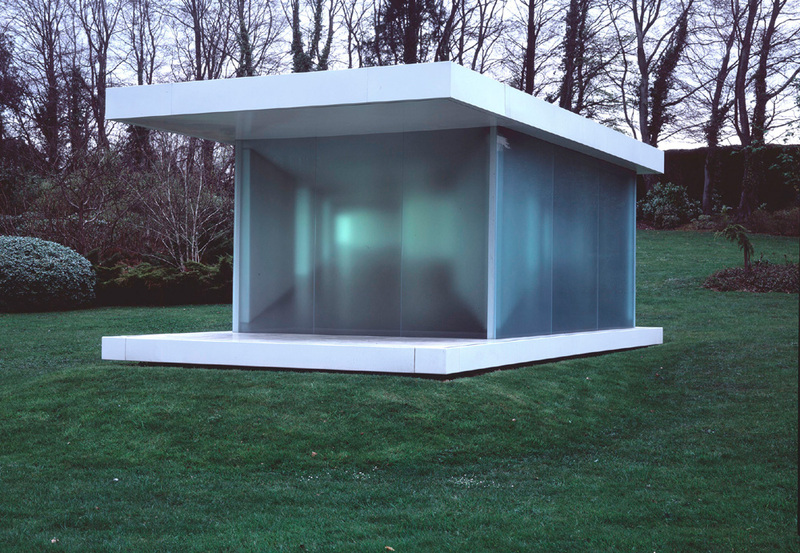 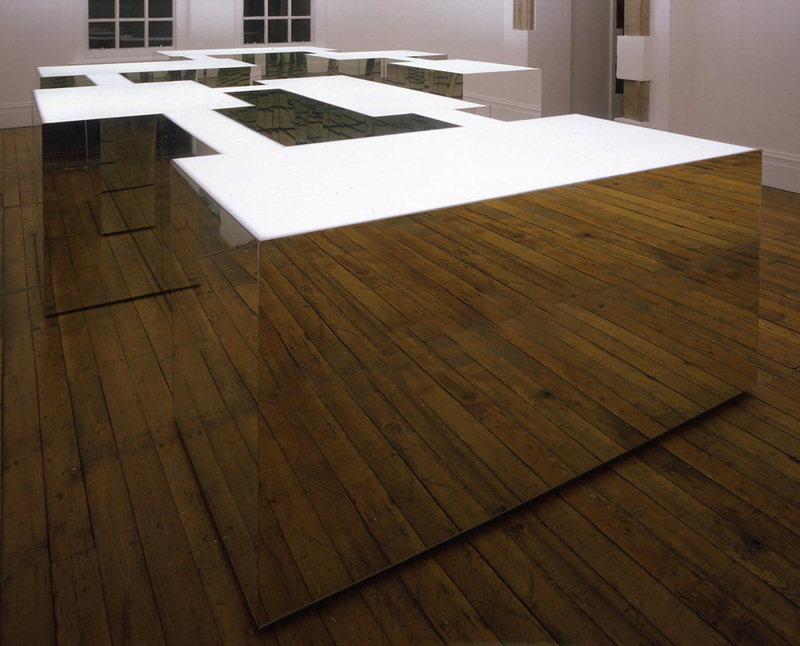 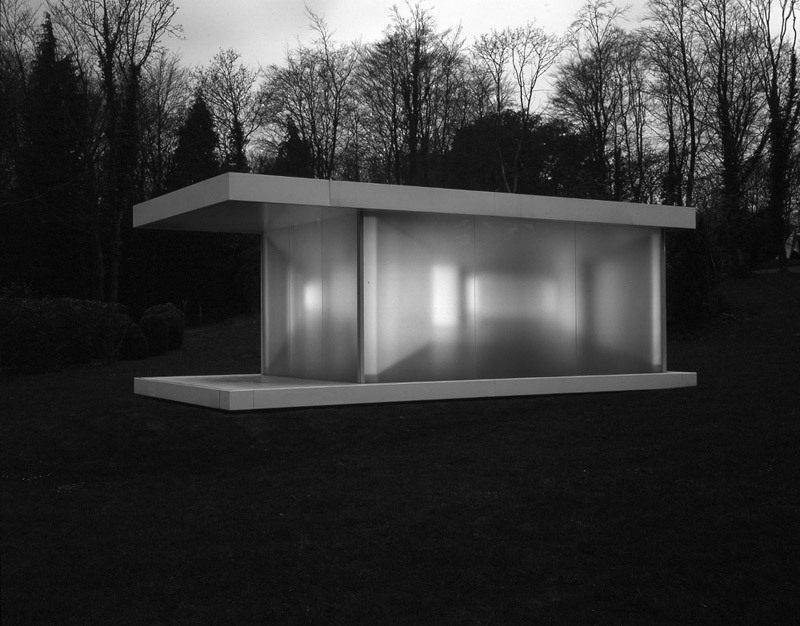 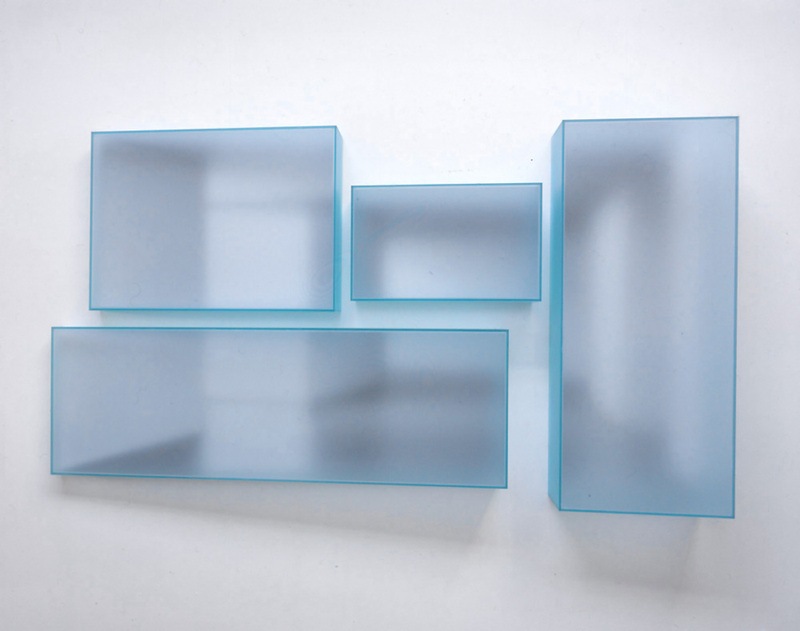 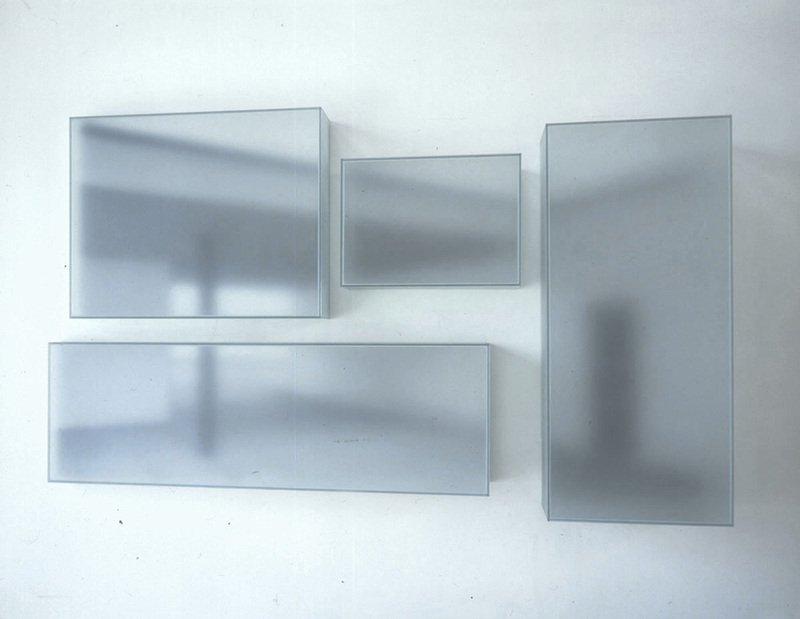 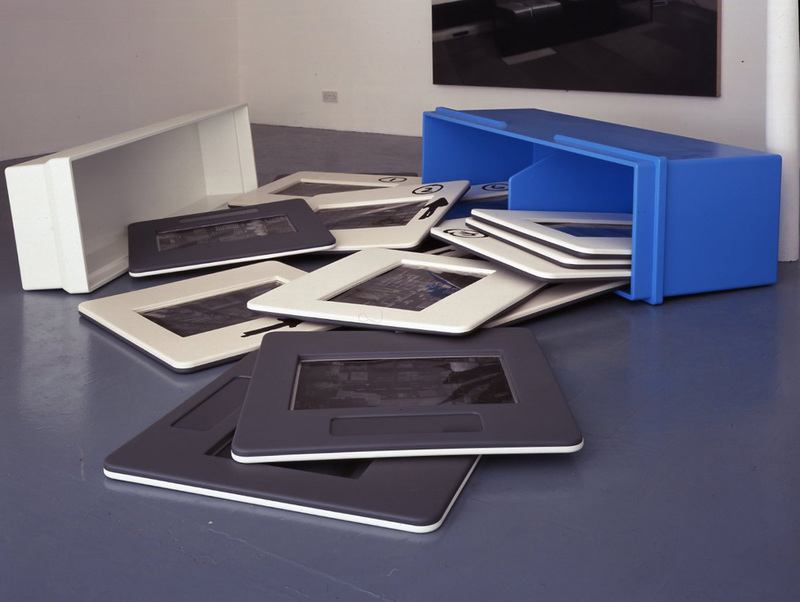 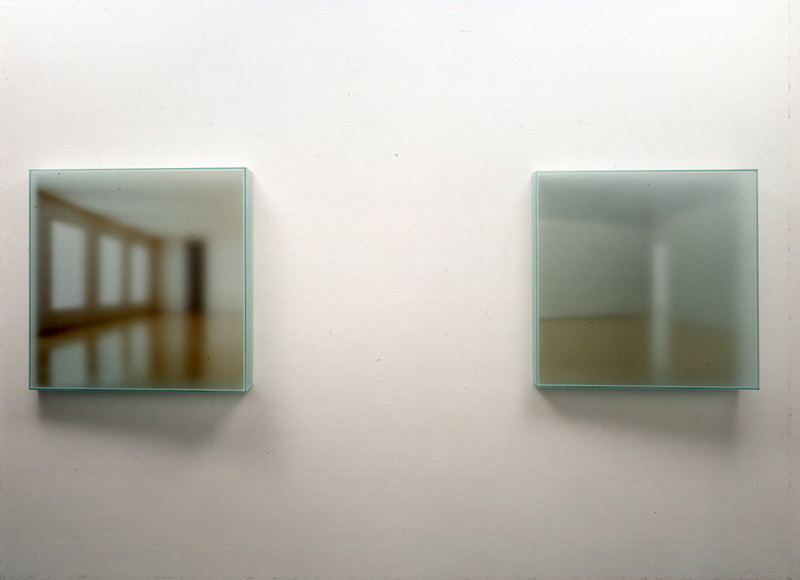 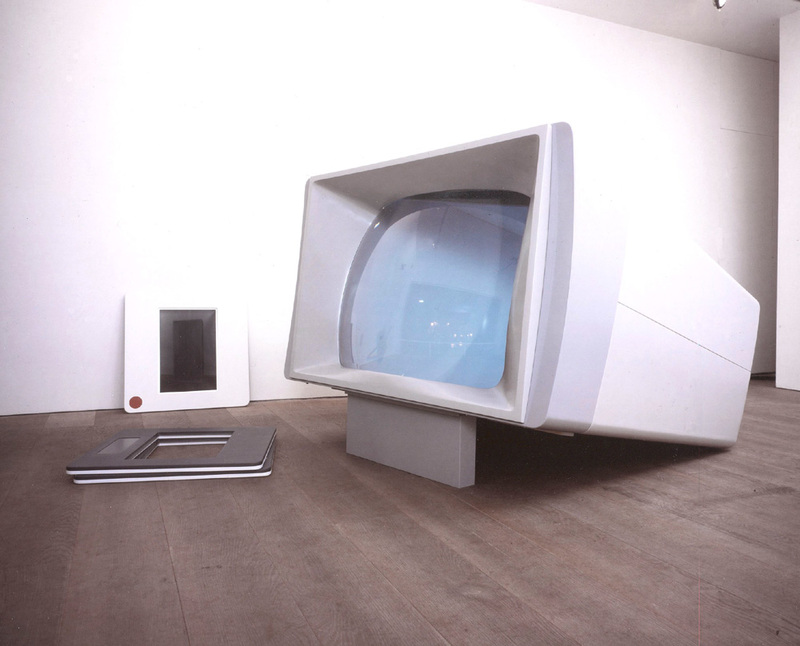 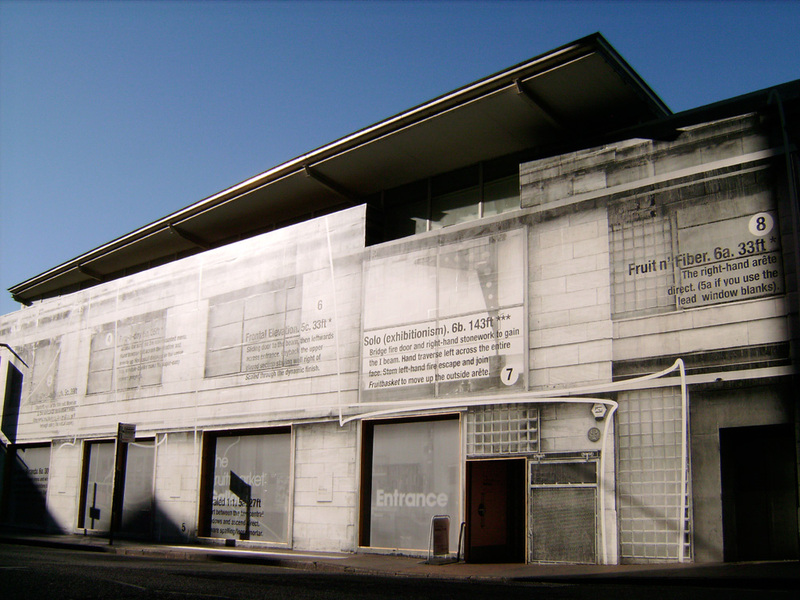 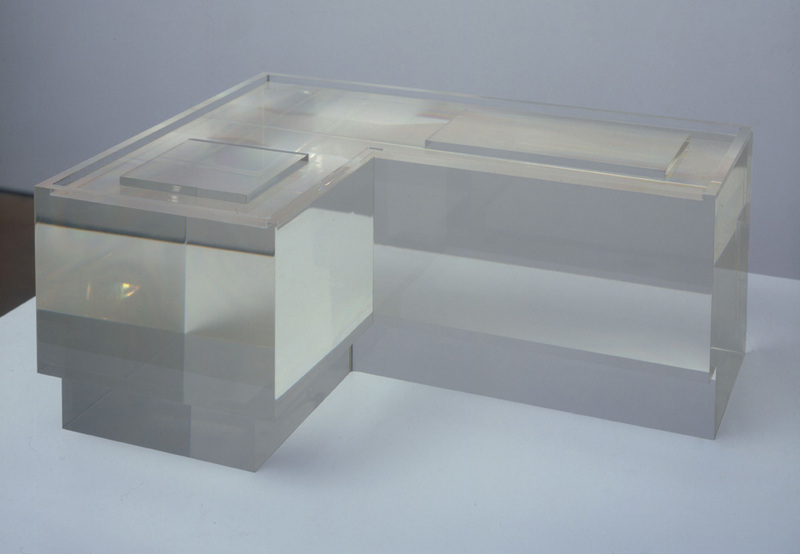 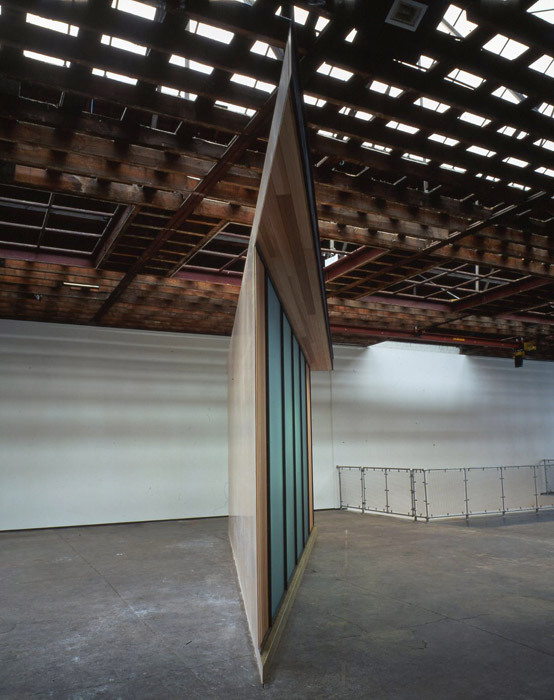 His early work focused on the white cube of the gallery space; testing the parameters of the containers of art. 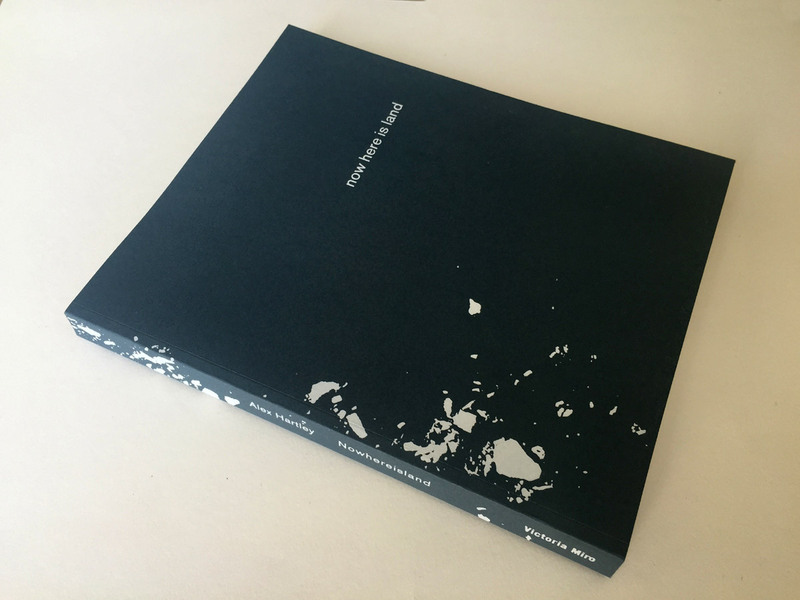 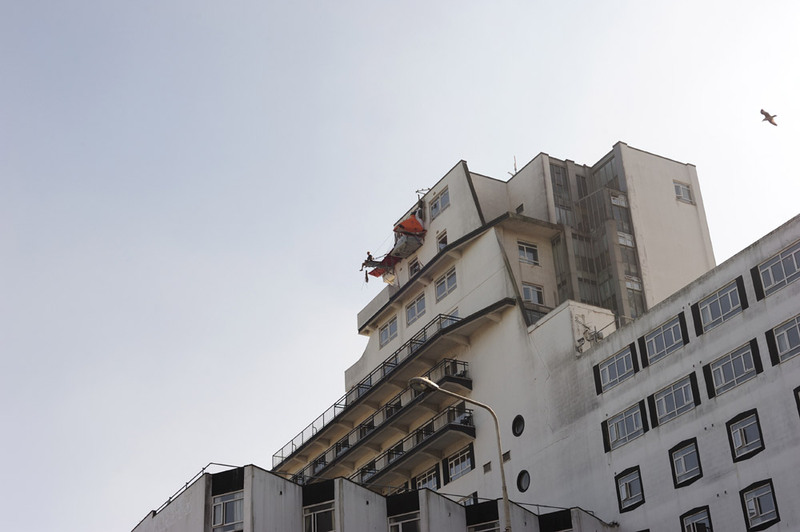 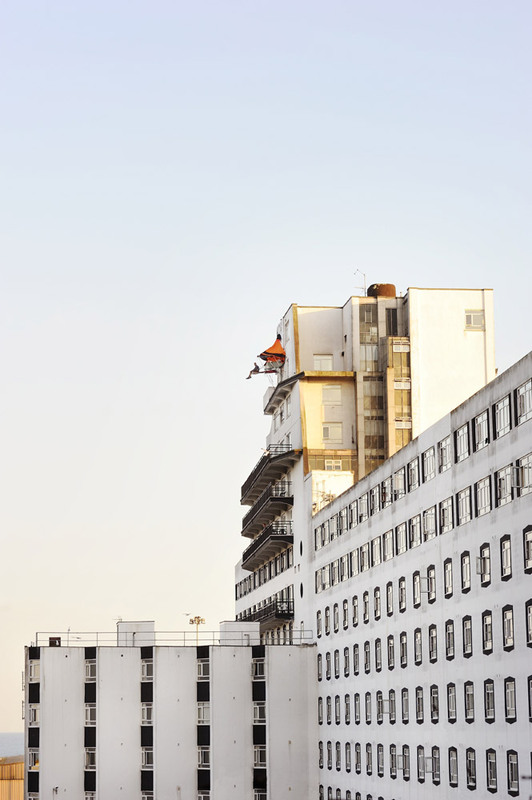 This has evolved to explore iconic modernist architectural forms as the work considers buildings as social experiments manifested in both the built and natural environments. 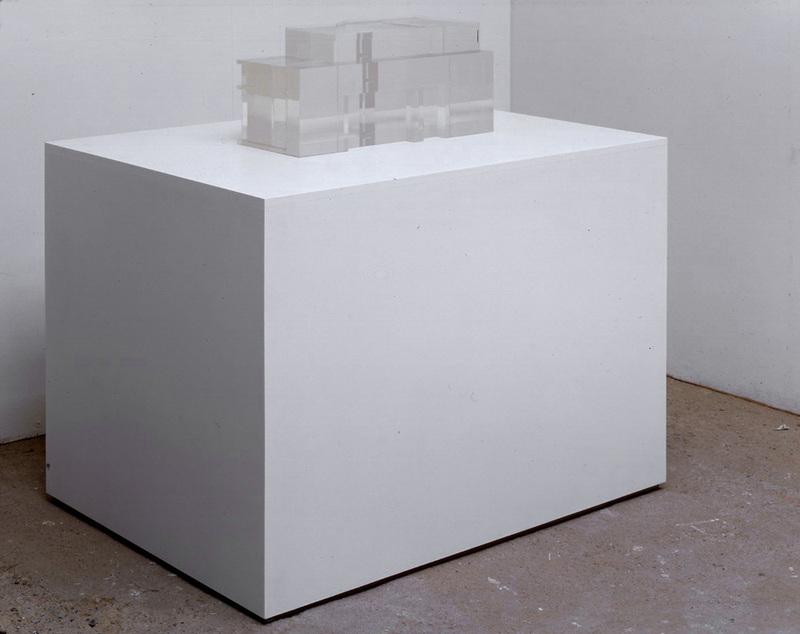 Hartley's work always encourages us to consider how we experience and think about our constructed surroundings – through surface and line, scale and materials, locations and contexts. 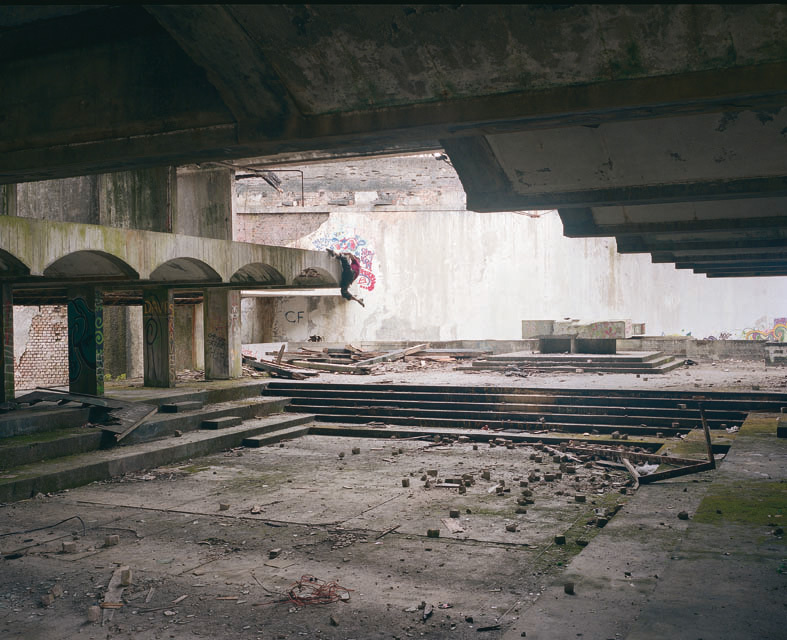 While modernist architecture has been a constant touchstone for Hartley, amplified in recent work is a sense of narrative, of the viewer having arrived at a situation of ambiguous cause and uncertain outcome. 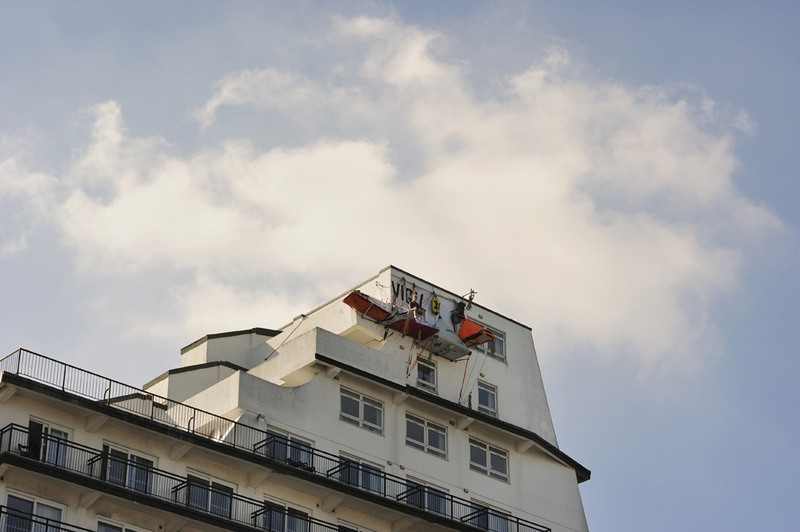 Alongside Hartley's gallery practice, he has developed a series of challenging and engaged works taking place in the public realm. 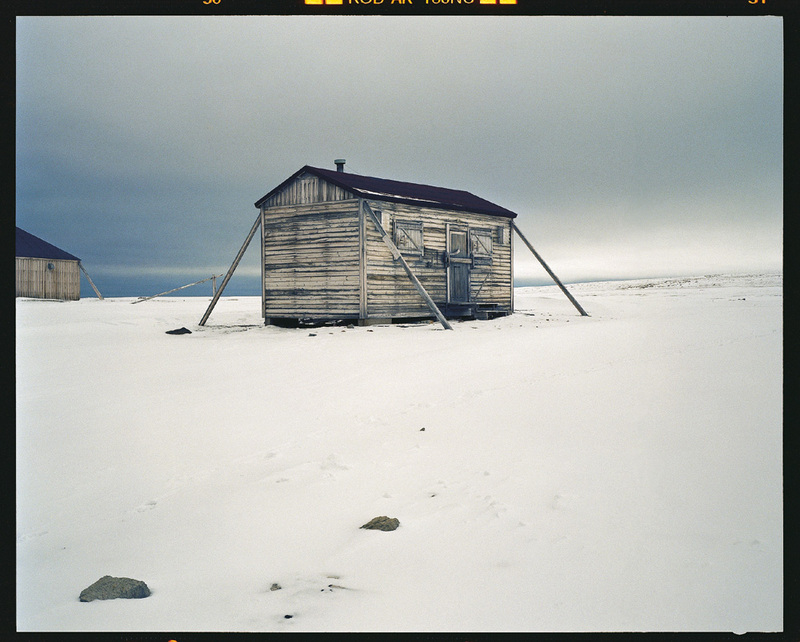 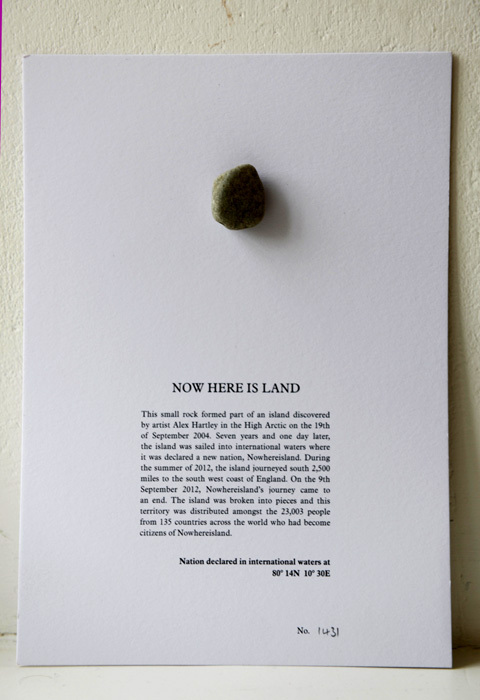 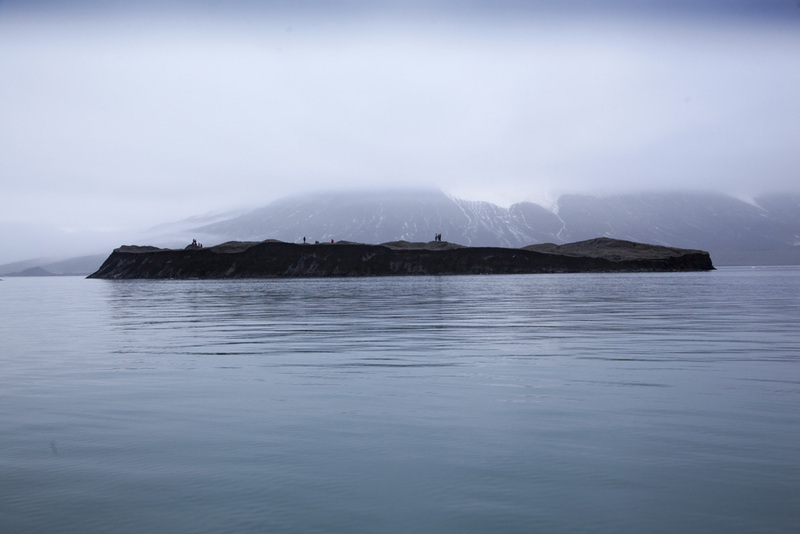 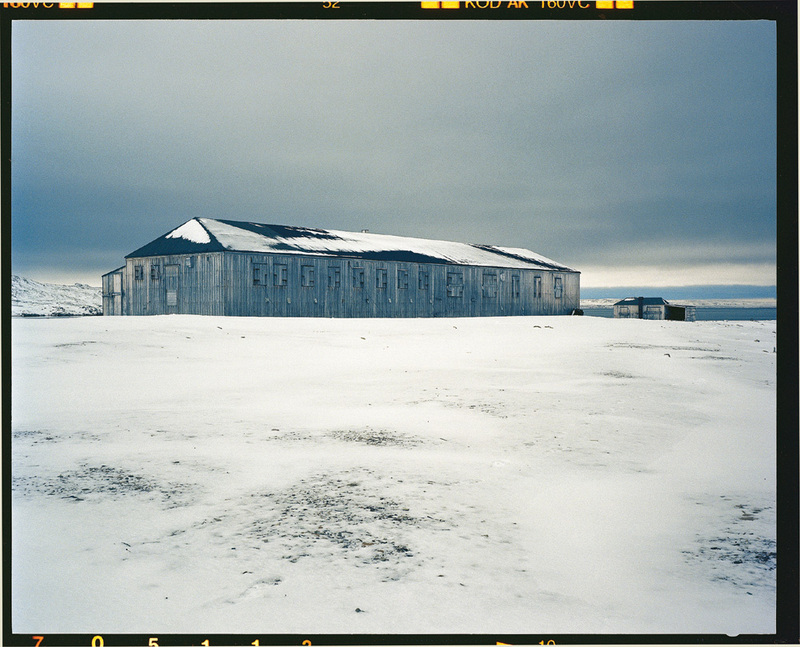 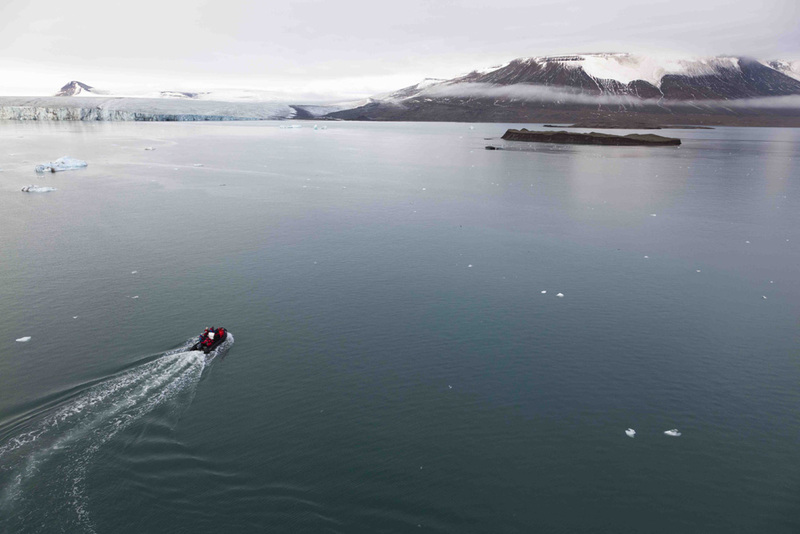 The ongoing work Nowhereisland has evolved over a 15-year period and resulted in a new nation being formed from a previously undiscovered island which Hartley had searched for and found in the High Arctic. 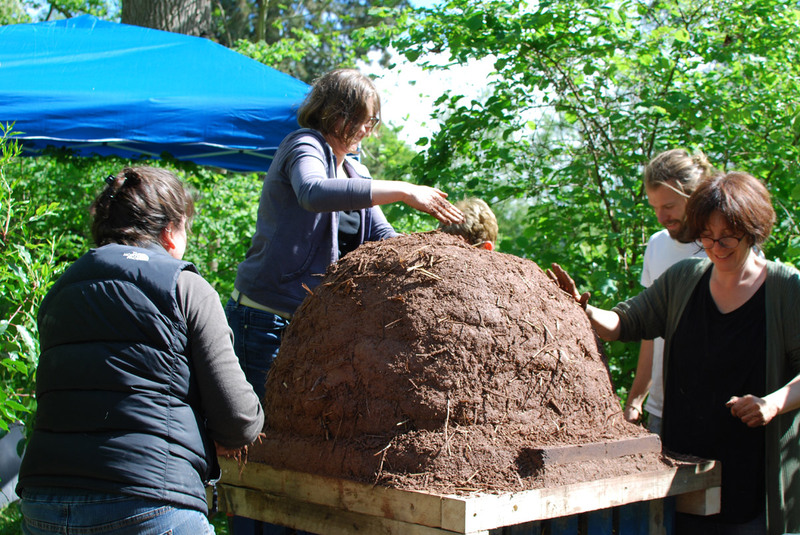 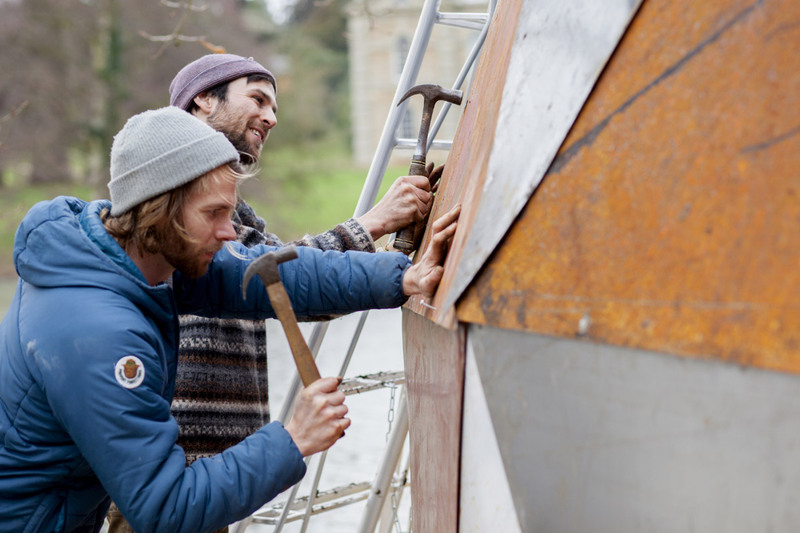 Durational works such as Dropper, Vigil, and The Clearing (with Tom James) have all involved the artist and groups of volunteers living within the artworks. 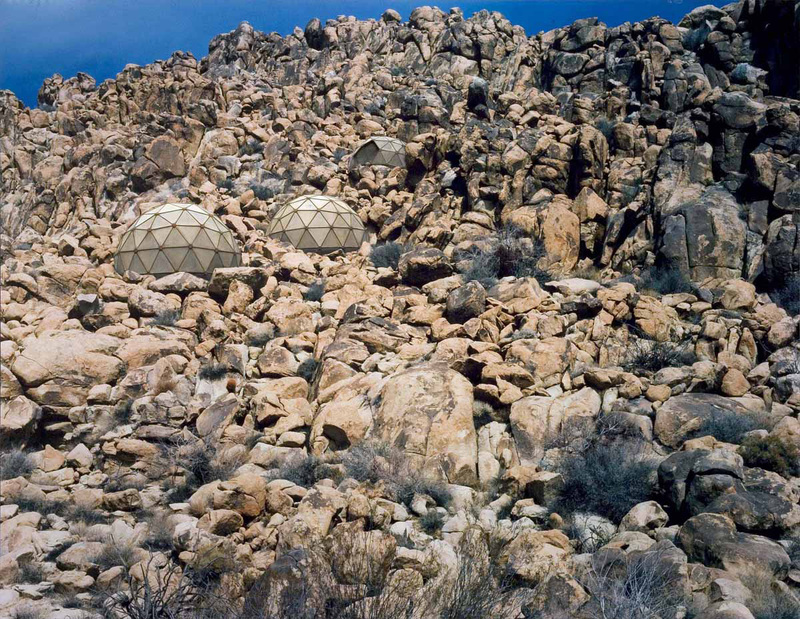 Hartley's work has been a sustained investigation into dystopian architecture, secular habitation, communal living and the construction of sanctuary as an inherent drive to form refuge from the world. 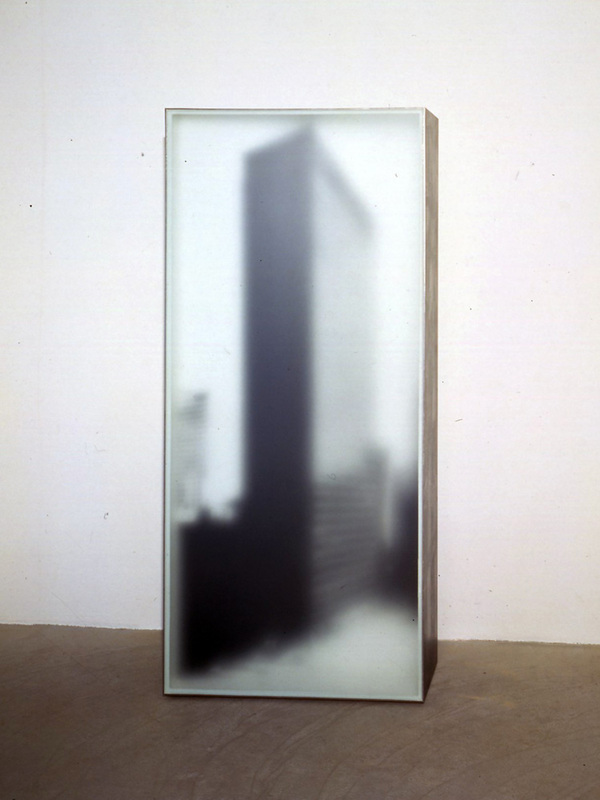 Architectural emblems of the counter culture movement are reconfigured or presented as ruins in large-scale installations that confuse place, purpose and context. 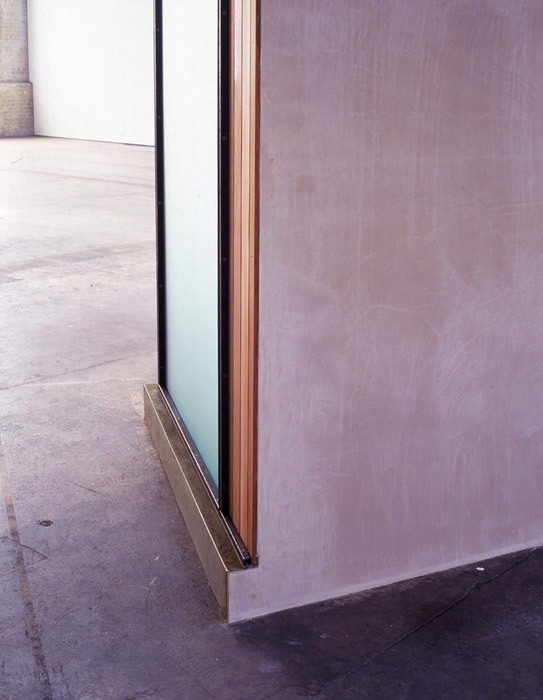 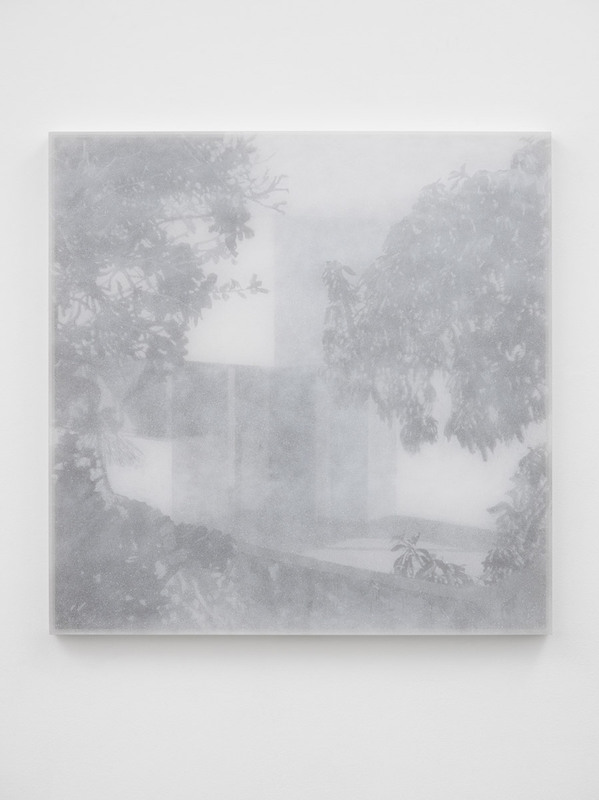 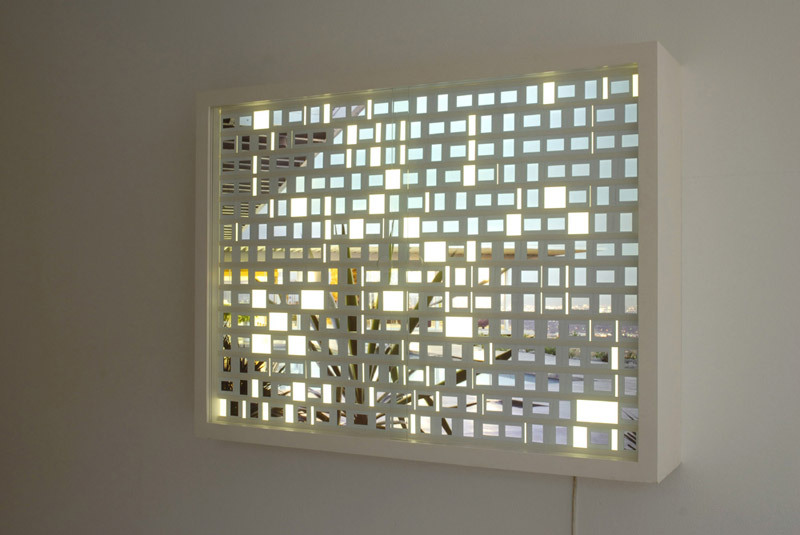 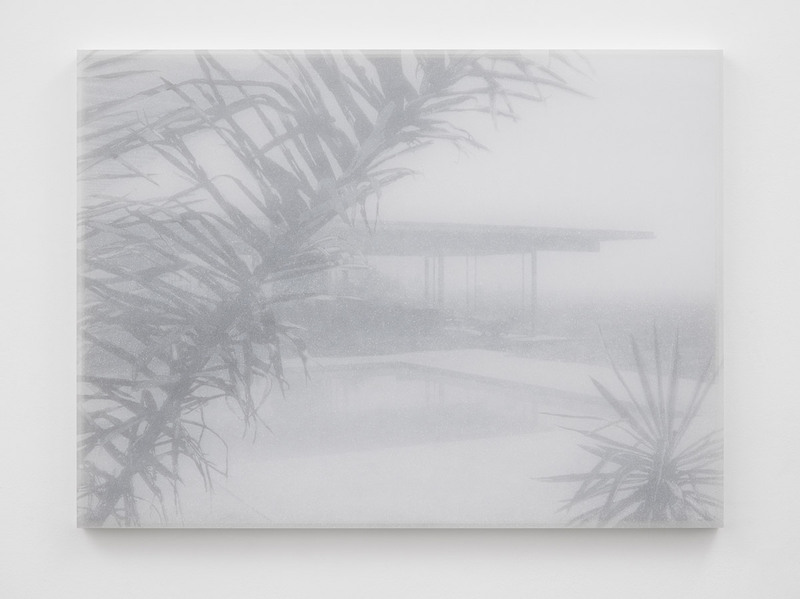 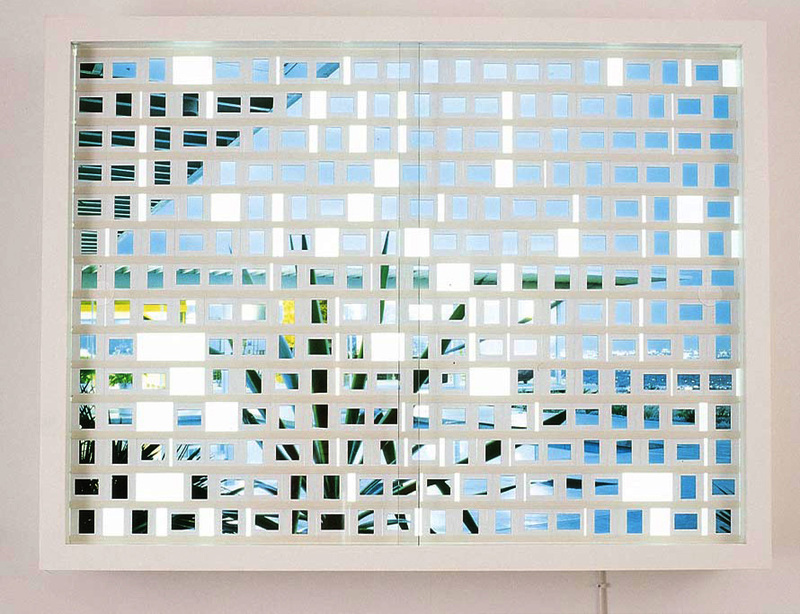 Similarly, in the wall-based series The Houses the idea of the boundary – between interior and exterior, private and public space, manmade and natural environments, two and three dimensions, object and image – is subject to constant re-evaluation. 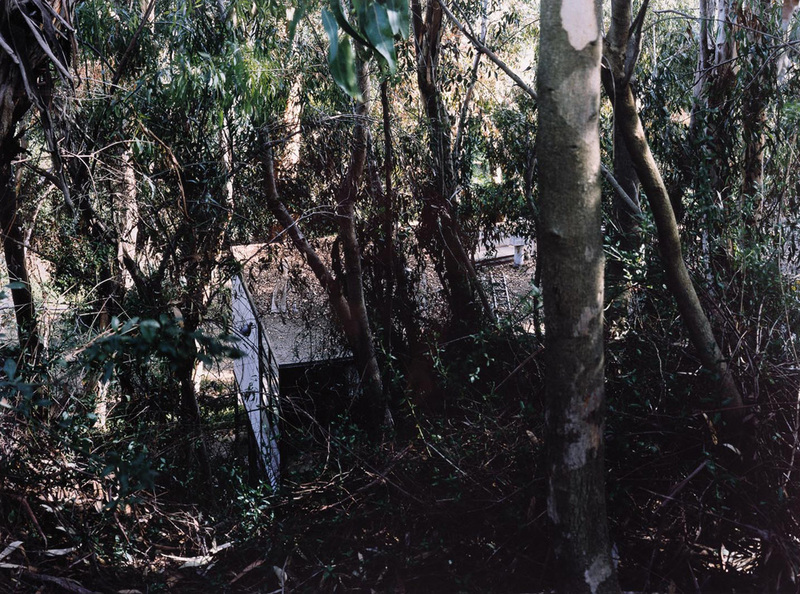 Narratives of entropy and decay are ever present. 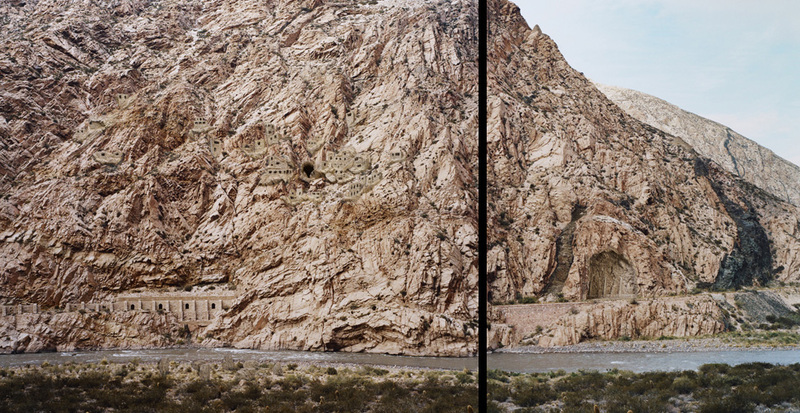 Bass-relief mixed-media architectural constructions physically inserted into large-scale landscape photographs. 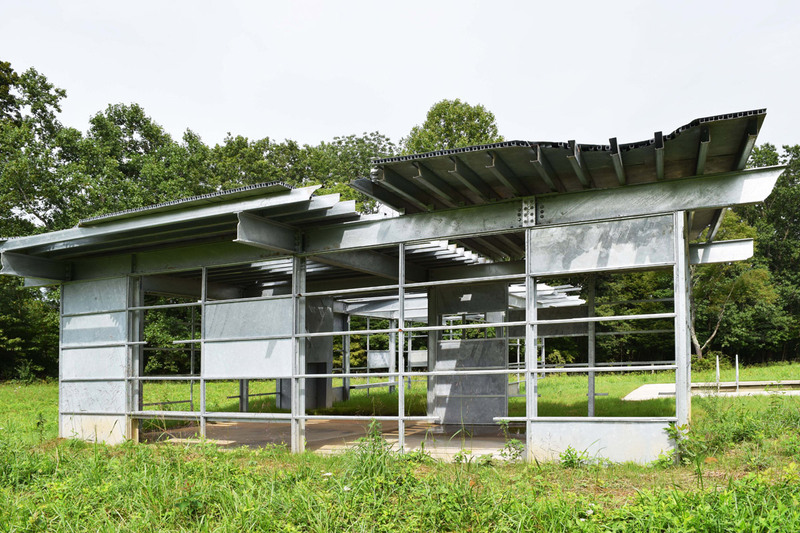 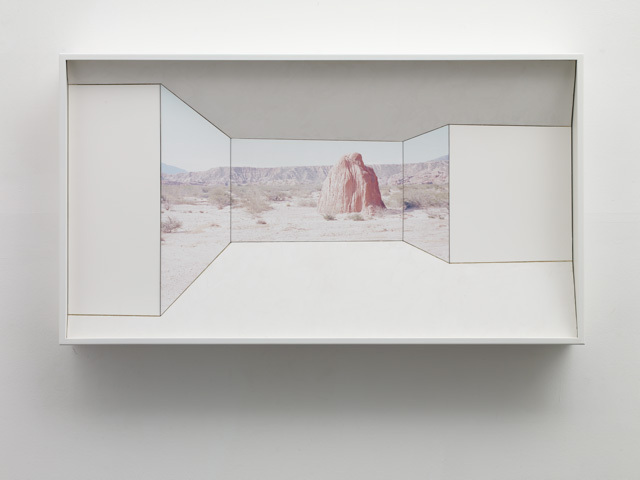 The architectural elements are imagined, fabricated and fixed through the photographic plane – penetrating the surface and protruding out from the landscape image. 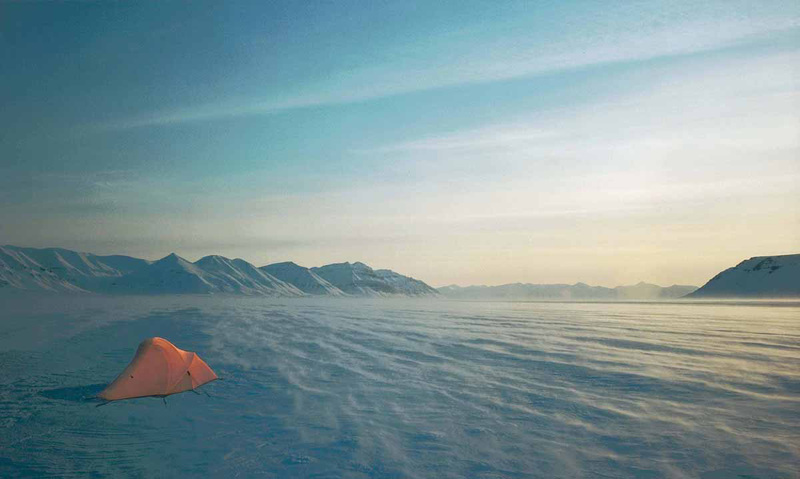 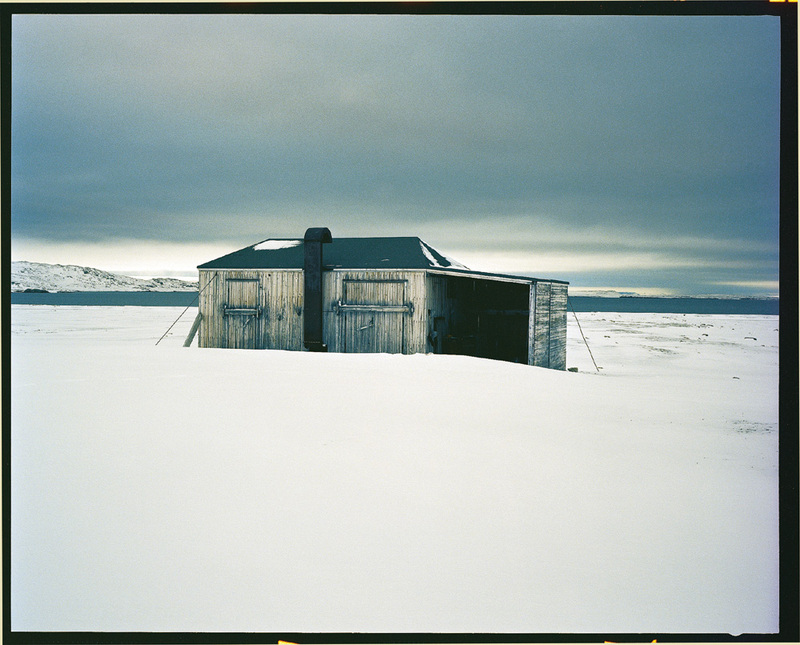 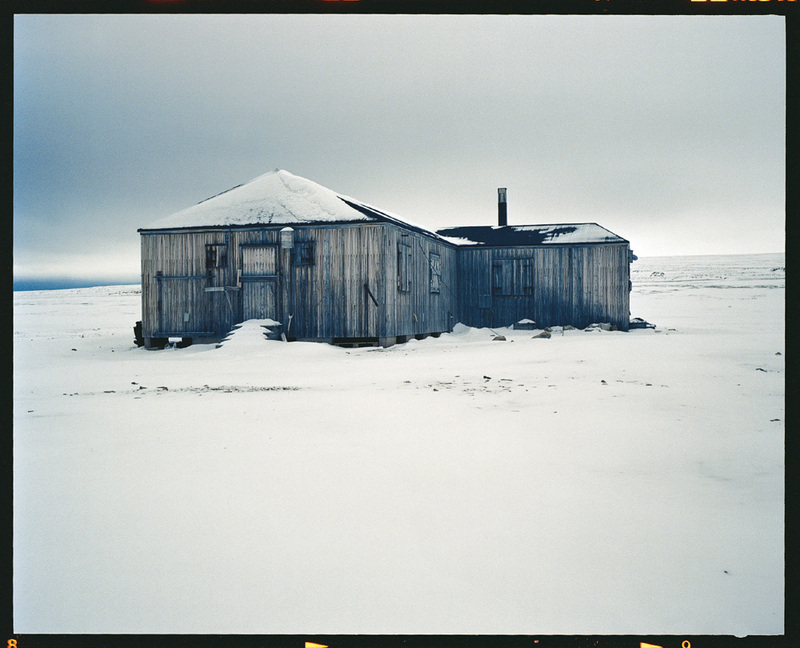 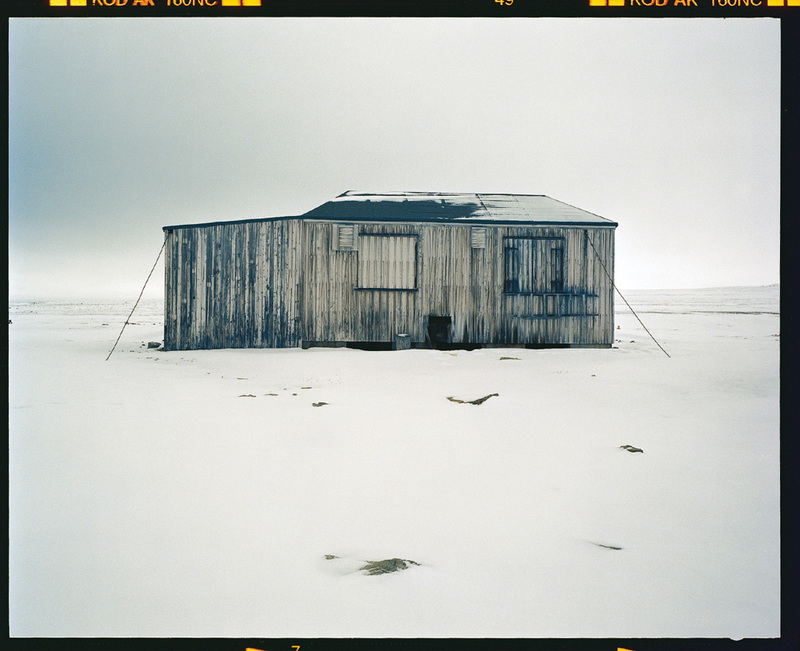 In 2004 Hartley went to the High Arctic where he searched for and discovered an island that had been revealed from within the melting ice of a retreating glacier. 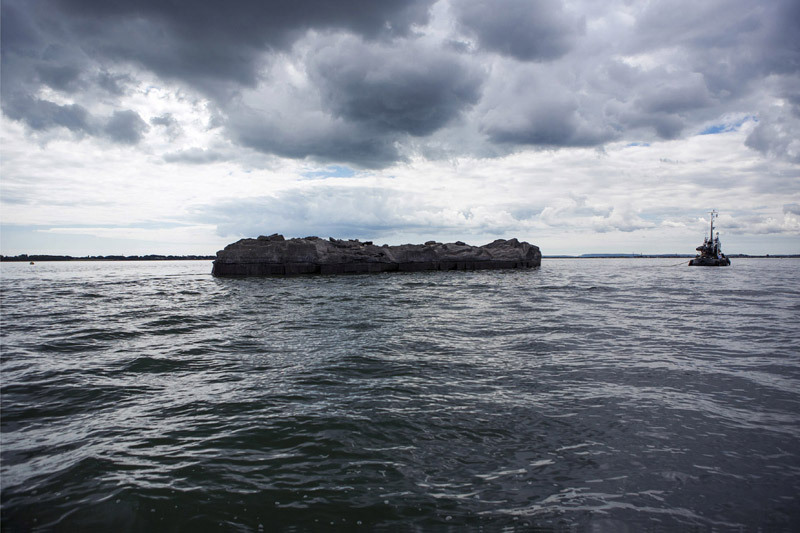 The island was taken out into International Waters where it was declared a new nation. 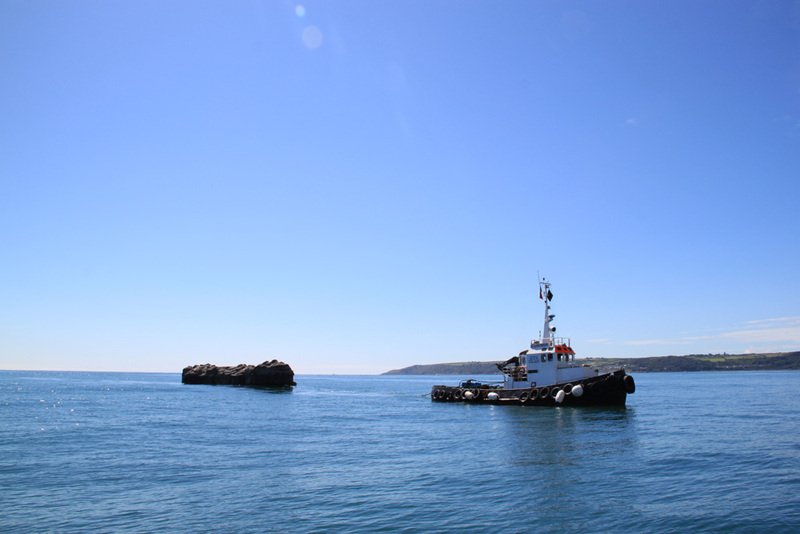 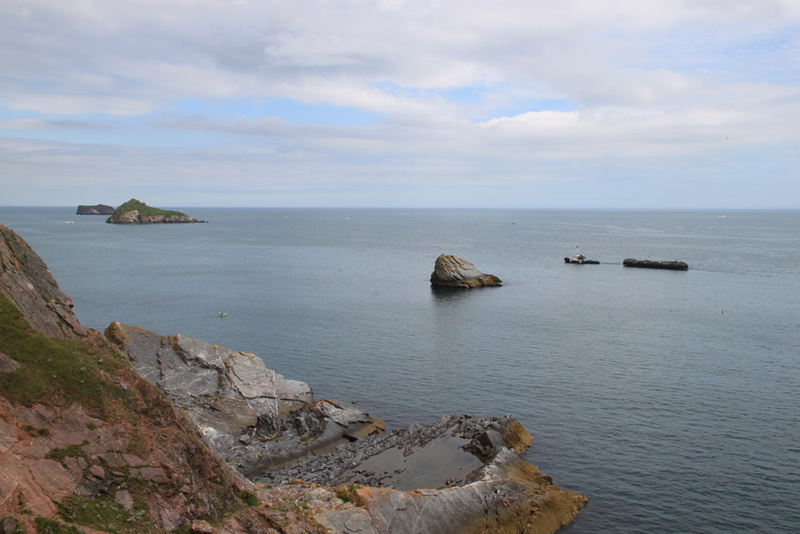 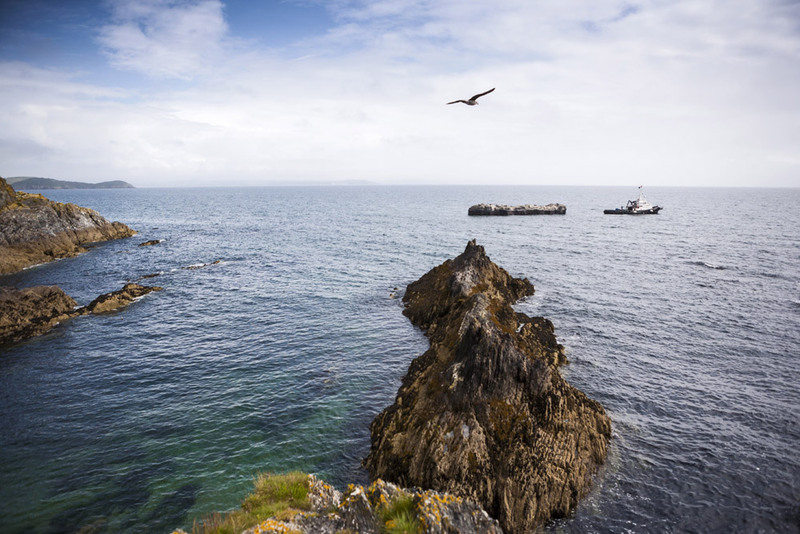 This new nation – Nowhereisland – was towed behind a tug around the South West coast of England during the 2012 Olympic Games. 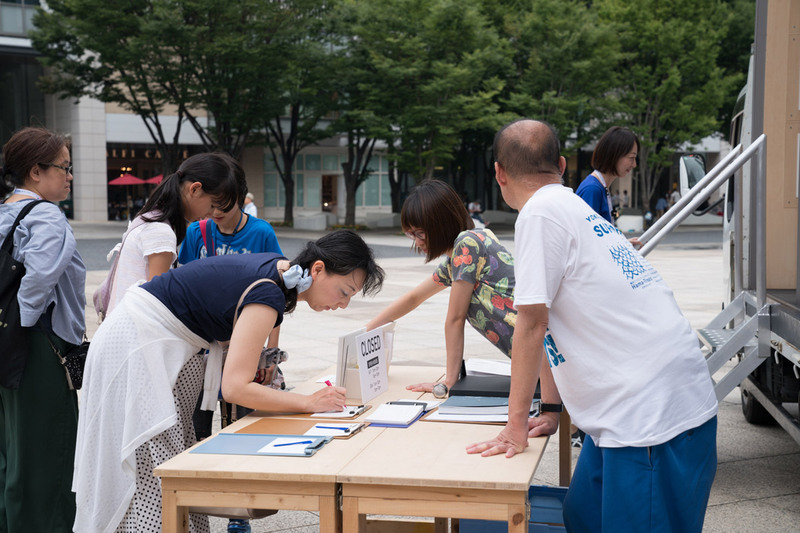 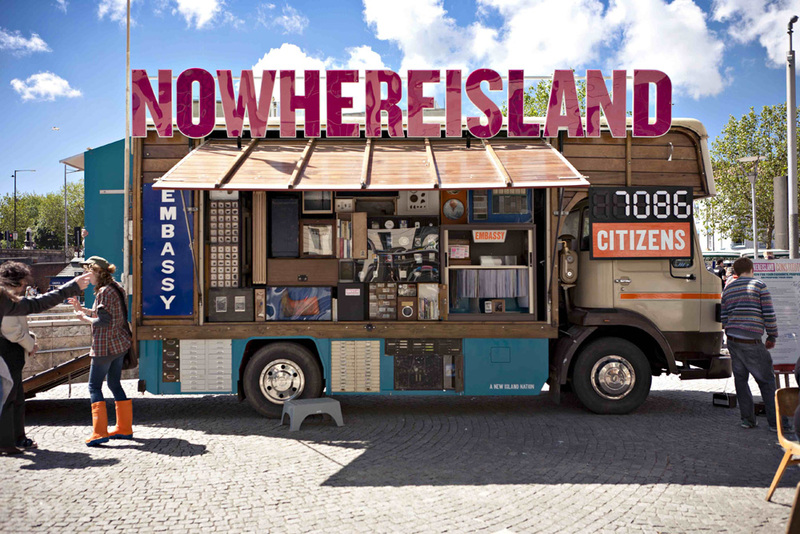 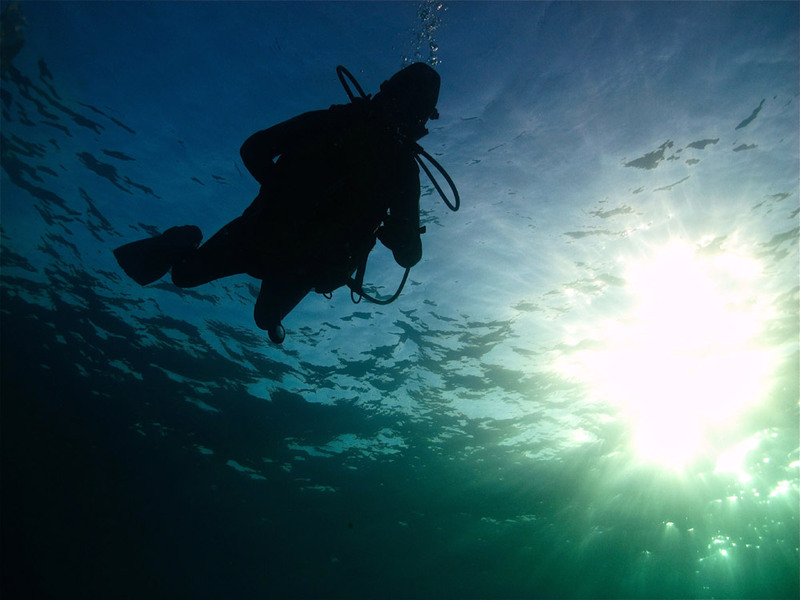 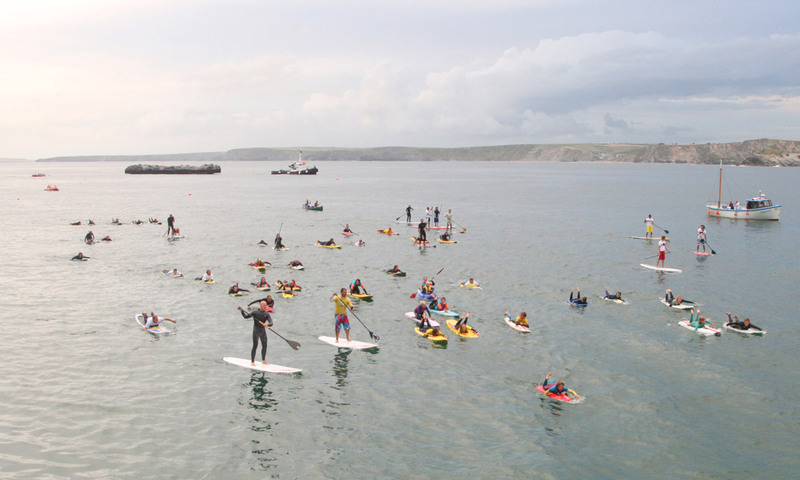 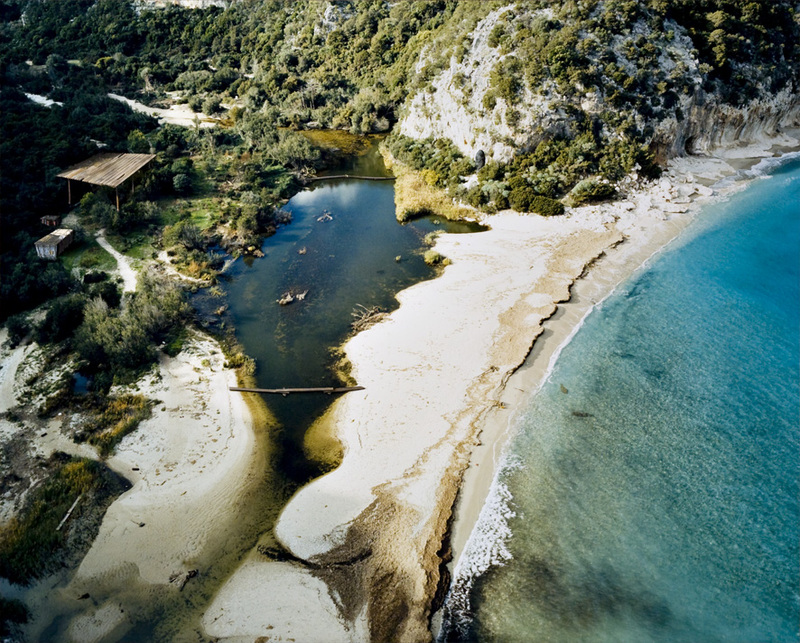 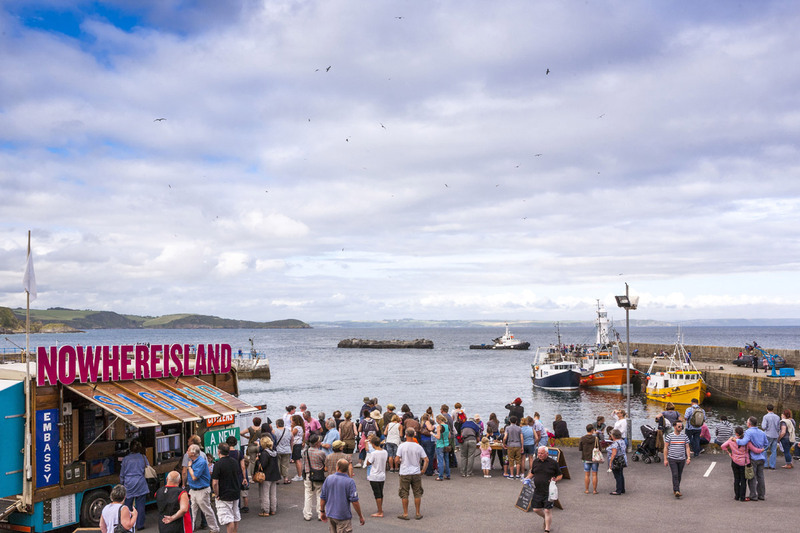 At the end of Nowhereisland's journey, in September 2012, the island was broken up and distributed amongst the 23,003 people from 135 countries who had signed up as "citizens of Nowhereisland". 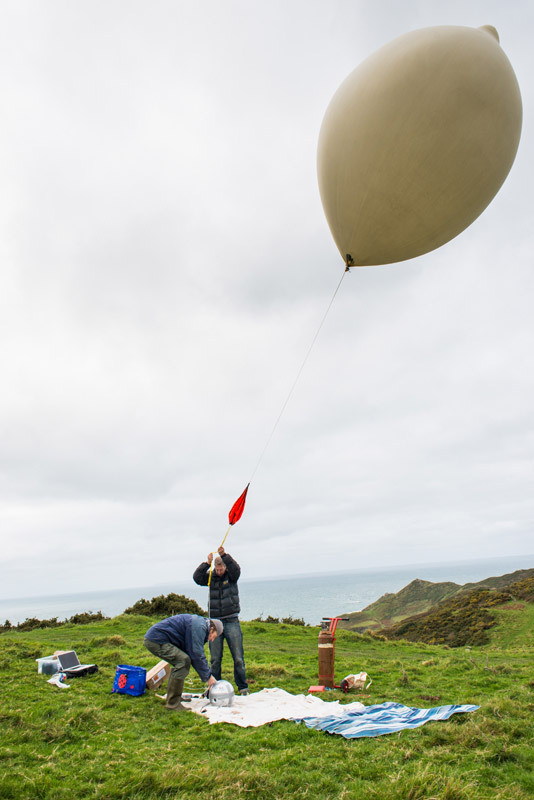 As a final gesture, a small piece of the island was sent to the edge of space where some particles of rock from the island will remain forever in the upper-stratosphere. 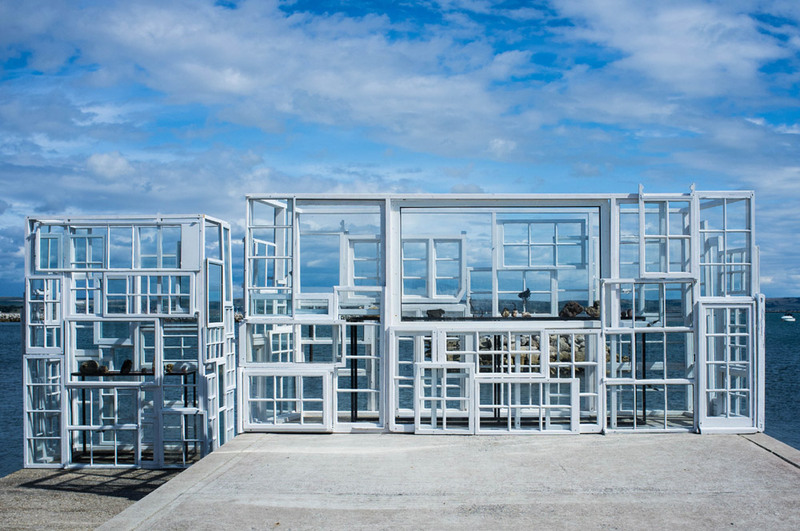 Folkestone Triennial 2014, Folkestone Kent. 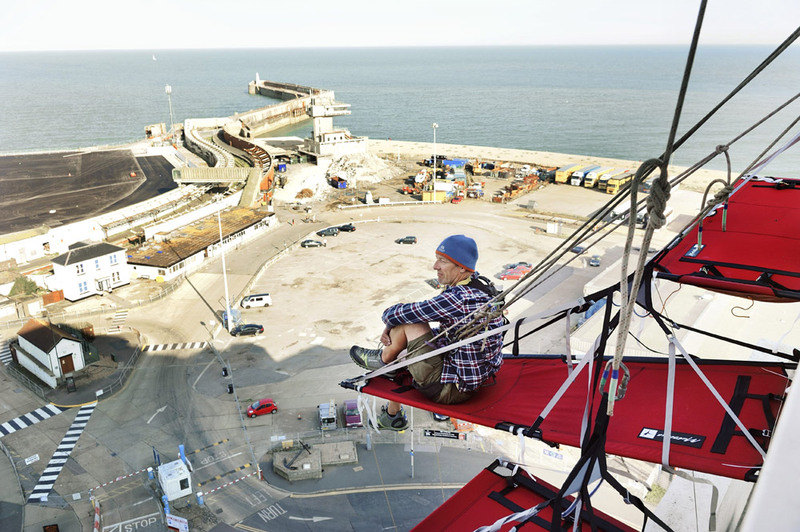 A precarious encampment was built on the outside a 13th floor window of the iconic Grand Burstin Hotel overlooking the town, harbour and the channel across to France. 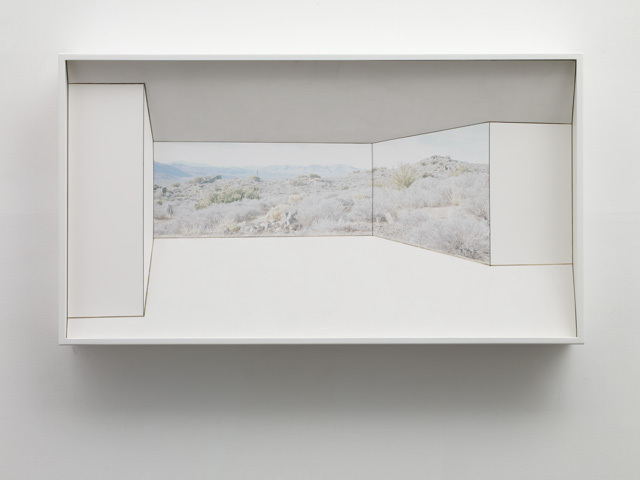 A single occupant maintains a watch over everything seen below for the nine week duration of the exhibition. 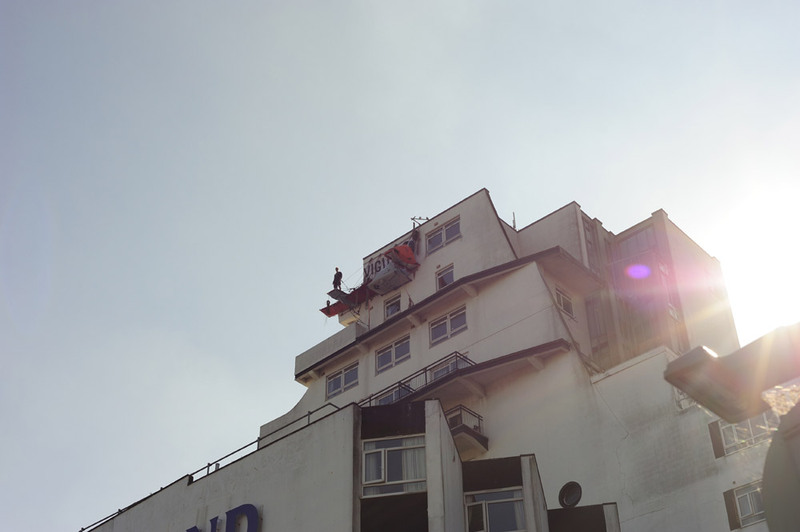 A parasitic building quoting a ship’s crow’s nest and the 1970’s rooftop protests of Strangeways prison and Greenpeace actions. 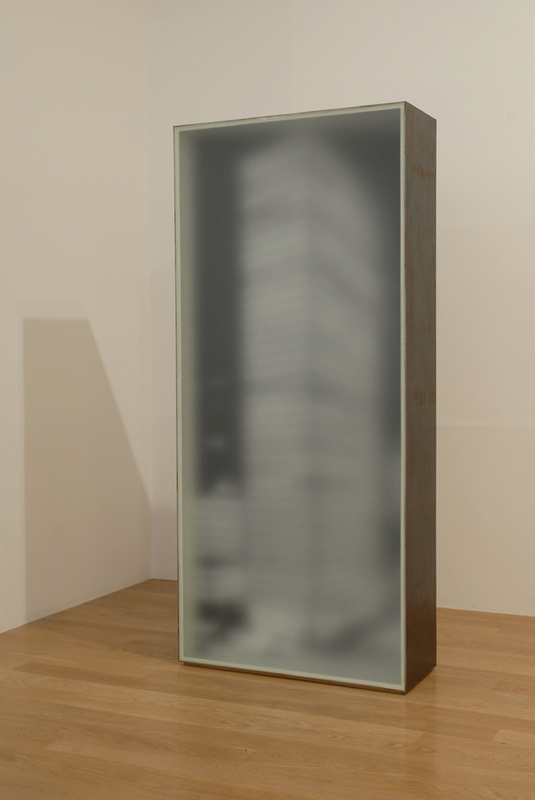 An hourly log of visible events was kept at www.vigil.org.uk. 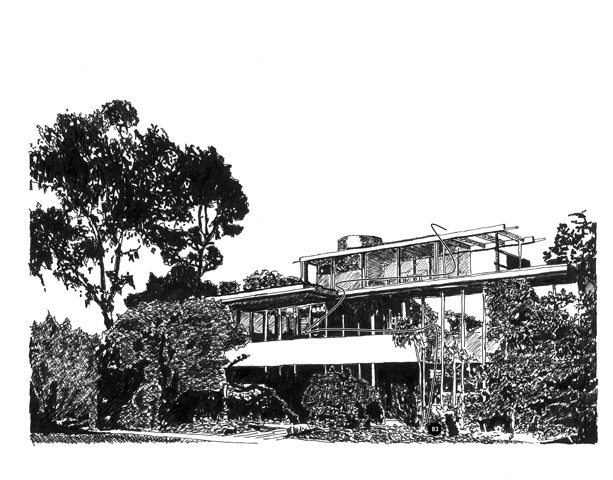 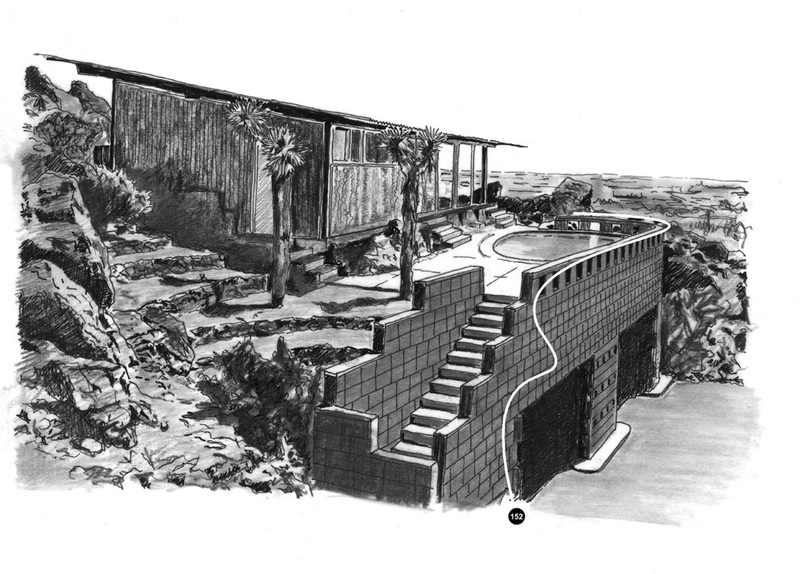 Based on Arts and Architecture magazine's experiments in American residential architecture during the 50's and 60's. 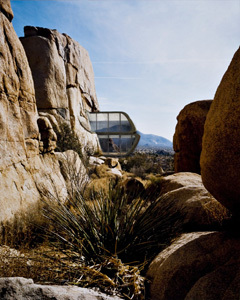 Case Study is a slice of 1:1 scale architecture with an etched glass façade obscuring an interior with a desert view beyond. 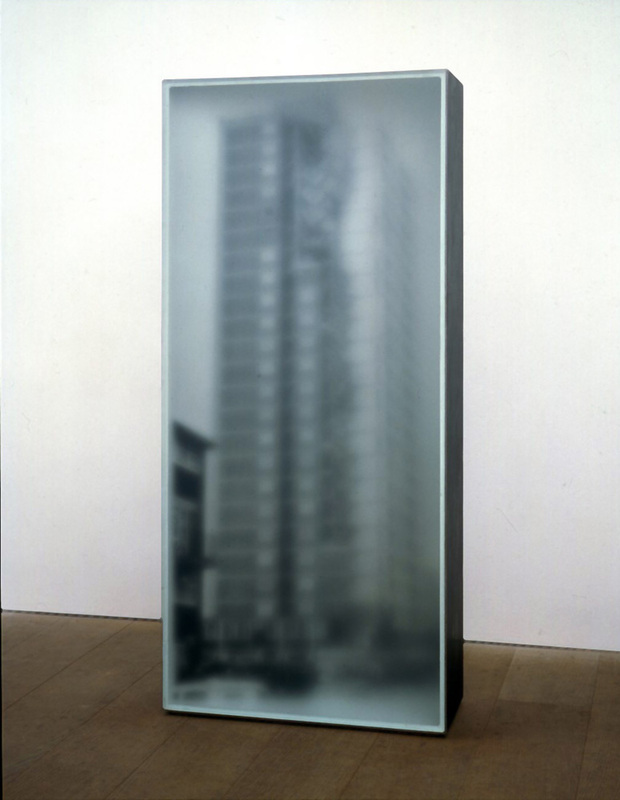 As with the Etched Glass works, the image takes on a very real dramatic three-dimensional appearance, which contrasts with the sculptural rear and side views of the work. 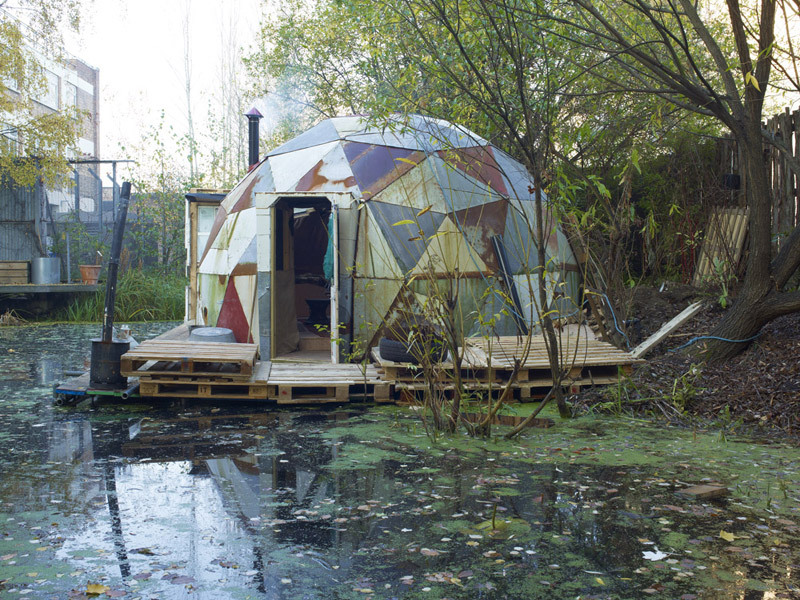 Dropper is a recreation of a "Drop City" dome. 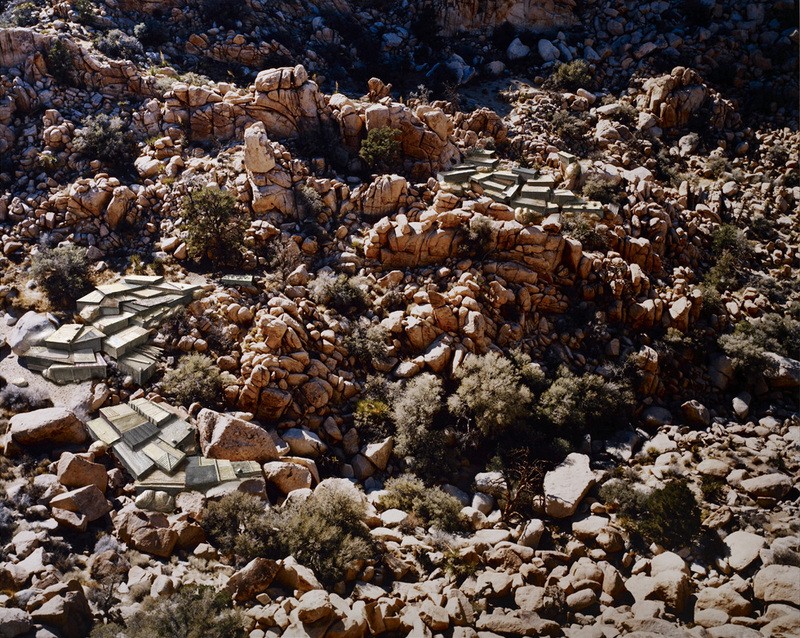 For a brief five-year period in the mid 60's, Drop City was an artist's community in Colorado that became a symbol of the hippy movement. 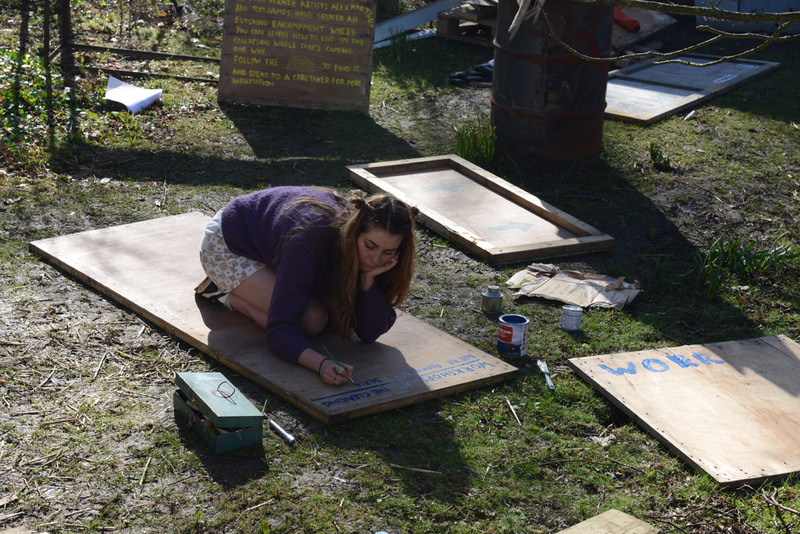 The community disintegrated and broke apart amid tensions exacerbated by the 'no rules' policy. 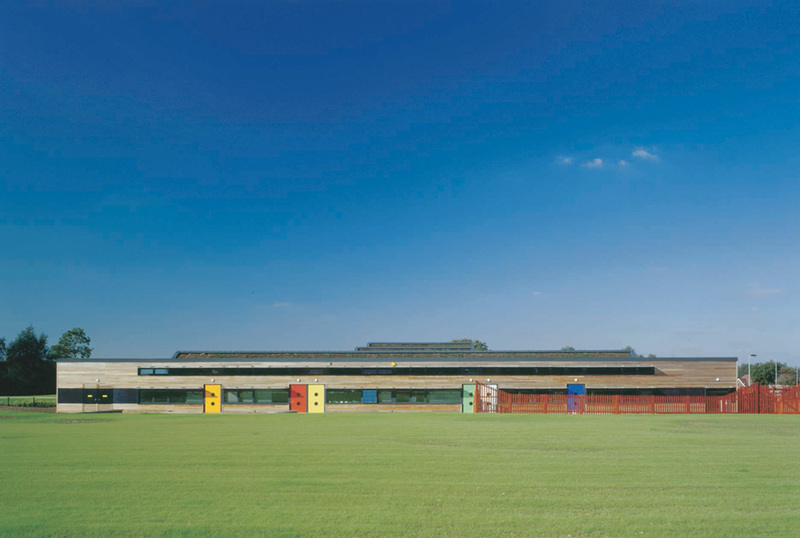 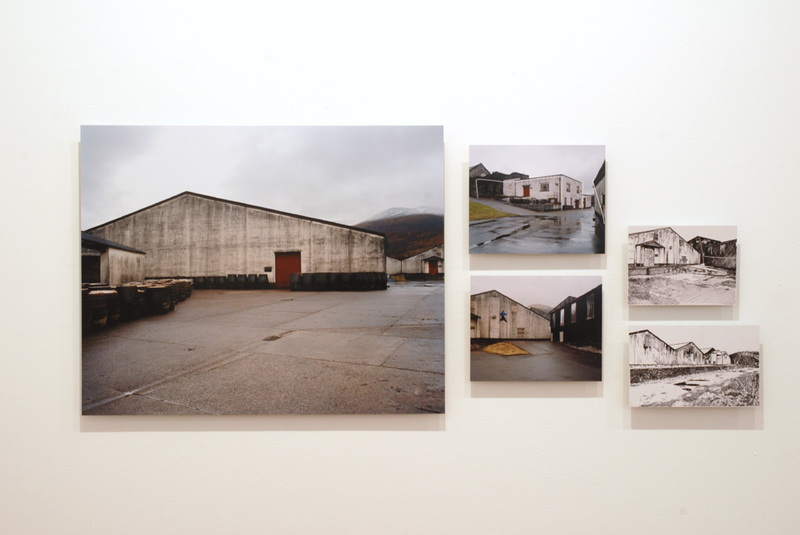 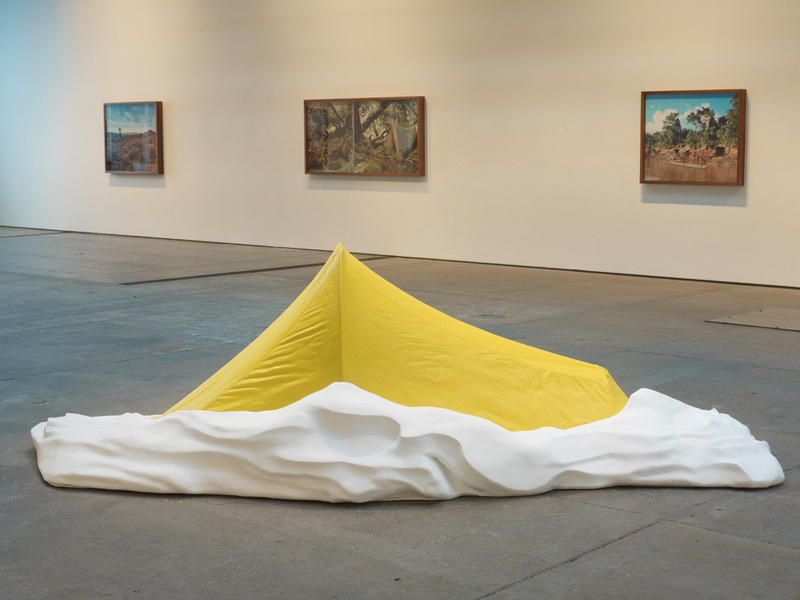 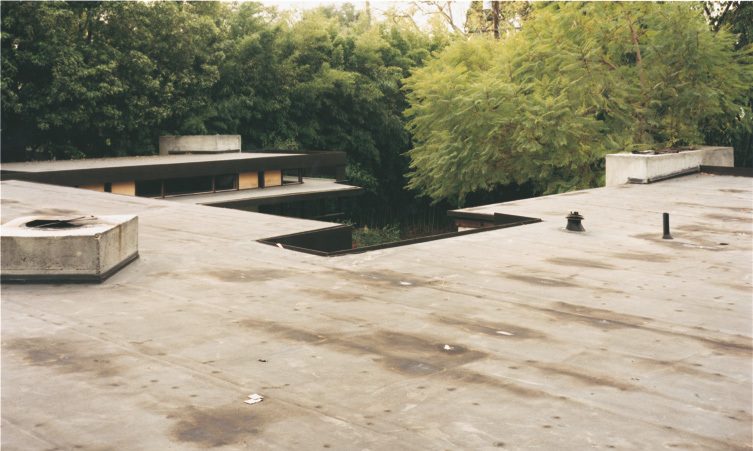 Fabricated from the roofs and bonnets of cars, Hartley lived in Dropper during its two months at the Victoria Miro Gallery, and at various other locations. 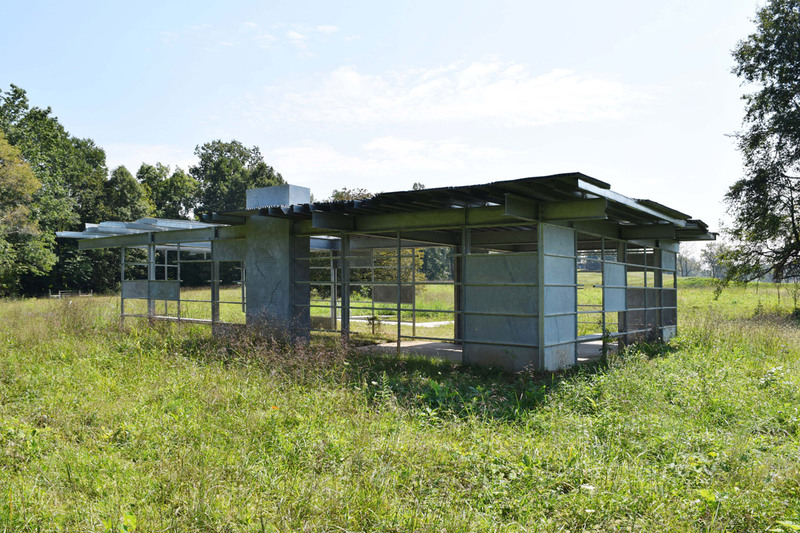 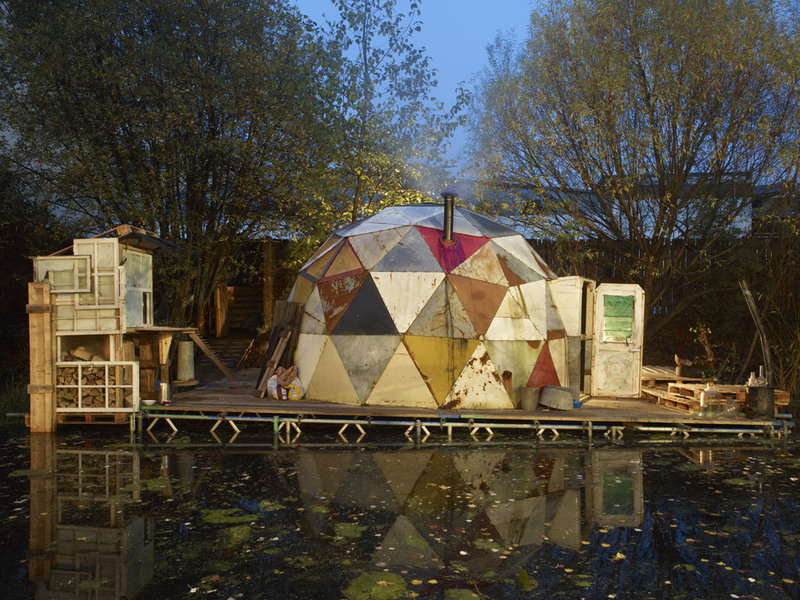 Dropper was donated to the Occupy movement in 2011, but in parallel to the breakup of Drop City, it contributed to the collapse of the camp by creating a hierarchy amongst the tented dwellings. 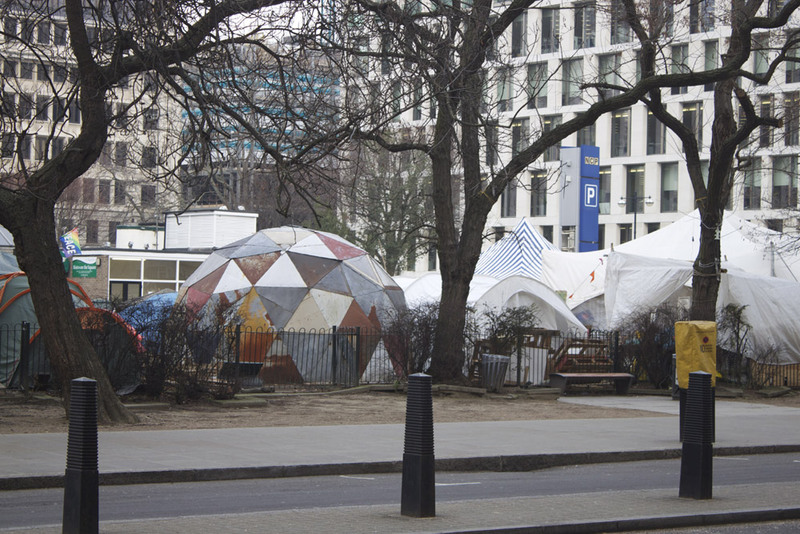 Intended as a meeting forum by Occupy it was eventually taken over as a flop house. 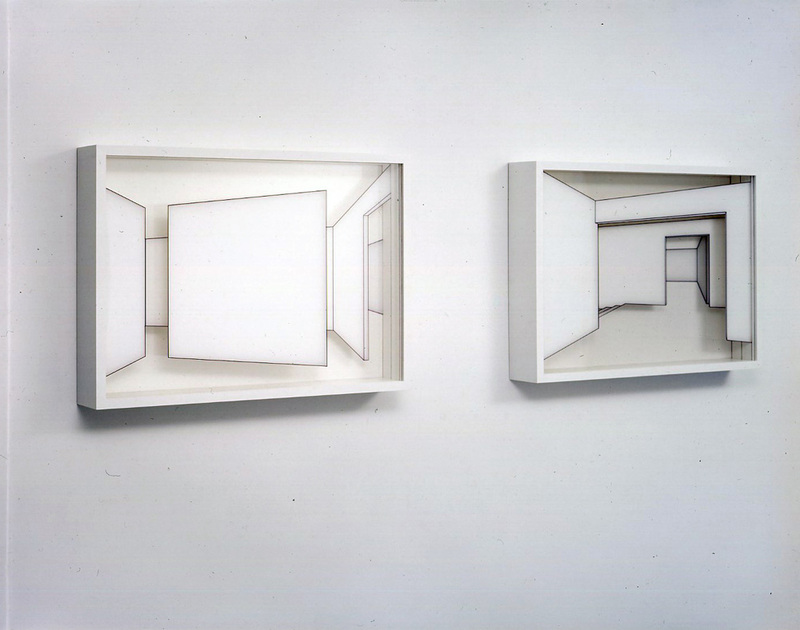 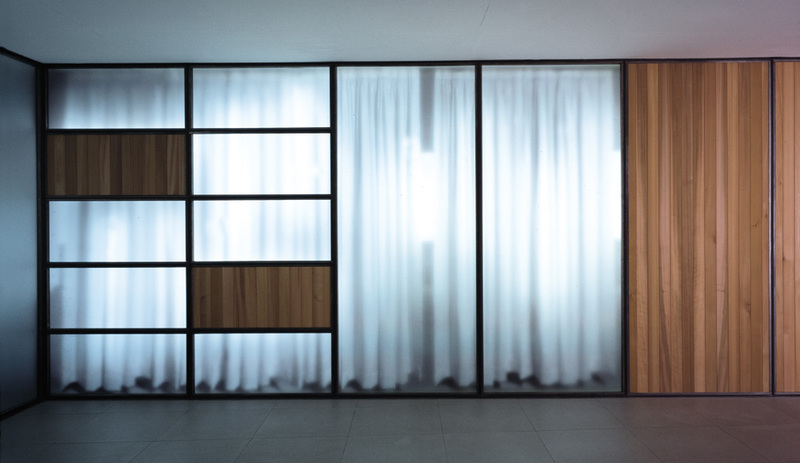 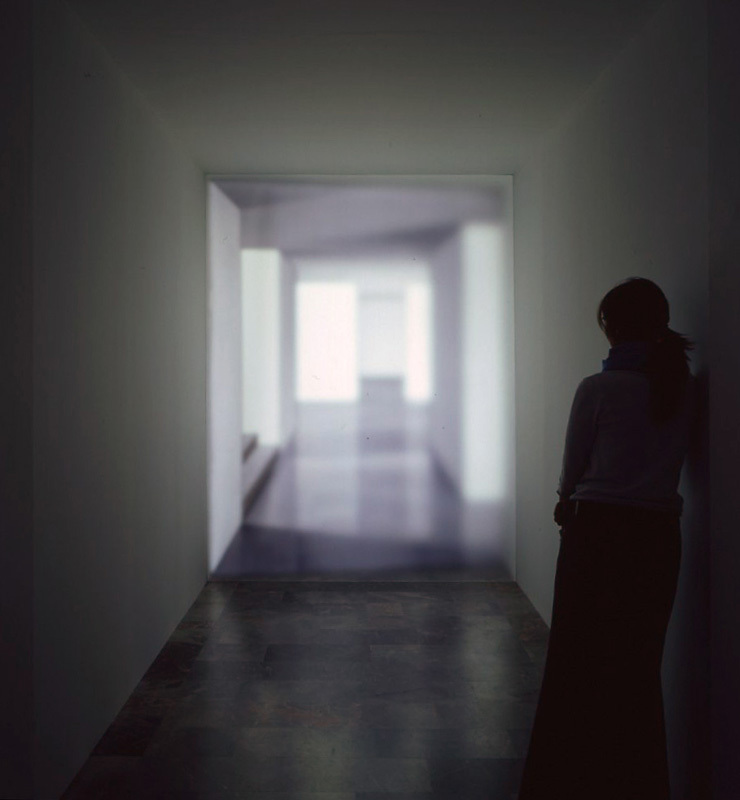 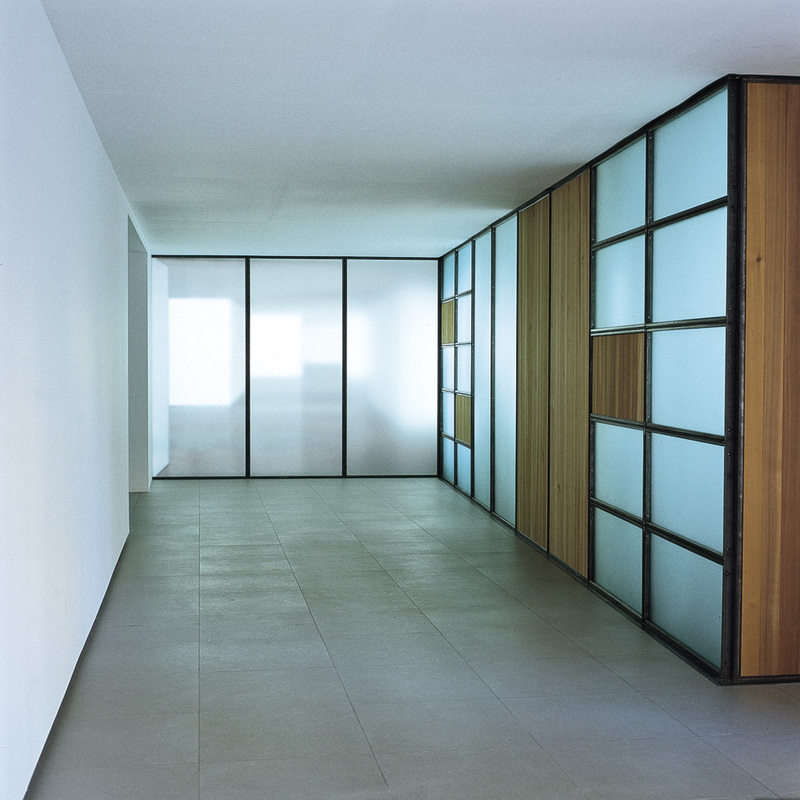 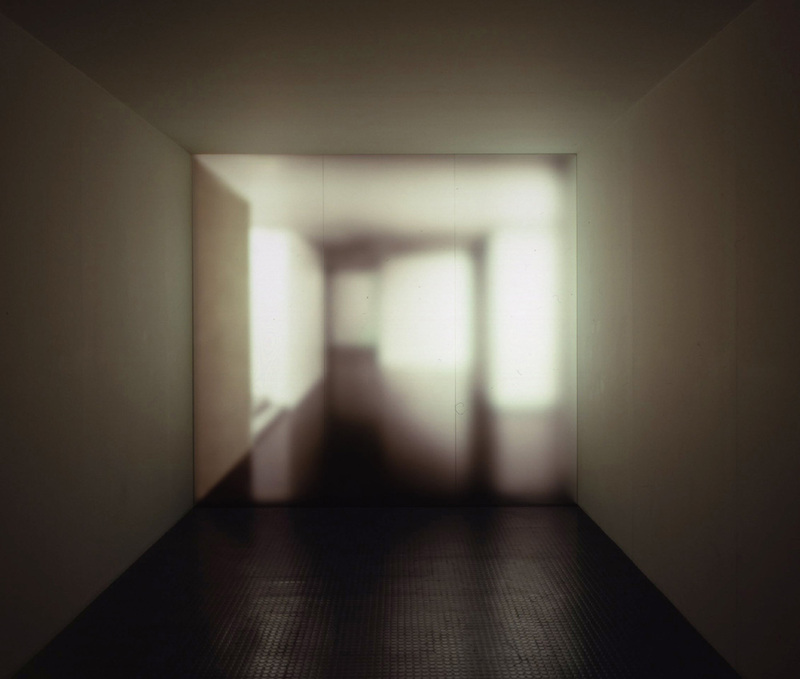 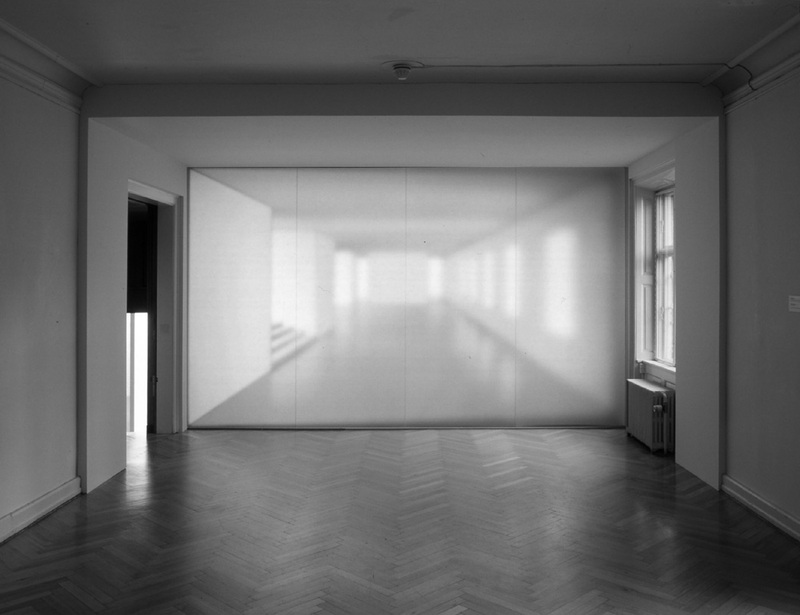 Photographs of models of minimal interior spaces are brought to life when viewed through their etched glass containers. 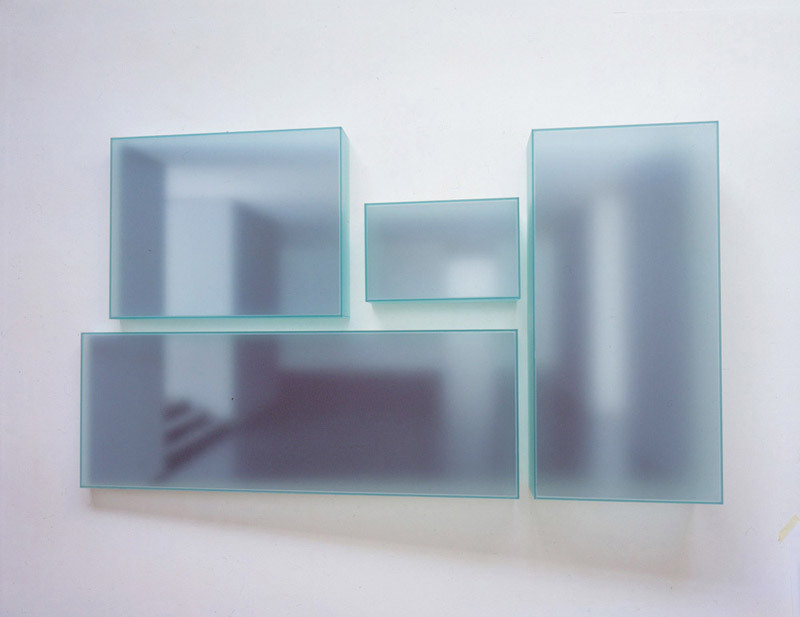 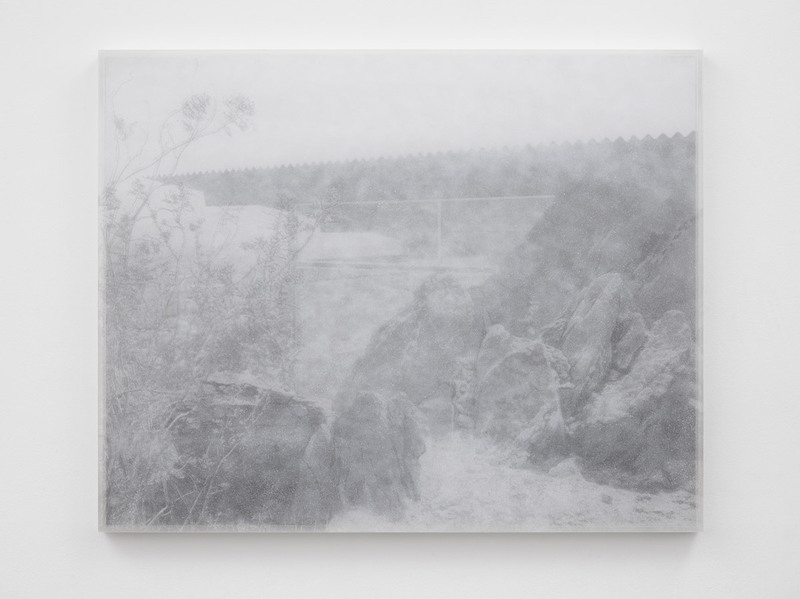 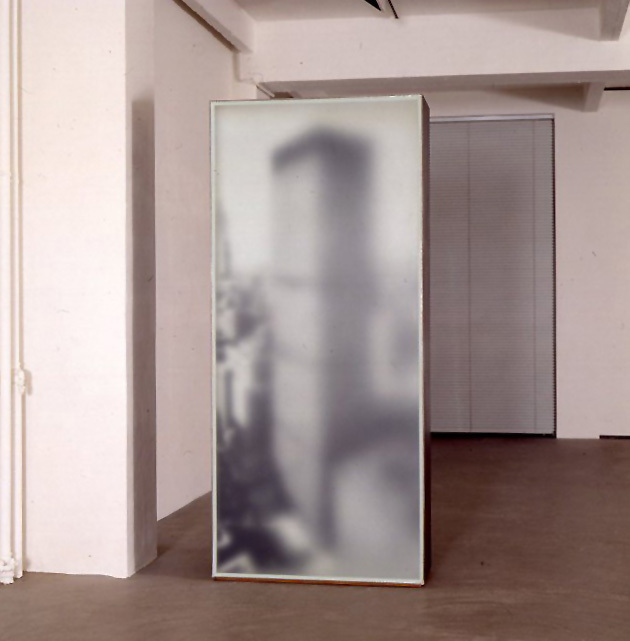 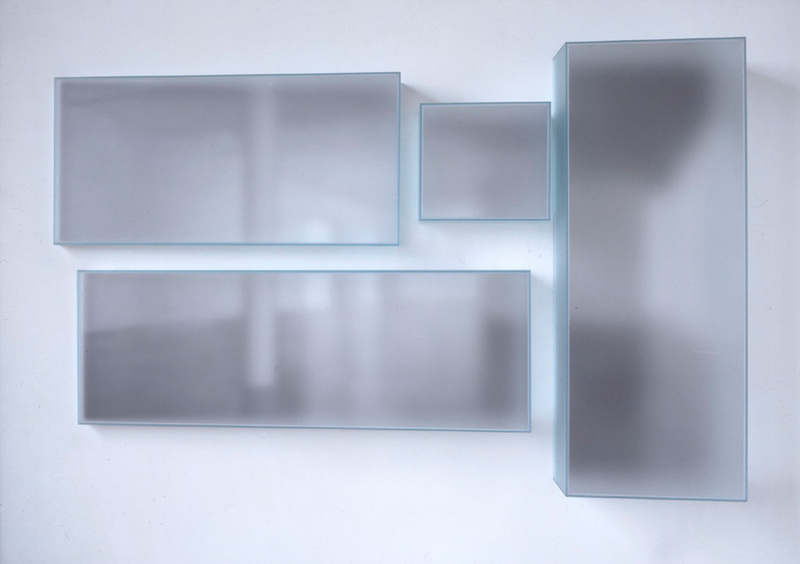 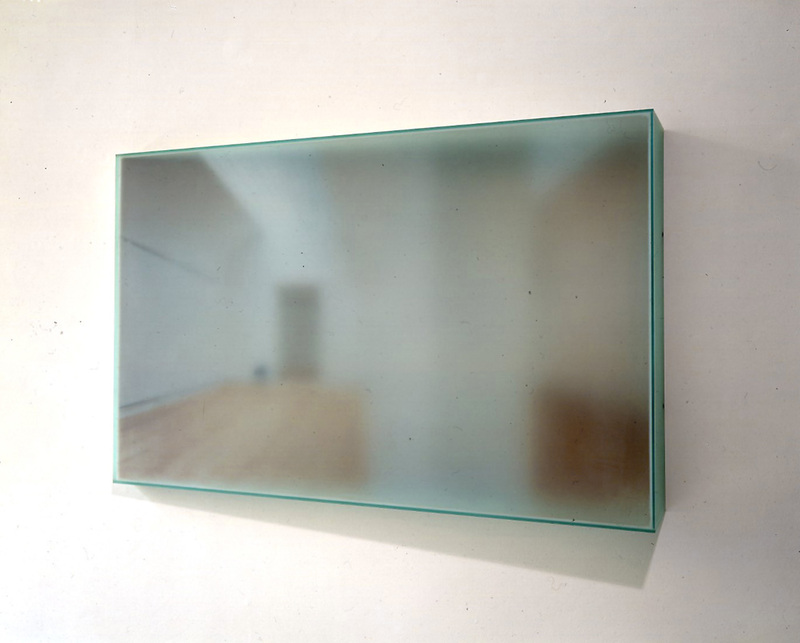 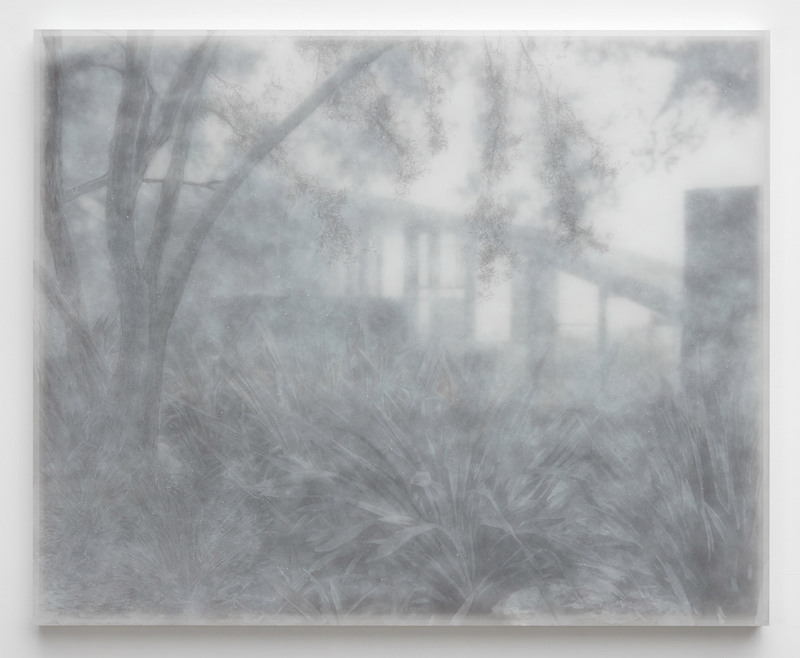 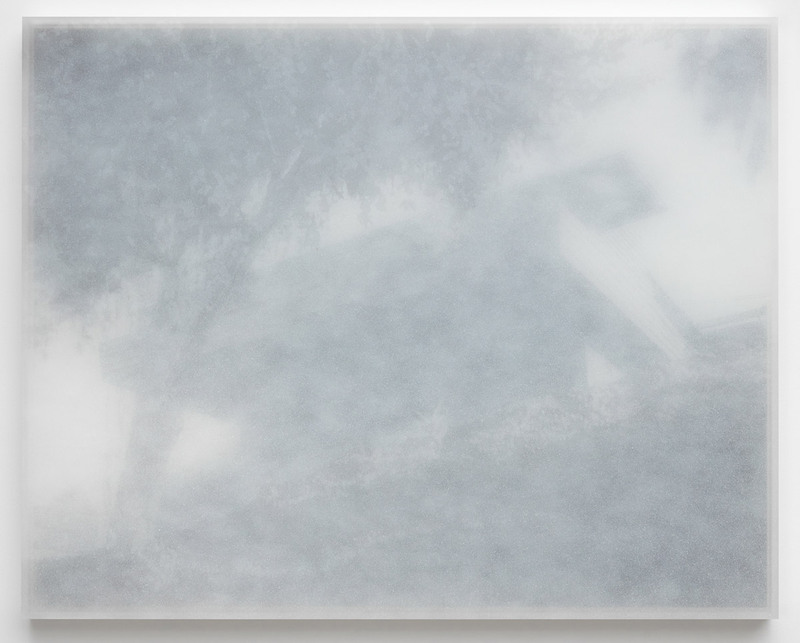 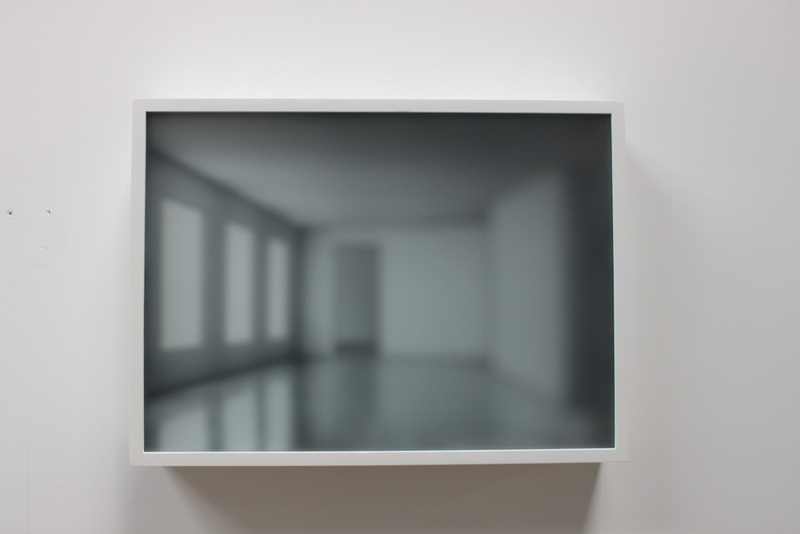 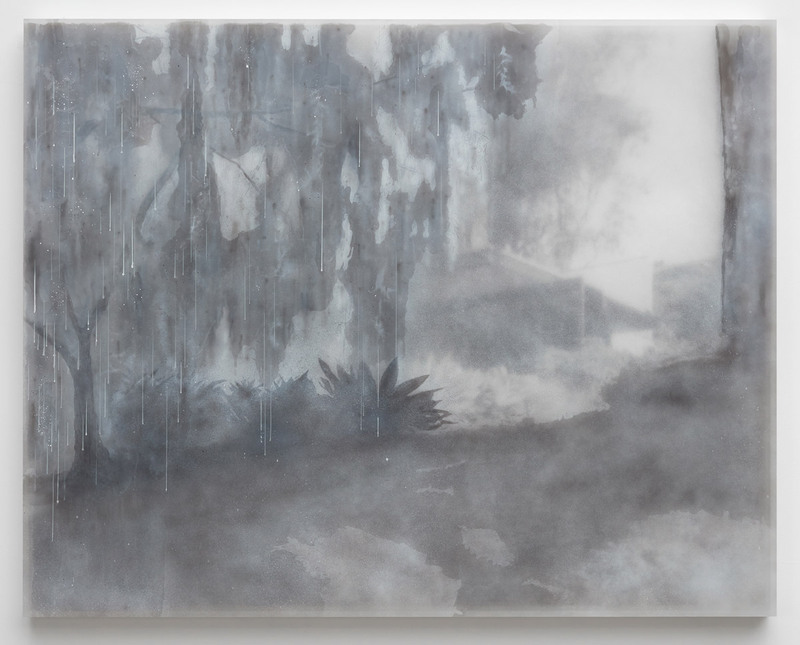 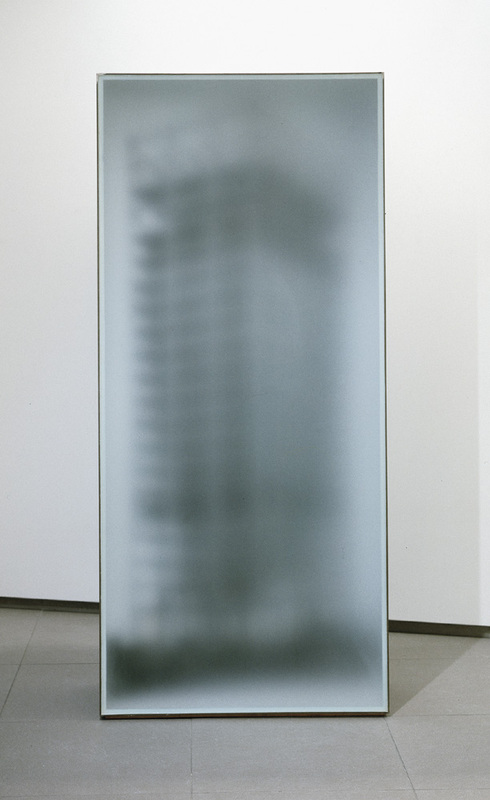 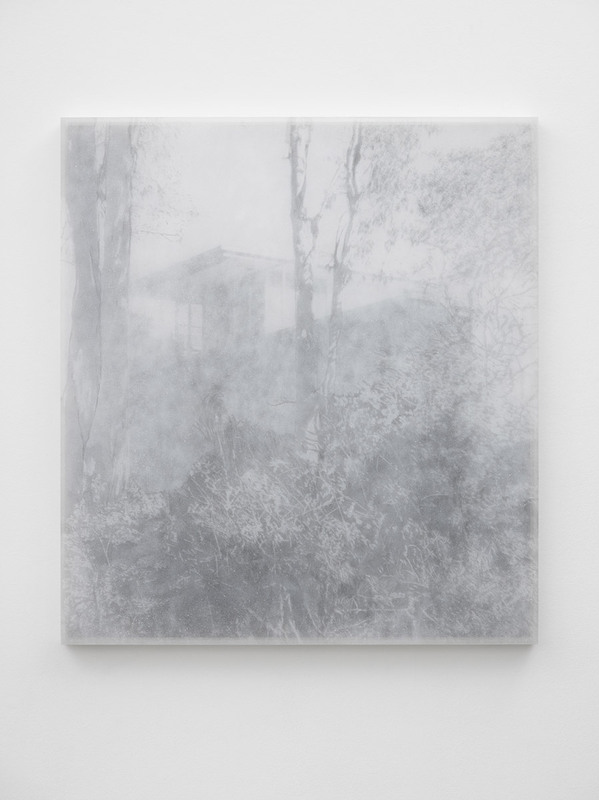 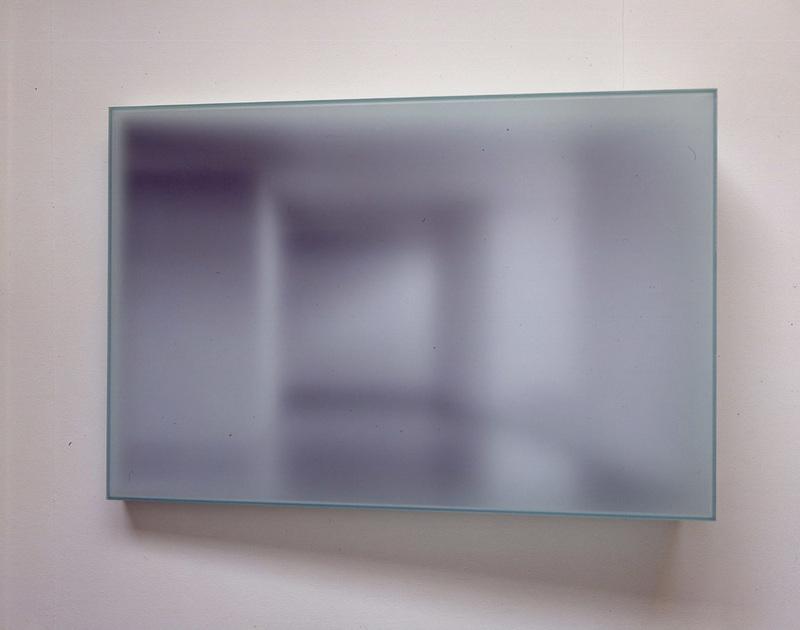 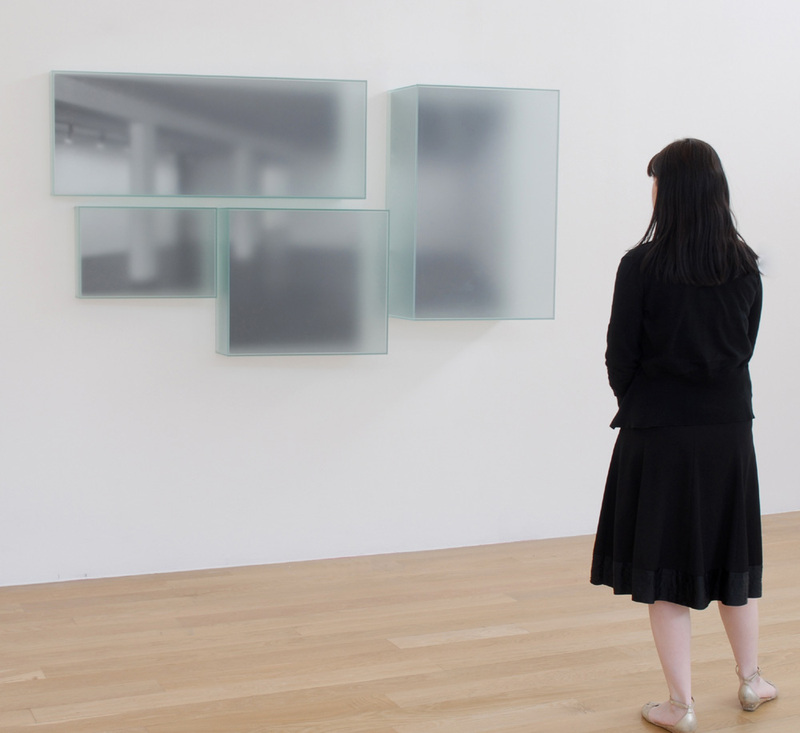 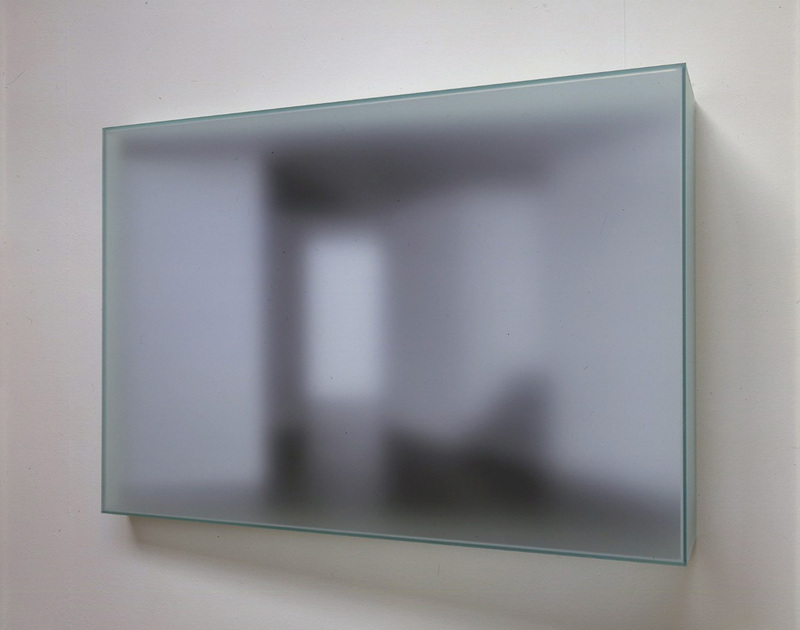 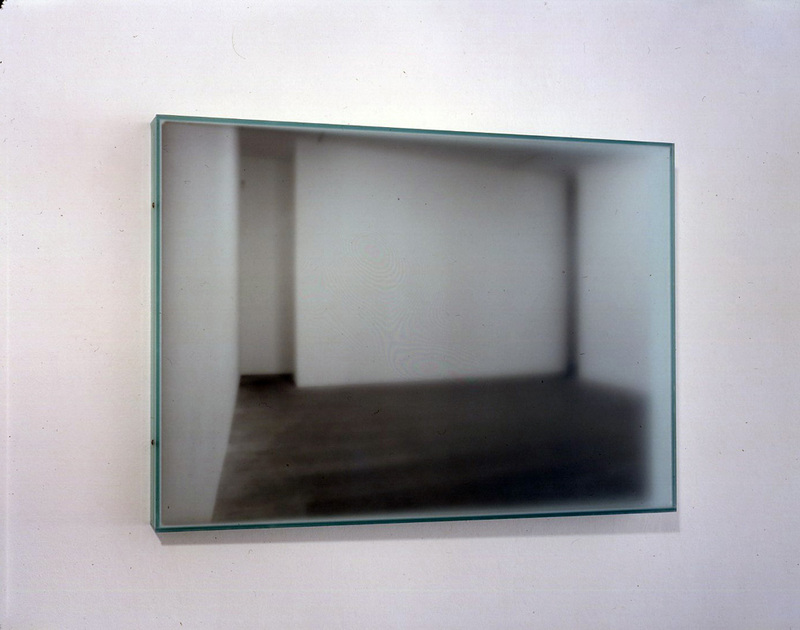 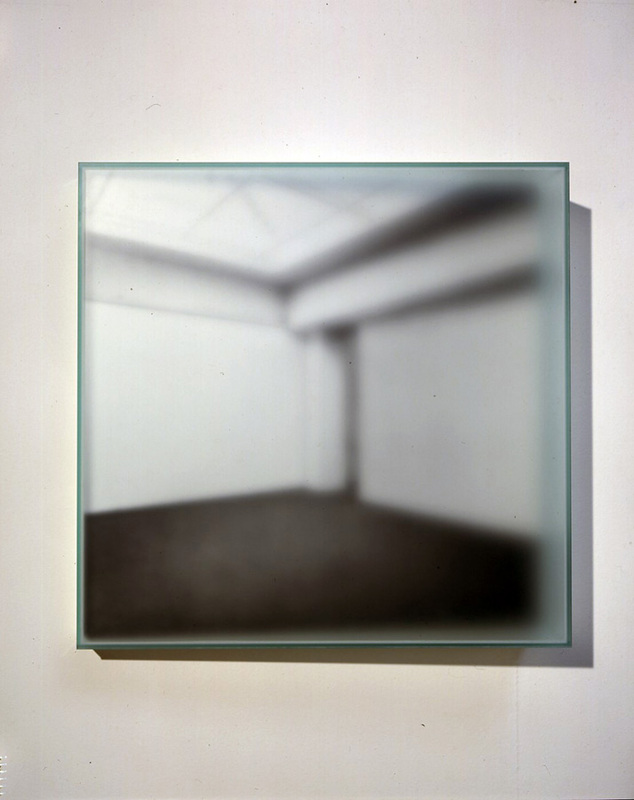 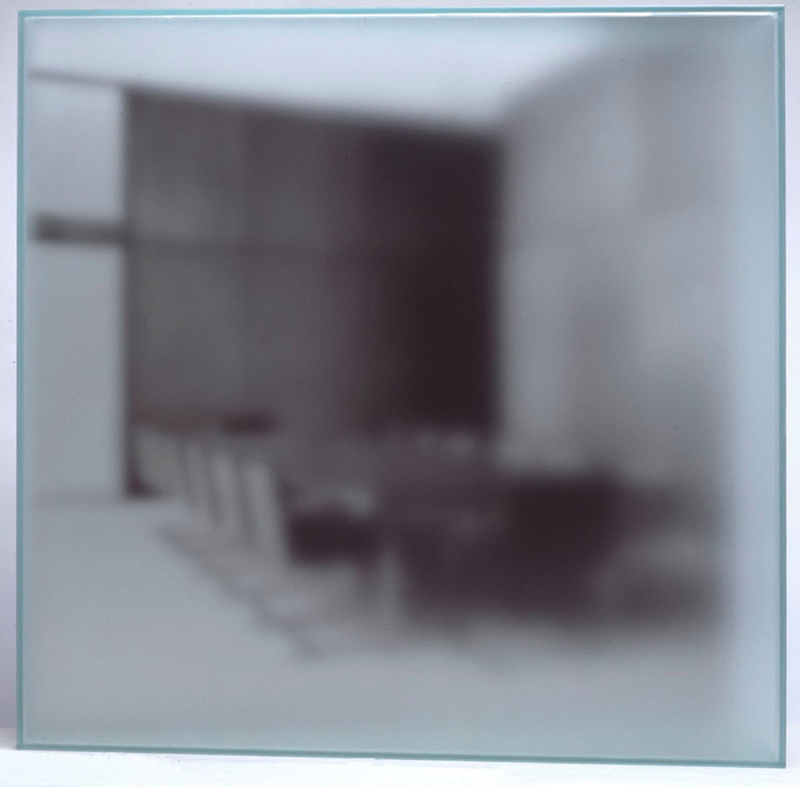 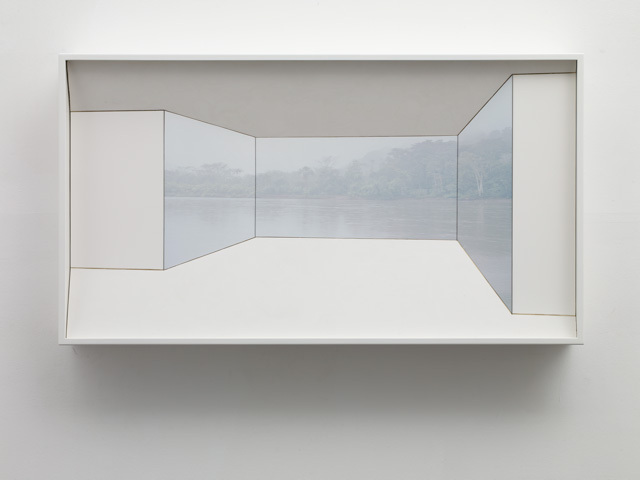 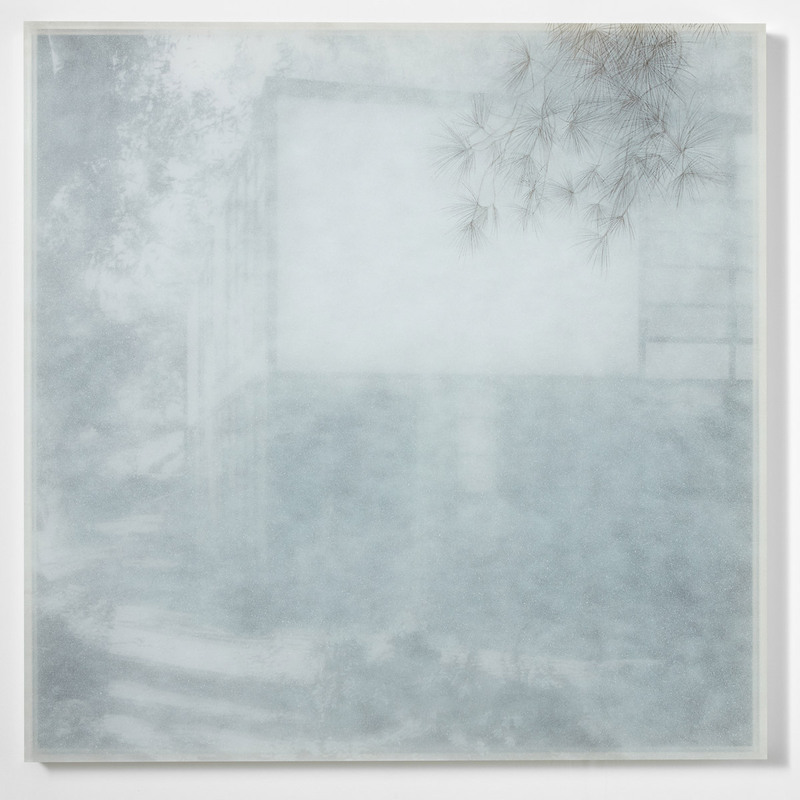 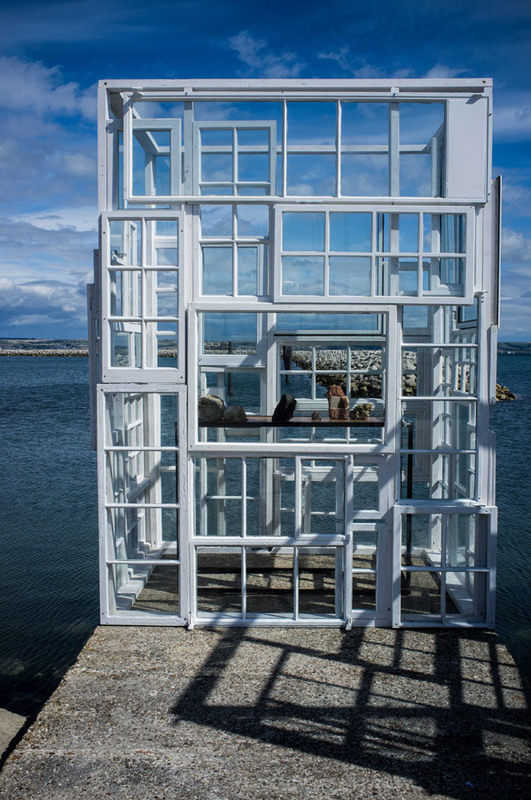 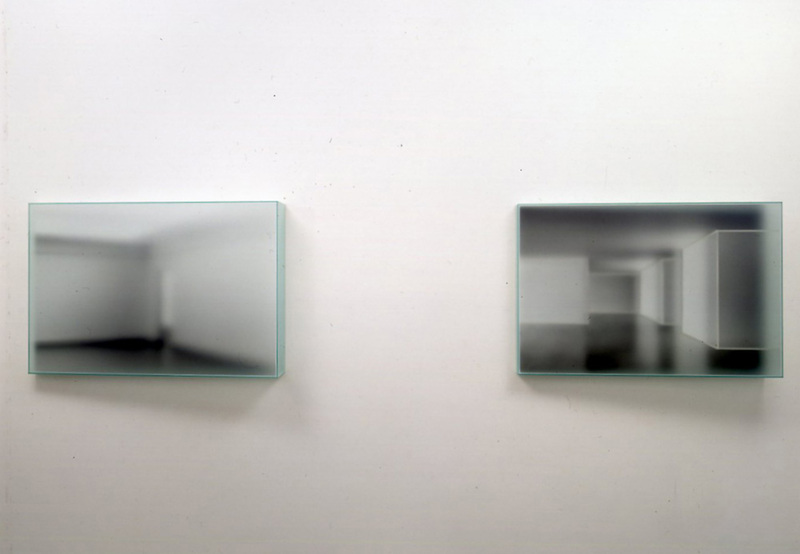 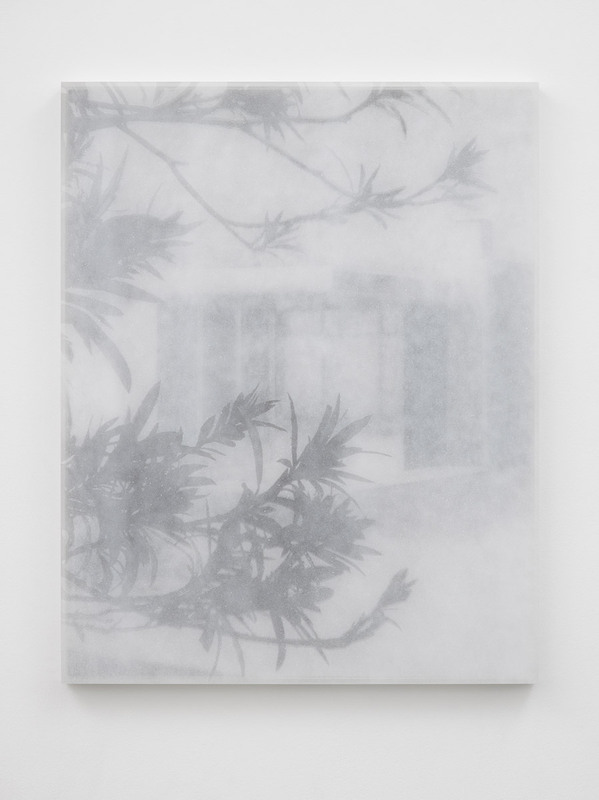 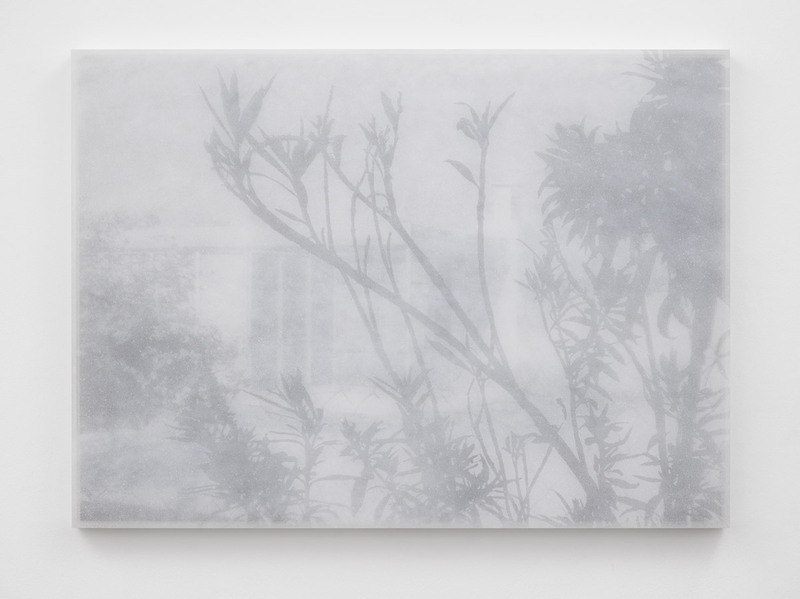 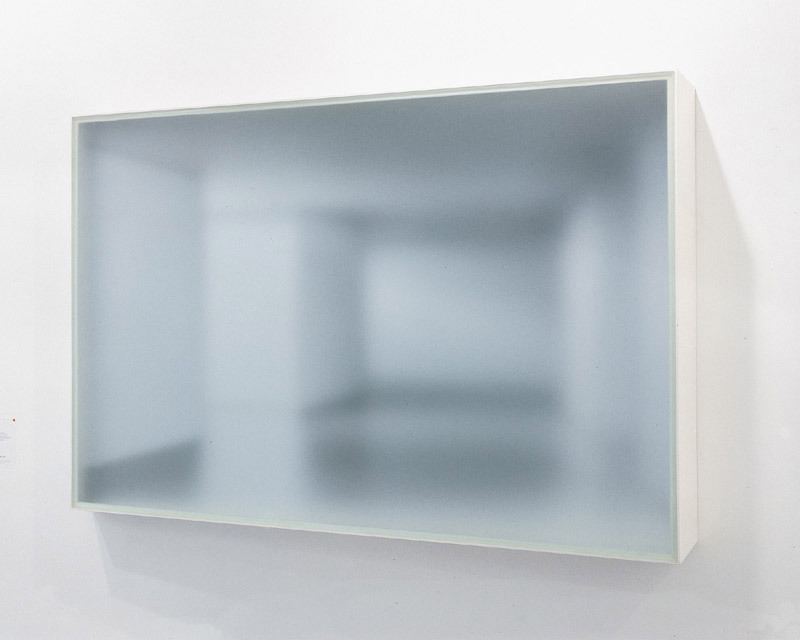 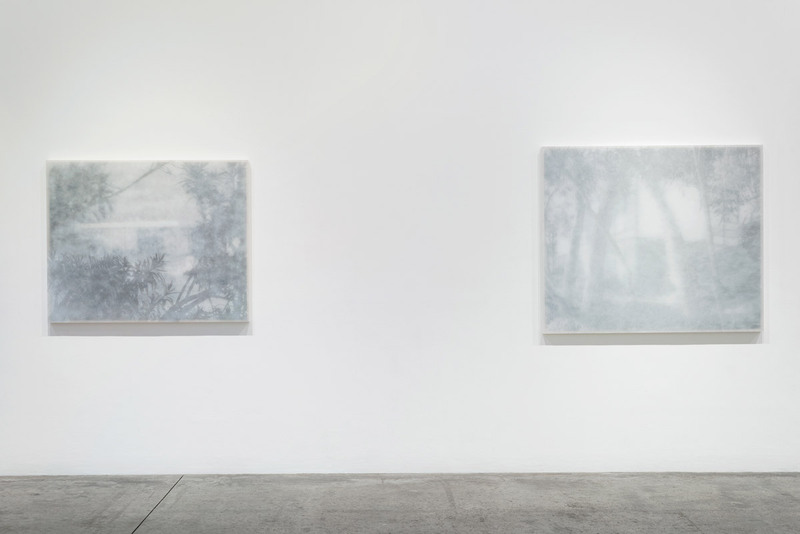 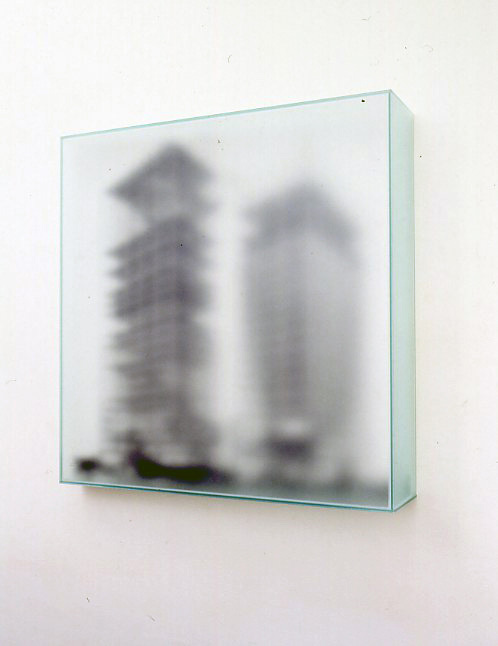 The encased image resonates between the photographic plane and the etch of the glass as the viewer moves around the work, making the enclosed spaces appear impossibly real, giving the illusion of a window into another world. 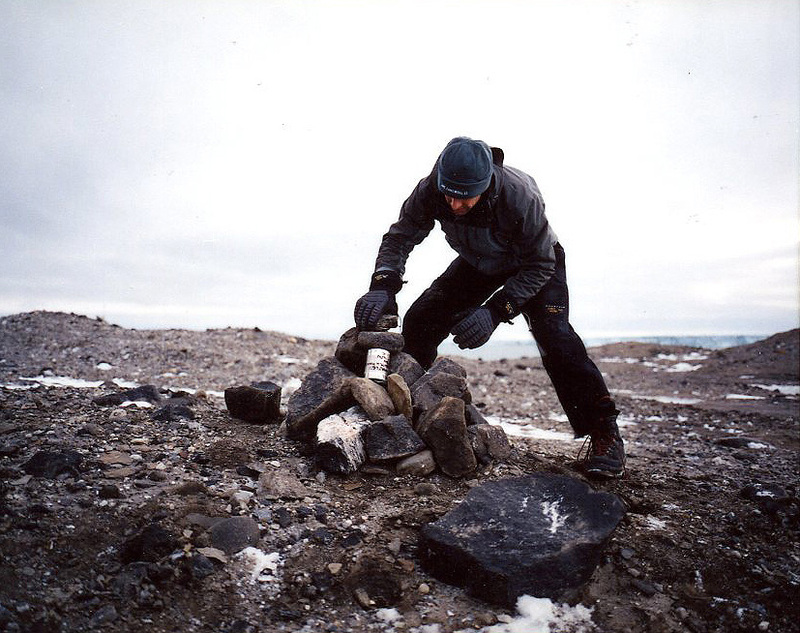 In a military installation in Toronto a fixed camera records Hartley in real time over a two and a half hour period as his core body temperature drops below 35 deg C and becomes hypothermic. 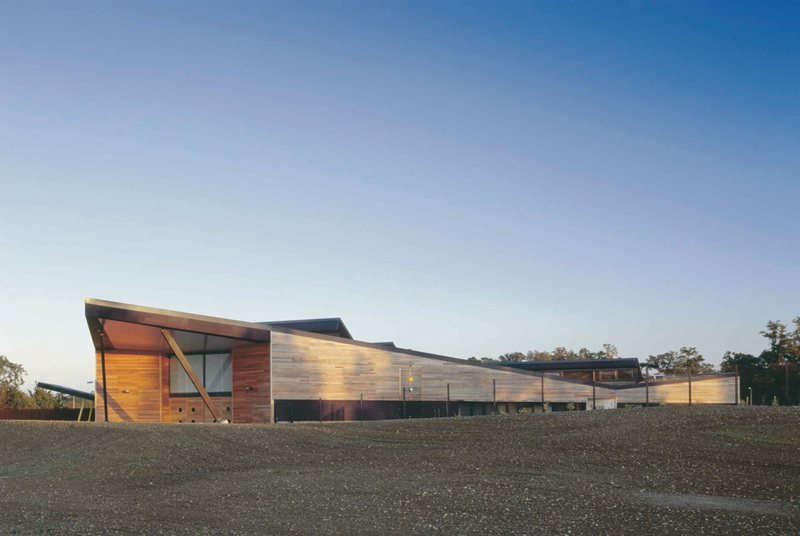 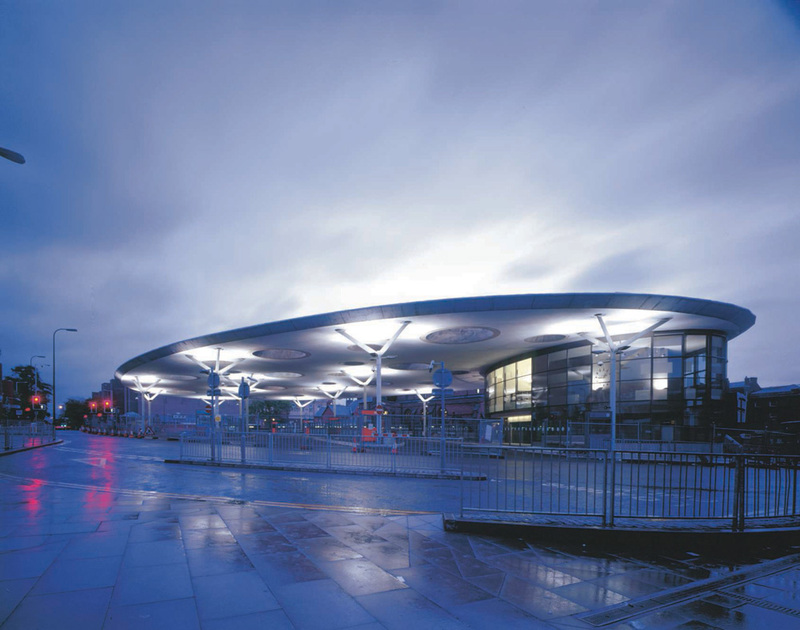 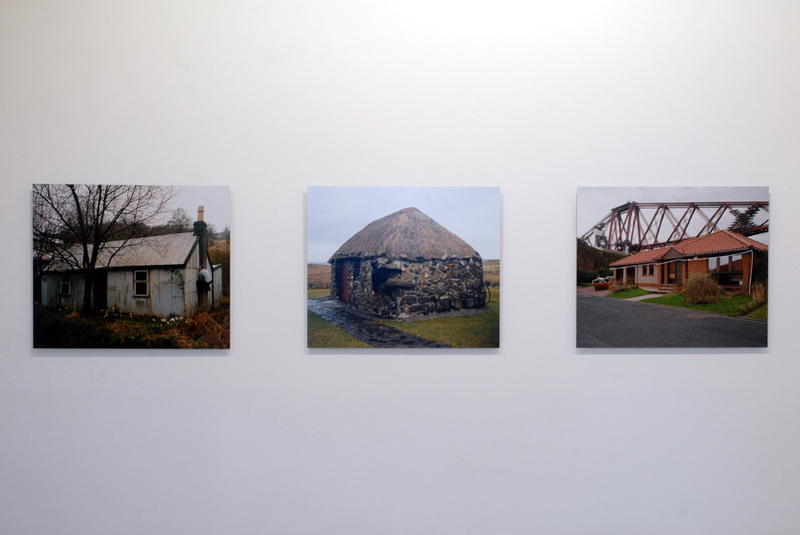 Examples of architectural photographic work. 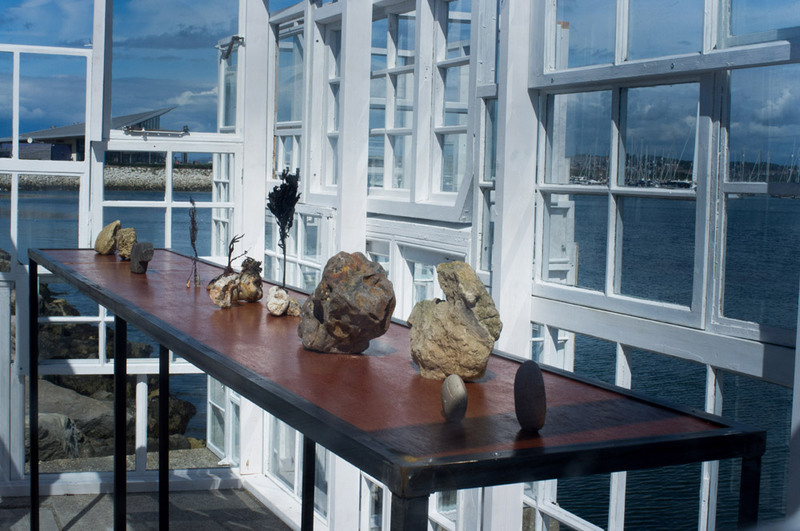 Commissioned for the exhibition “The Collection” curated by Siobhan Davies. 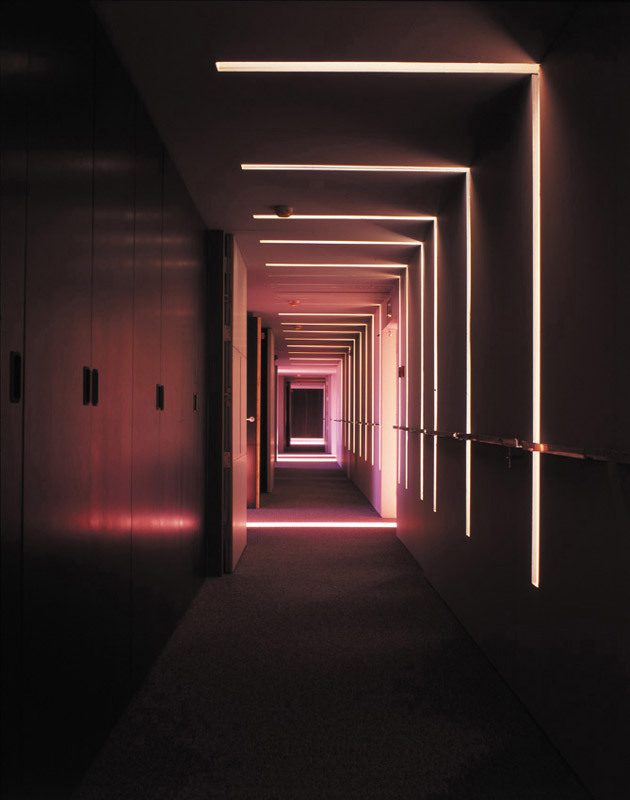 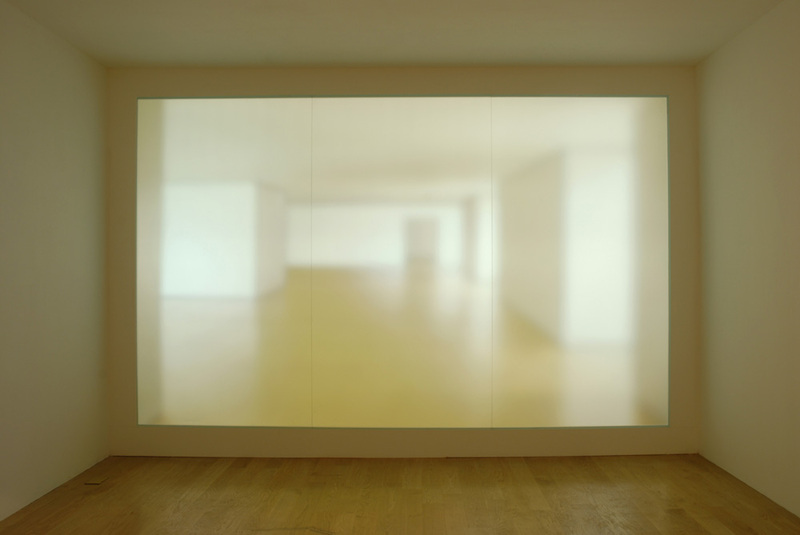 The film blends and melds a single protagonist as he/she/they move through an imagined constructed built environment, describing and charting the space and structure as they move in all directions through the film clips - creating a whole new architecture. 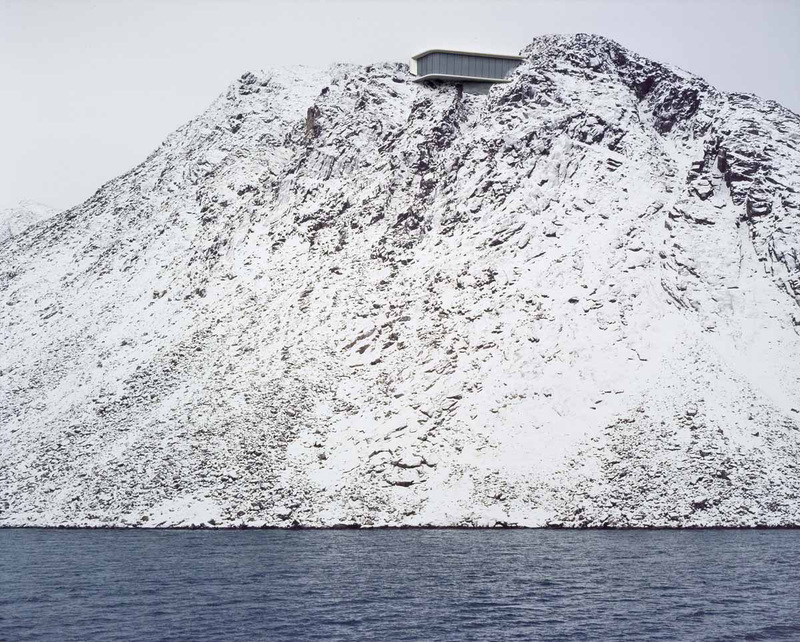 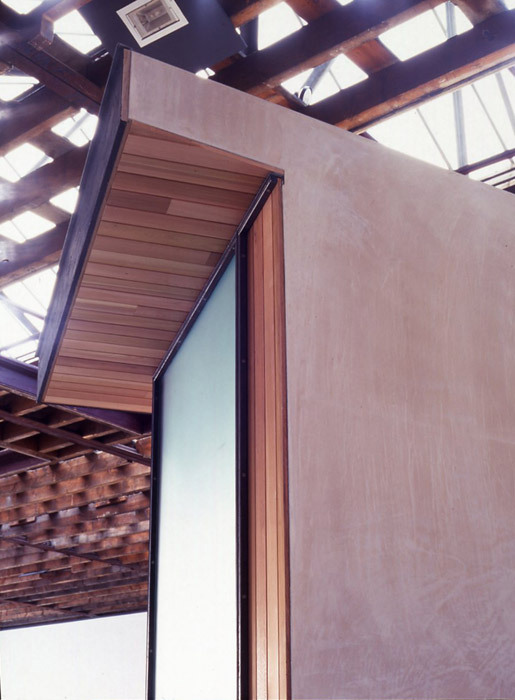 Part architectural coffee-table book, and part dumb climber’s guide. 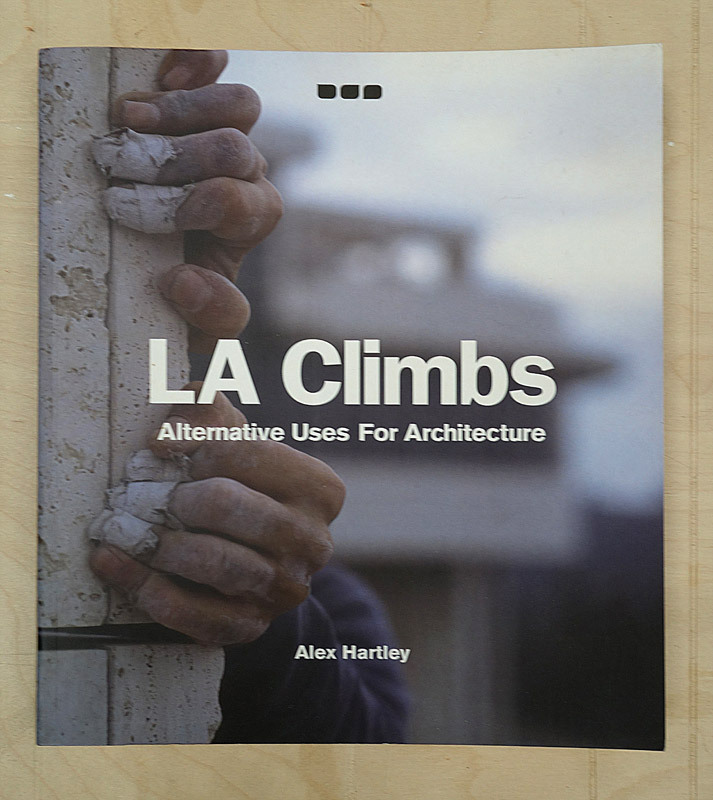 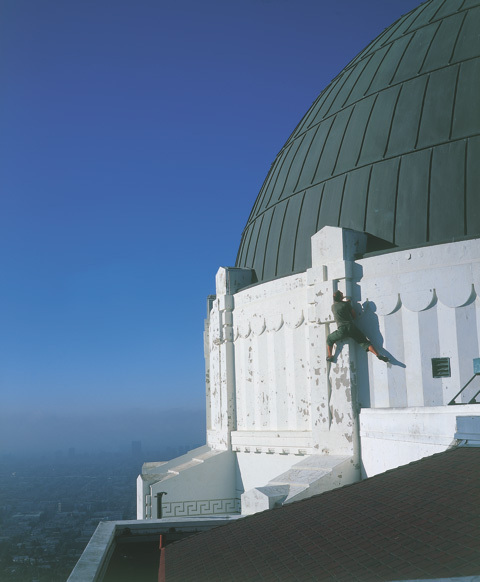 LA Climbs applies the rules of a climber’s guidebook to a selection of Los Angeles architecture, describing routes over both the iconic and the ordinary; building a personal journey and portrait of the city, and treating the built environment as mere surface and texture. 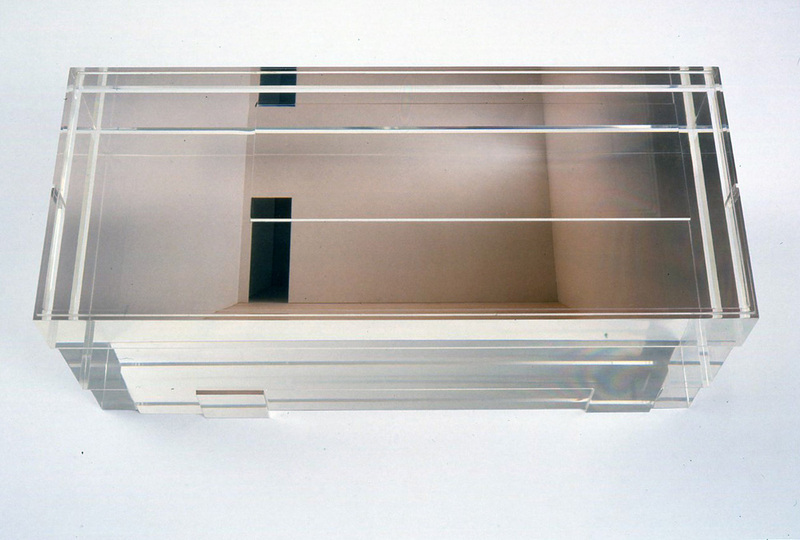 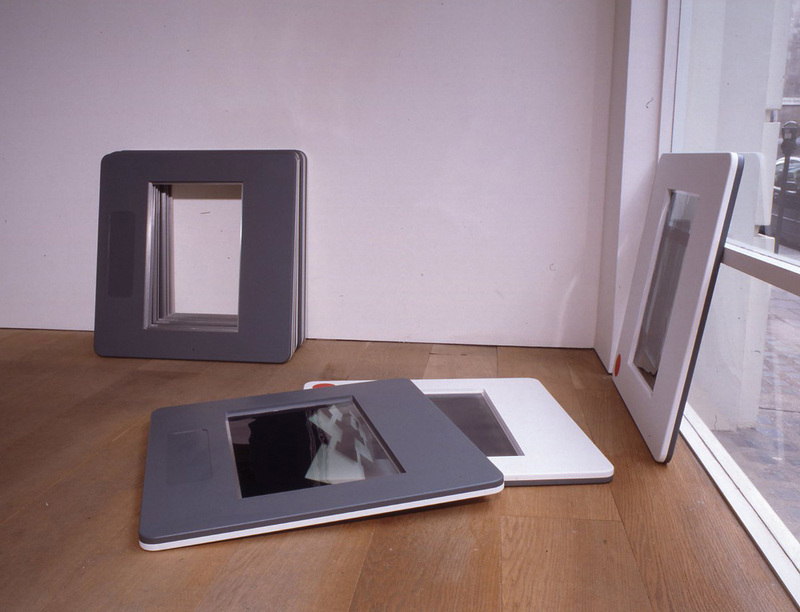 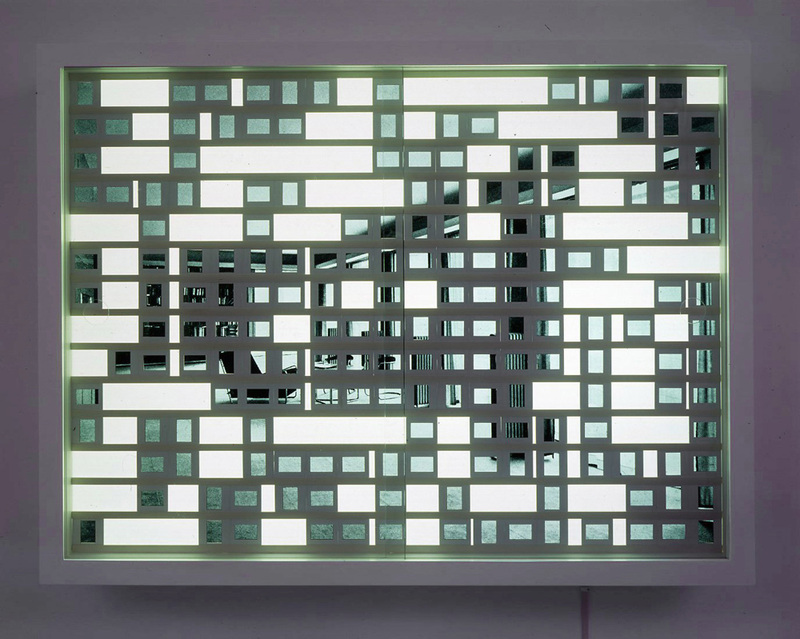 A single architectural image is divided into 35mm slides and housed in a museum slide display box. 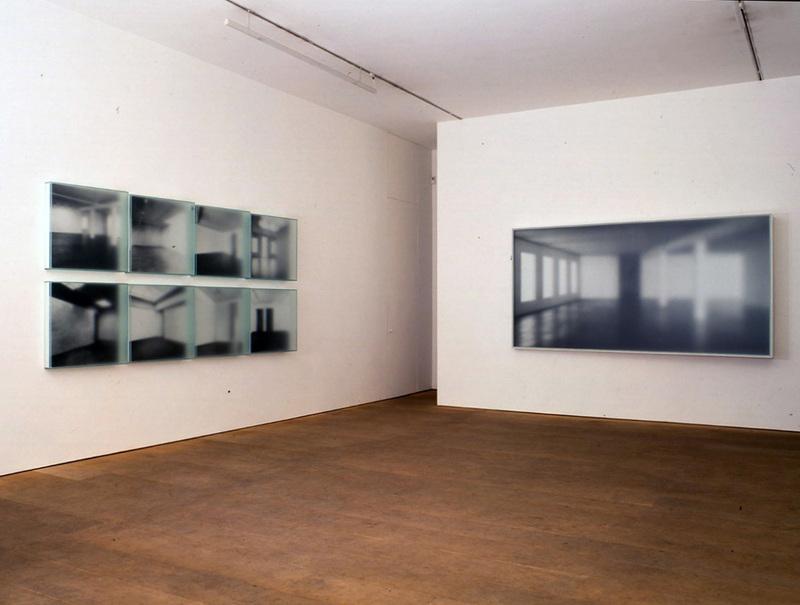 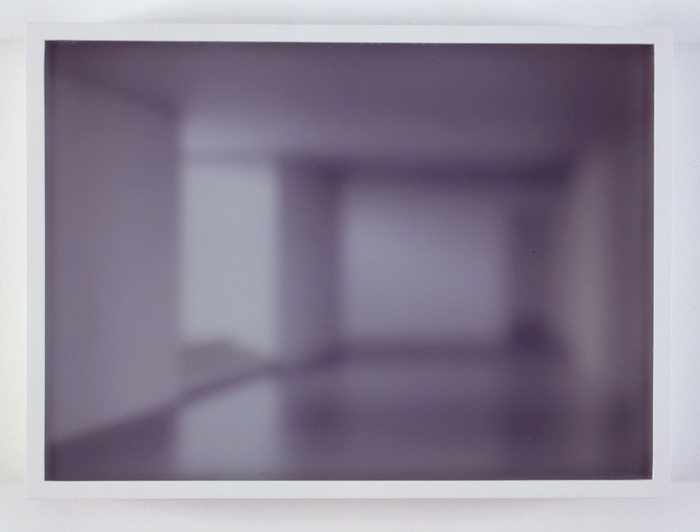 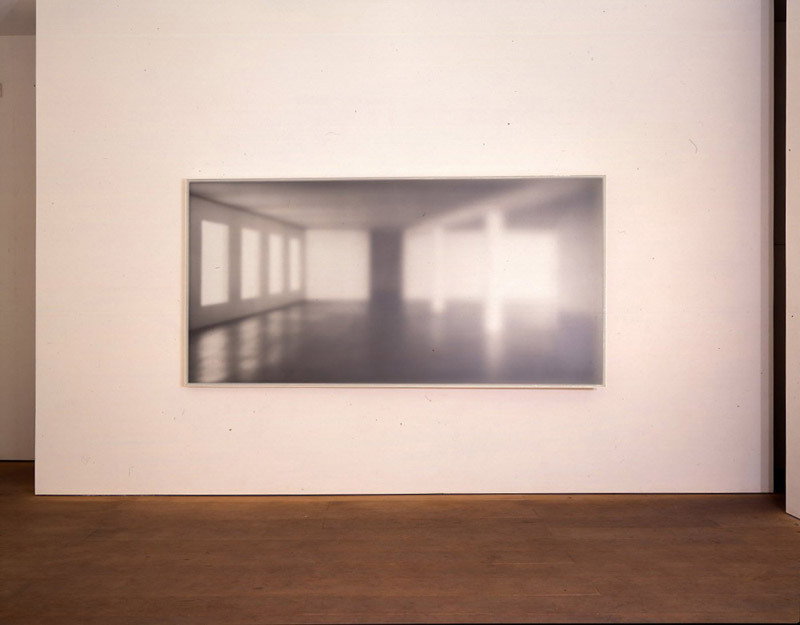 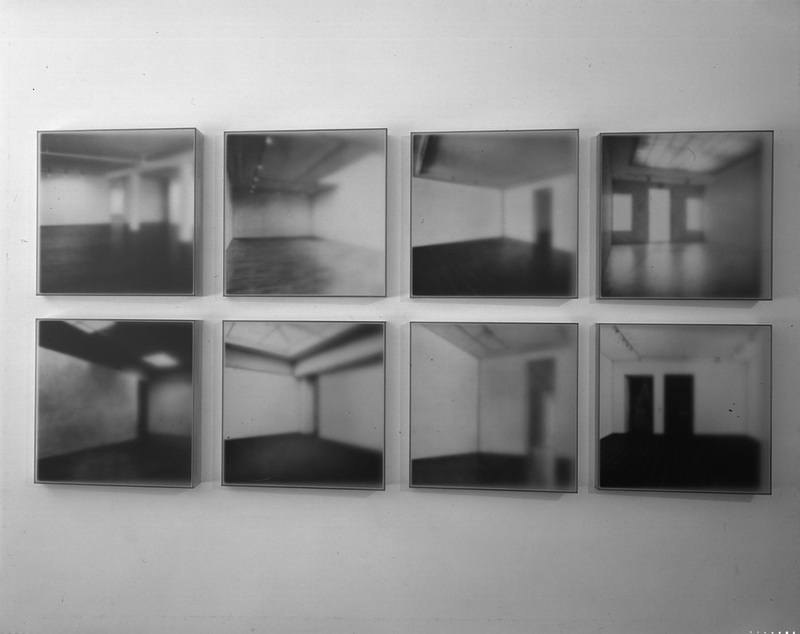 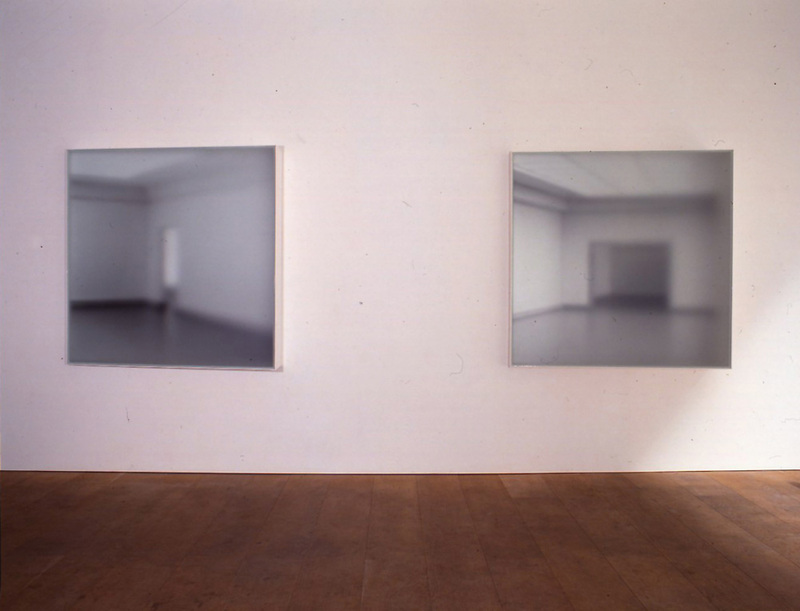 Slides are removed until the image can still be read, and a tension between the represented space of the slides and the infinite depth of the light box beneath resonates. 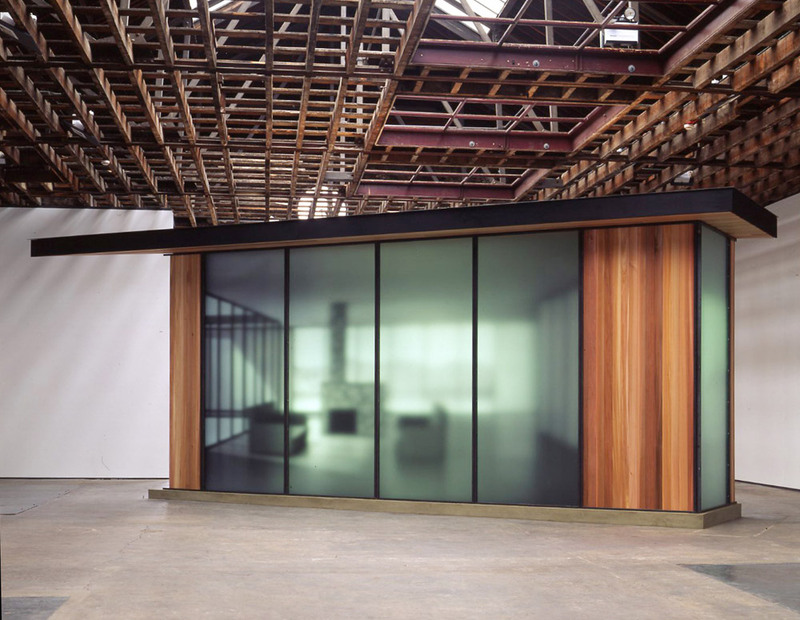 Architectural collaborations with architects David Adjaye, AHM&M, ABK Architects amongst others. 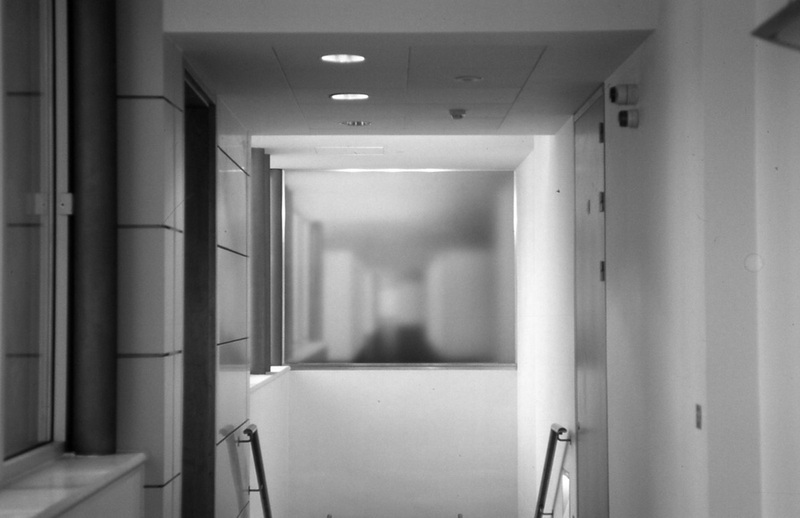 Commissions include ‘Passage’ at the Barbican London. 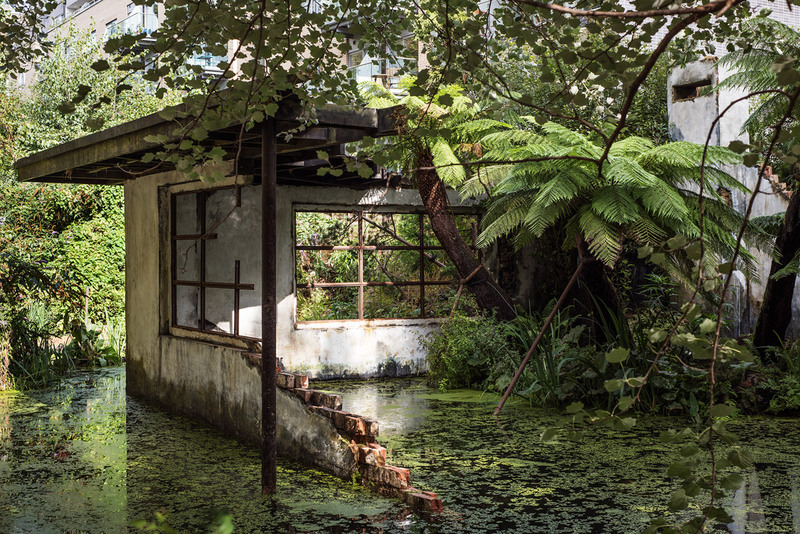 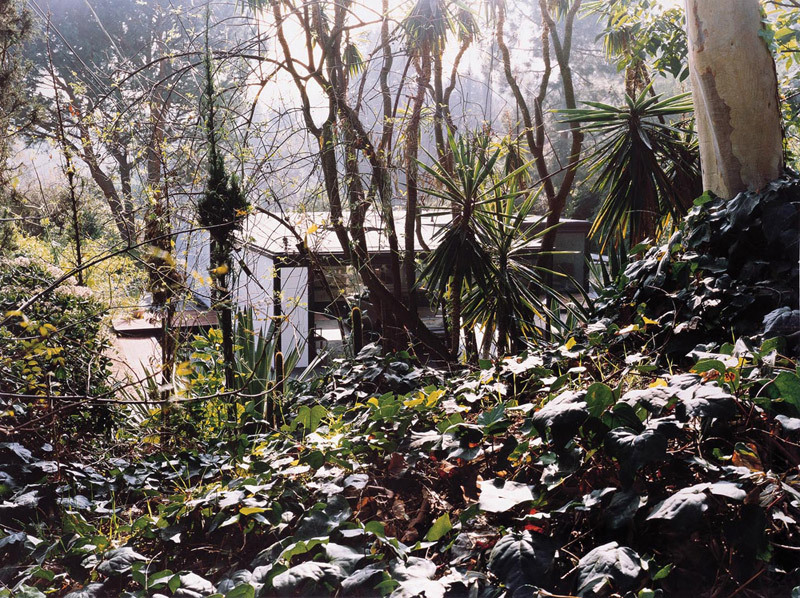 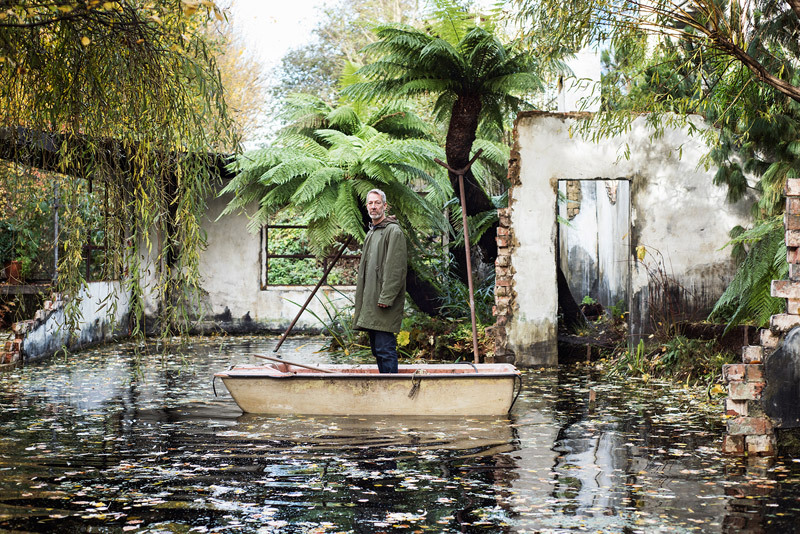 Resembling an International Style domestic building apparently abandoned to the elements, the major architectural intervention A Gentle Collapsing II transforms the gallery’s waterside garden into a scene of poetic dereliction and decay. 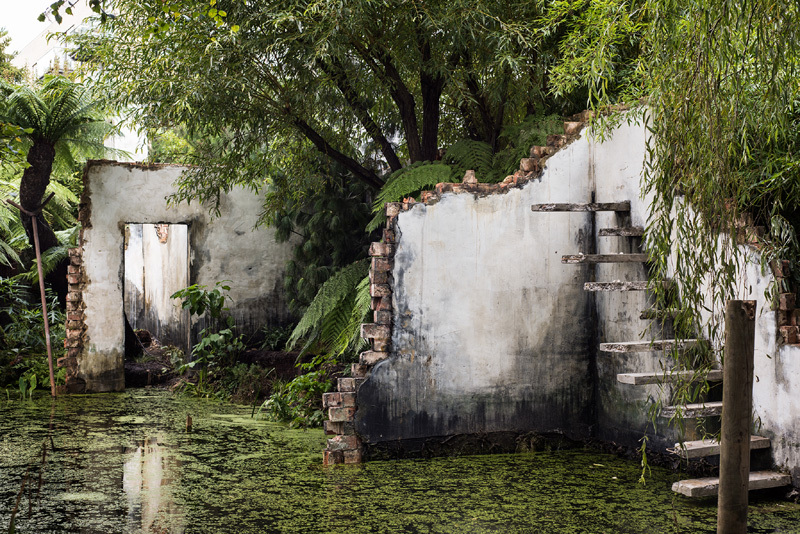 Built on the canal bank and into the water itself, the work encapsulates classic modernist tropes – yet the structure and what it appears to portray – a home vacated without explanation, open to the elements, its white rendered walls peppered with black mould rising from the waterline – stands in stark contrast to images of domestic architecture and attendant aspirational lifestyles from the period. 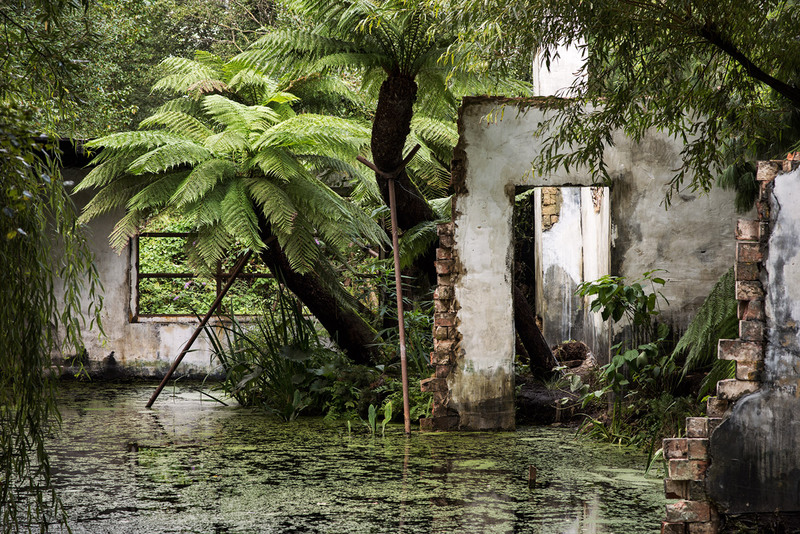 Instead, created especially for the garden, with its tree ferns suggestive of an ancient subtropical or temperate landscape, A Gentle Collapsing II looks to have undergone an accelerated process of ageing. 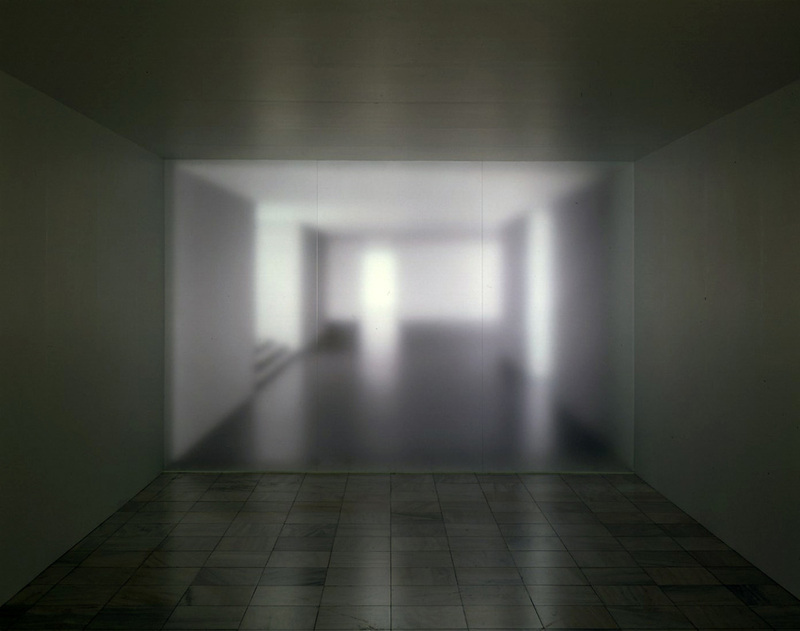 It is as if we have been teleported into the future in order to look back at the present or very recent past. 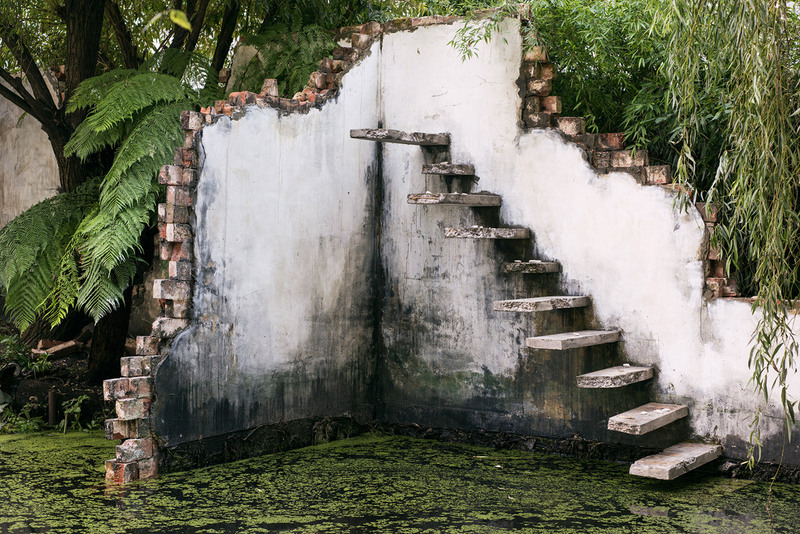 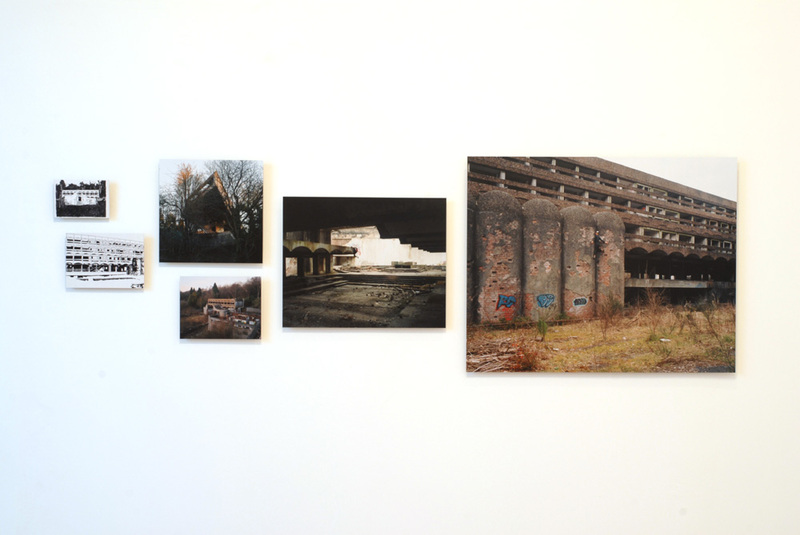 The work offers poignant reflection on themes of entropy and decay. 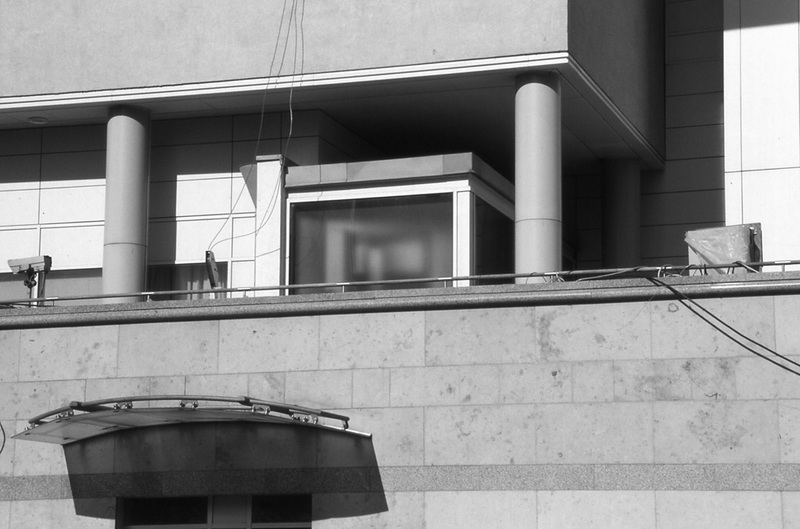 It is, in some ways, emblematic of a wider collapsing – of ideals or even spirit. 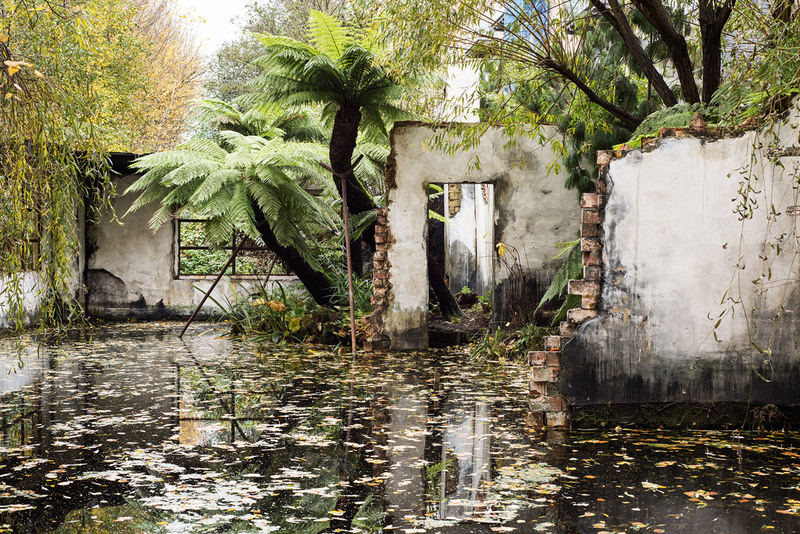 Running contrary to such thoughts, however, is the undeniable aesthetic pleasure we find in ruins – their compelling, transportative quality. 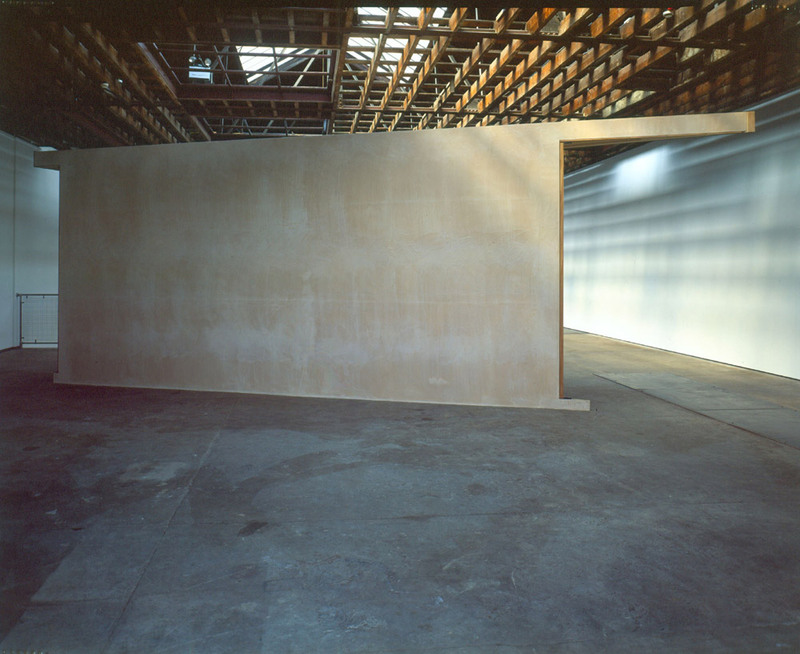 In this sense, A Gentle Collapsing II becomes a kind of time machine that frees the mind to wander, gently collapsing or dislocating a sense of linear time as it does so. The work chimes with the idea of the folly as a faux historical structure placed in the landscape to act as a conversation piece, with the real-life ruins that seduced aristocratic tourists on the Grand Tour in the eighteenth century. 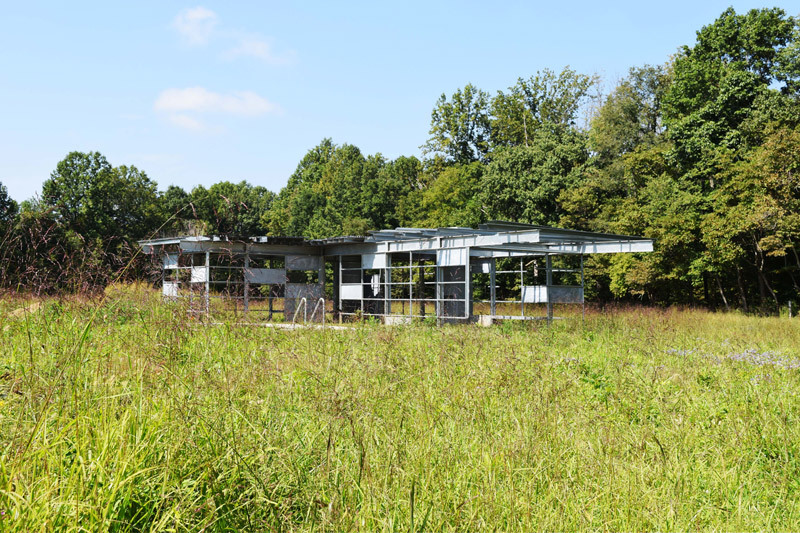 Hartley has constructed a modern ruin permanently sited in the rolling landscape of Kentucky in the convention of a picturesque folly. 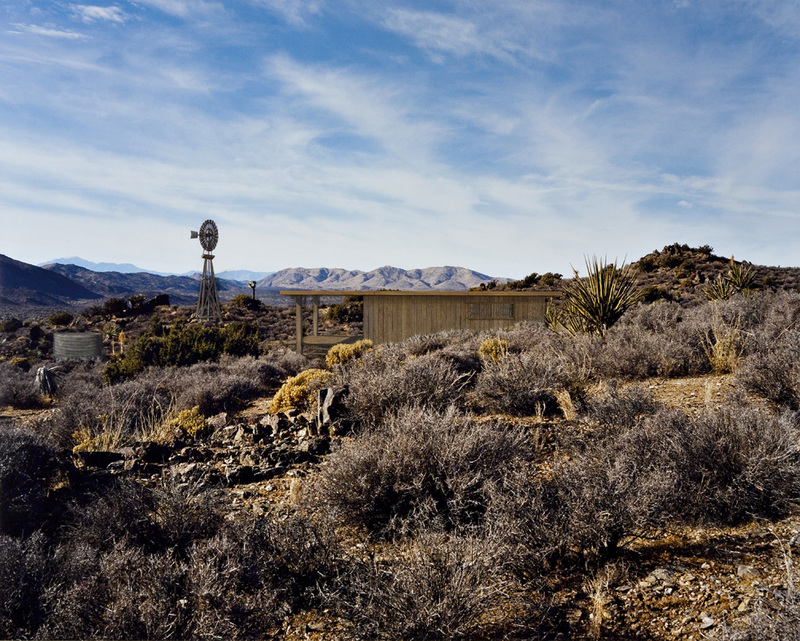 The galvanised steel sculpture is based on the iconic single-family dwelling exemplified through Californian modernism and John Entensa’s Case Study Programme. 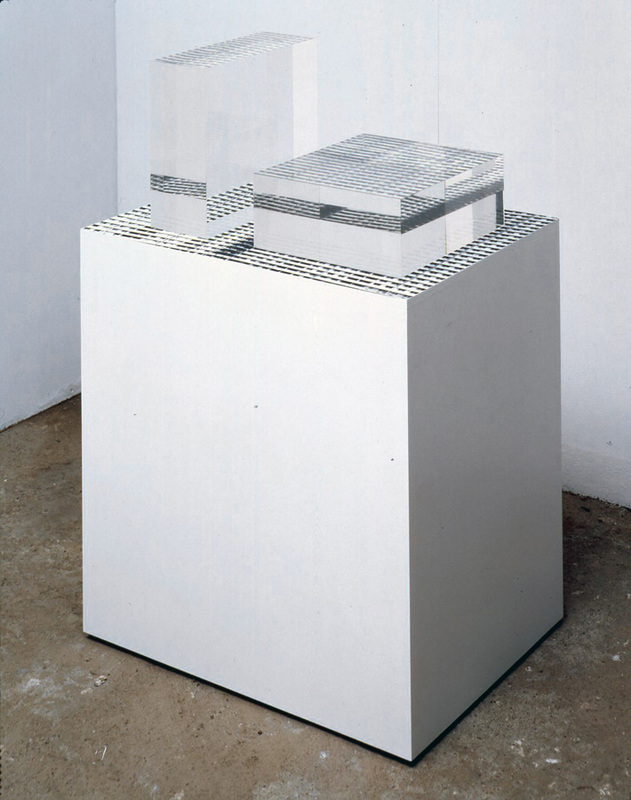 The sculpture's state of entropy has been frozen, and stasis is held in a precarious state of equilibrium. 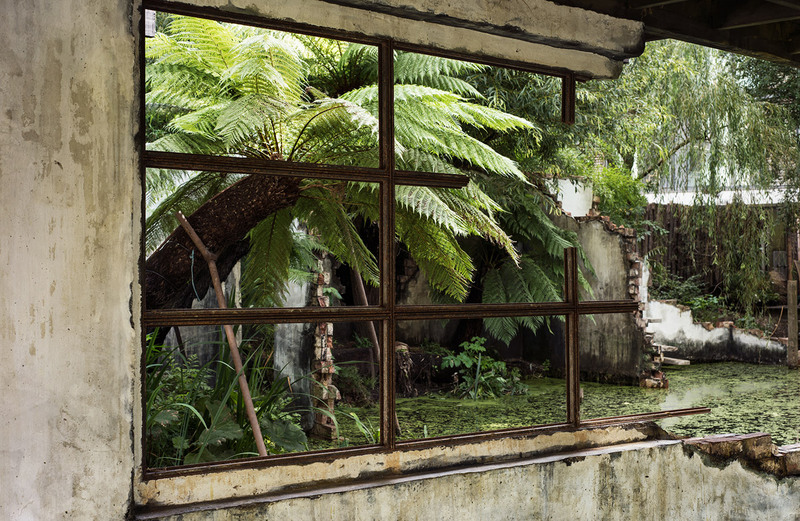 Nature is being encouraged to slowly reclaim the structure. 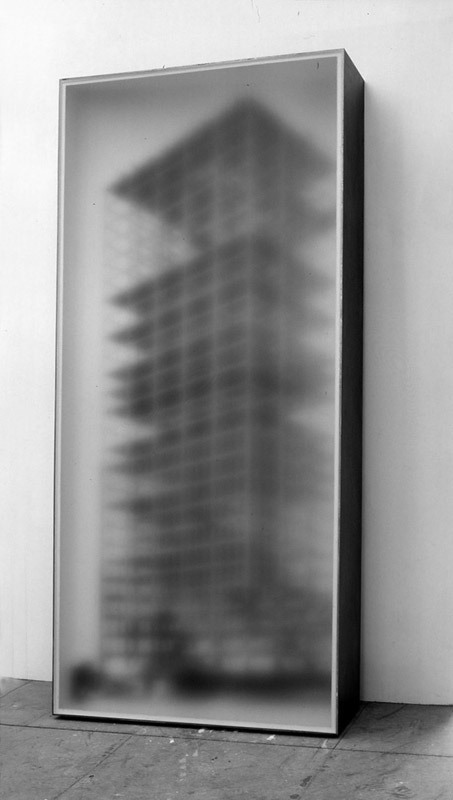 Gentle Collapsing I is part of a private collection. 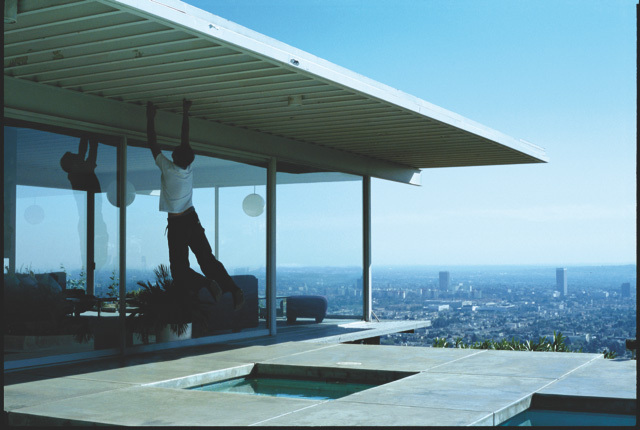 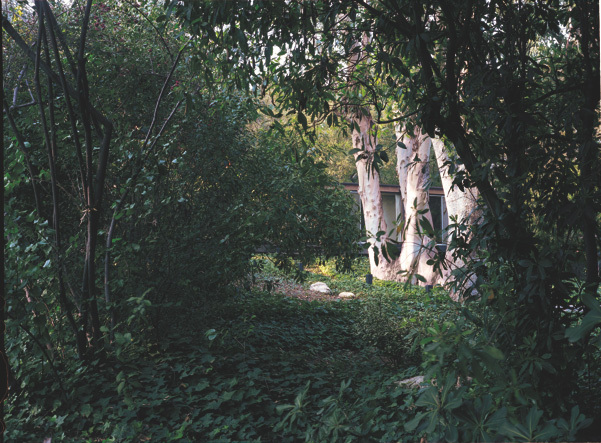 Iconic modernist domestic architecture, photographed by Hartley over the last twenty years in and around Los Angeles, form the basis of his series of monochrome wall-based works titled The Houses. 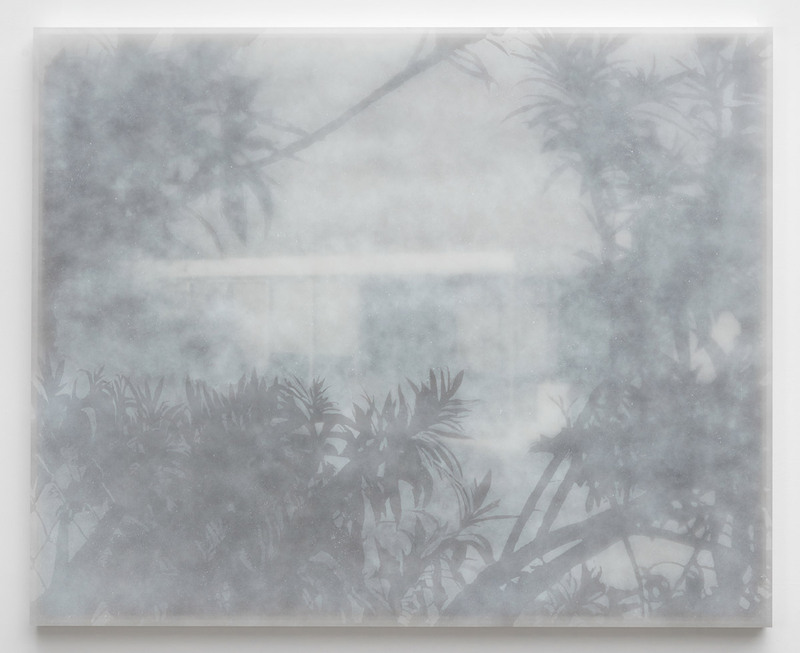 Embedded in these works are ideas of privacy and voyeurism. 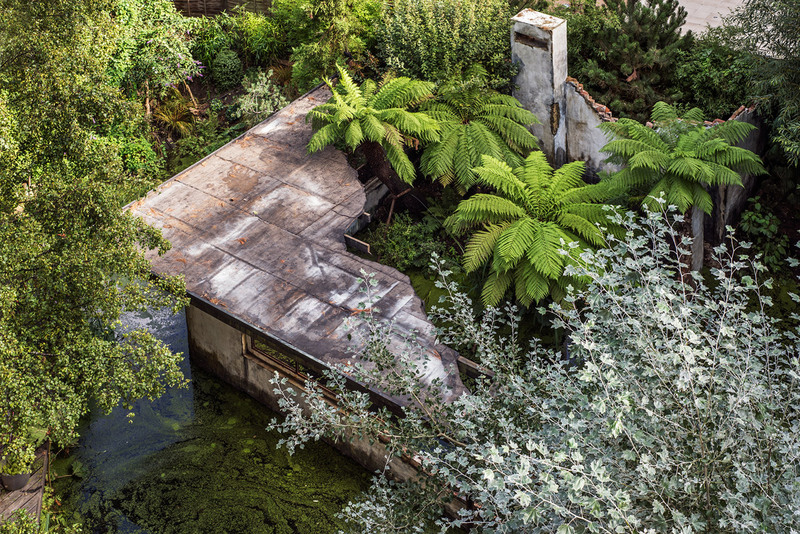 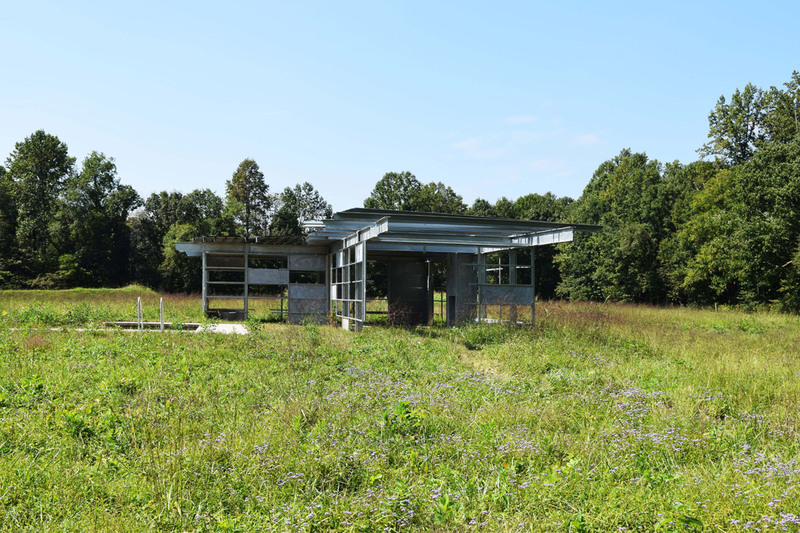 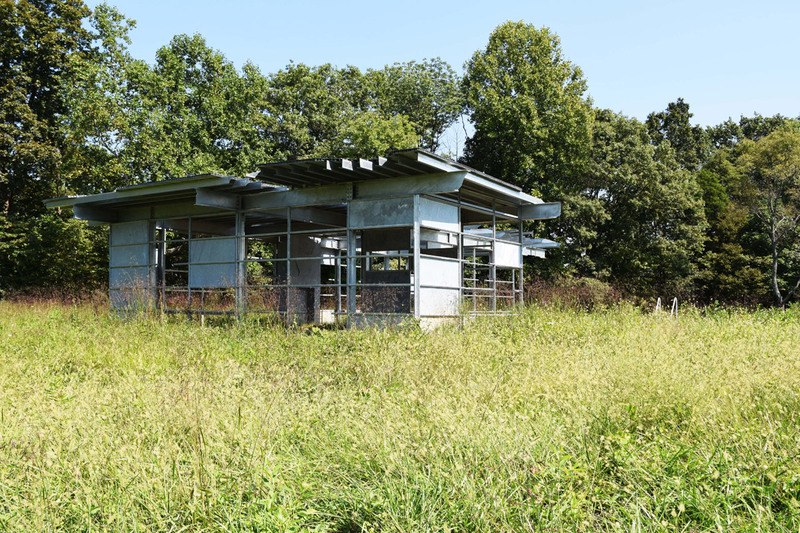 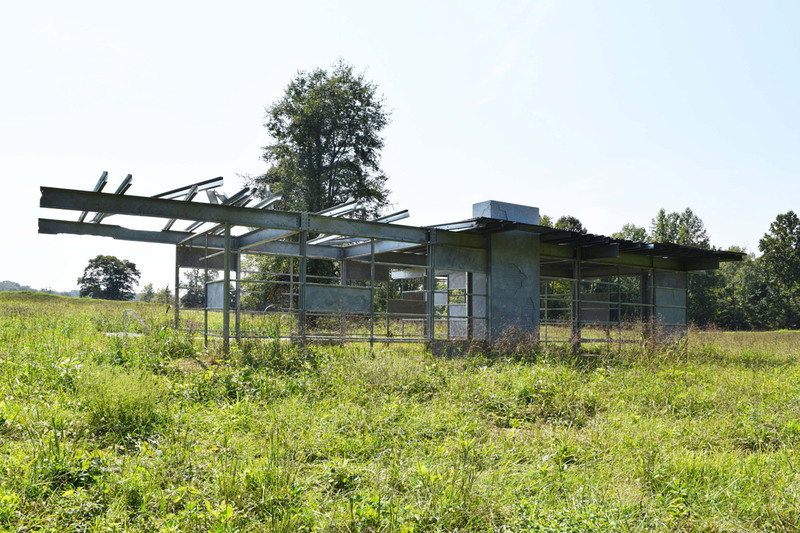 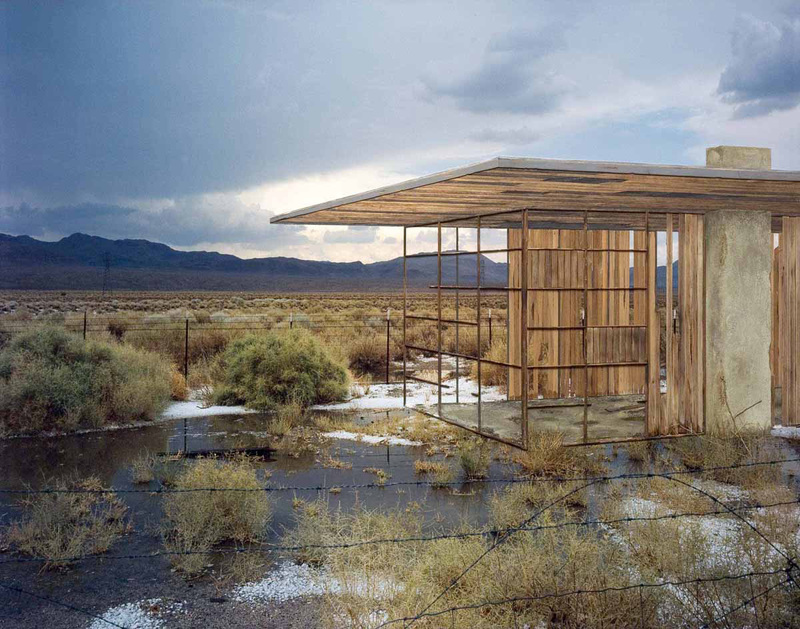 Nature begins to take over and the contradiction of the modernist aspiration as epitomised by the glass-walled pavilion is exposed, giving rise to the need and desire for boundaries of other kinds. 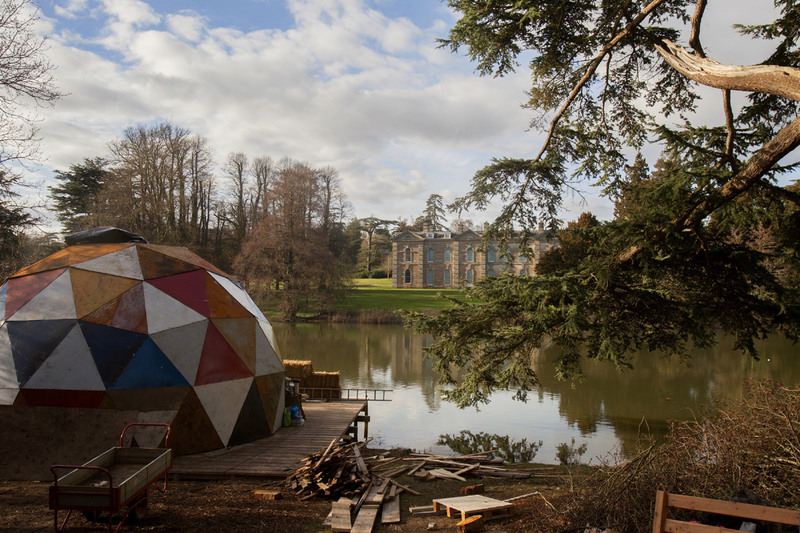 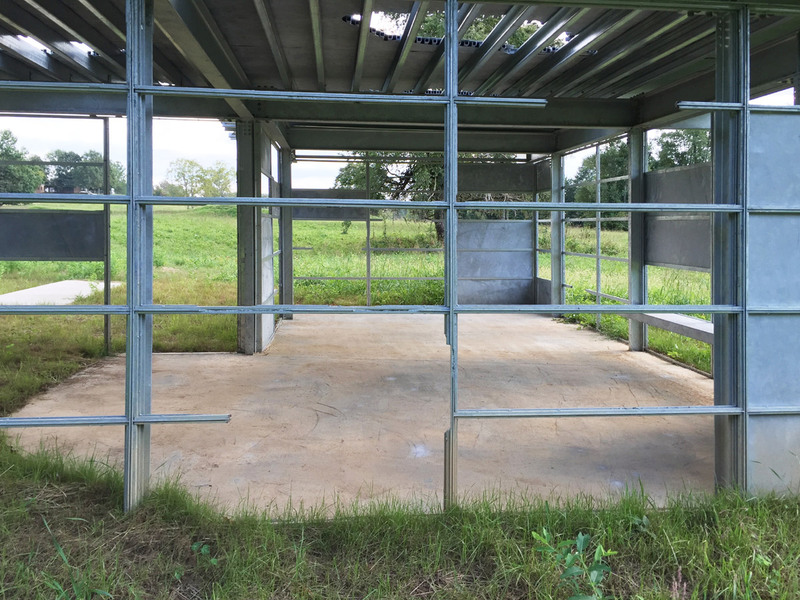 The Clearing is a collaborative artwork by Alex Hartley and Tom James, which set out to build a radical vision of the future in the grounds of Compton Verney Art Gallery & Park - a quintessential English picturesque landscape designed by Lancelot Capability Brown. 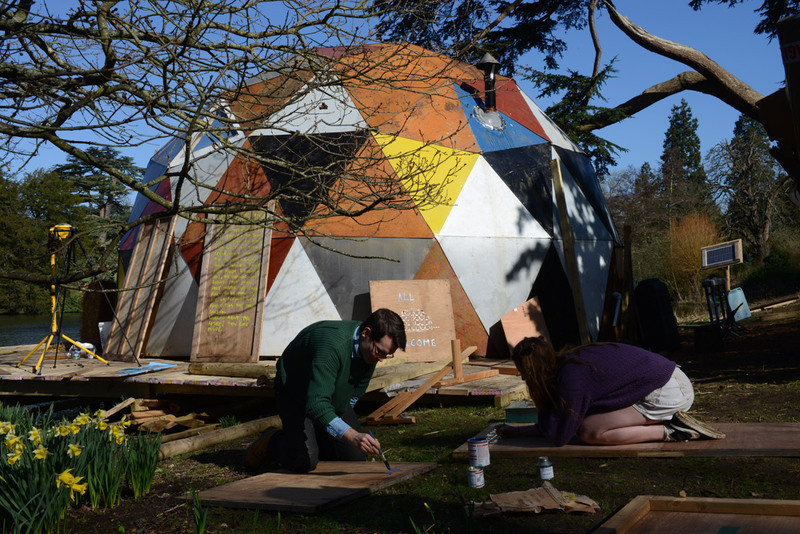 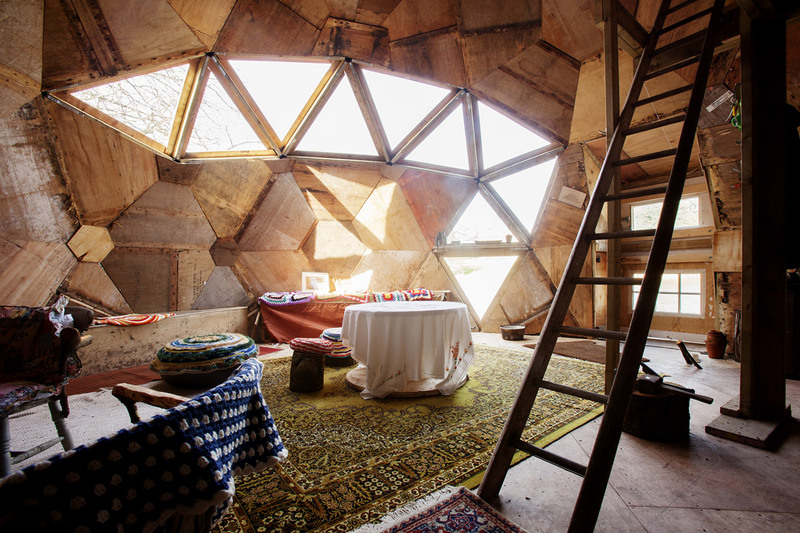 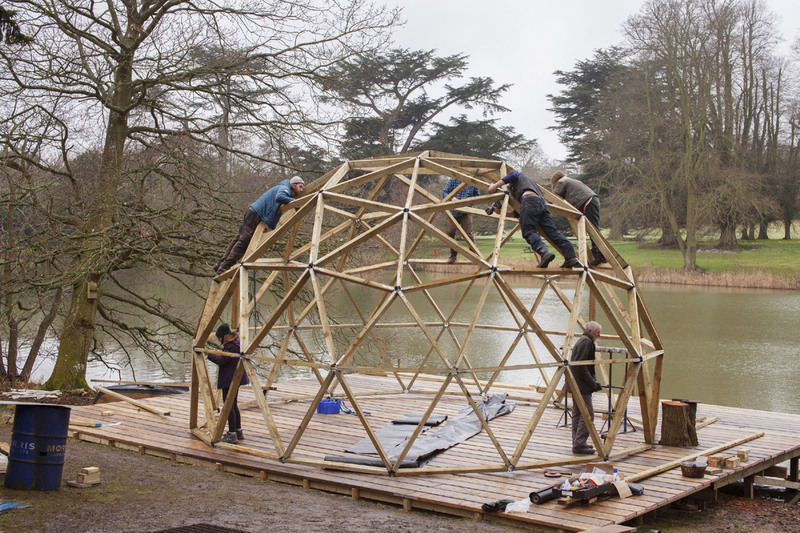 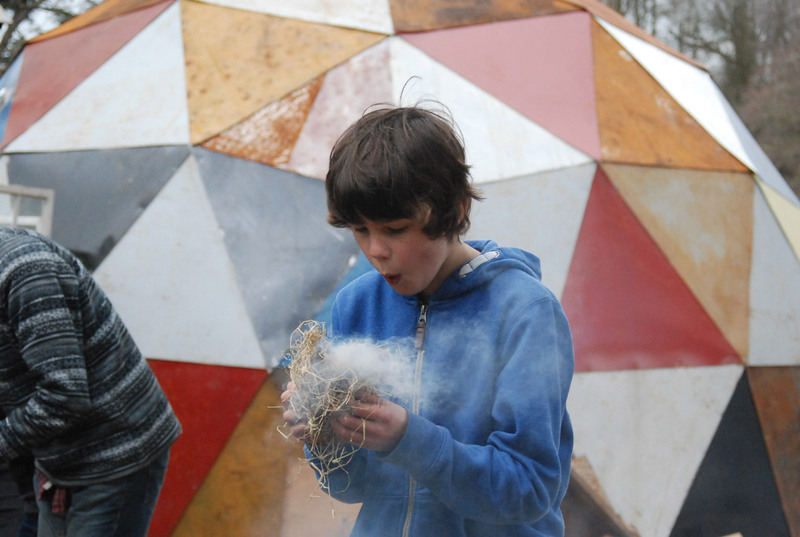 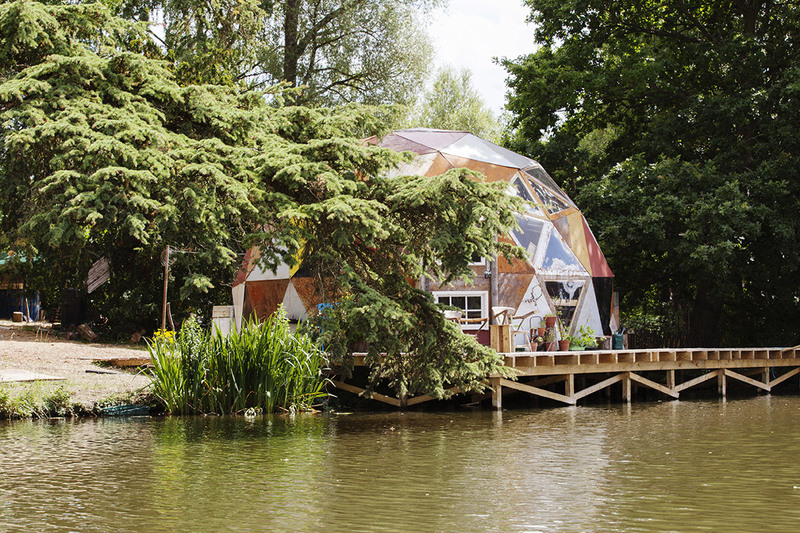 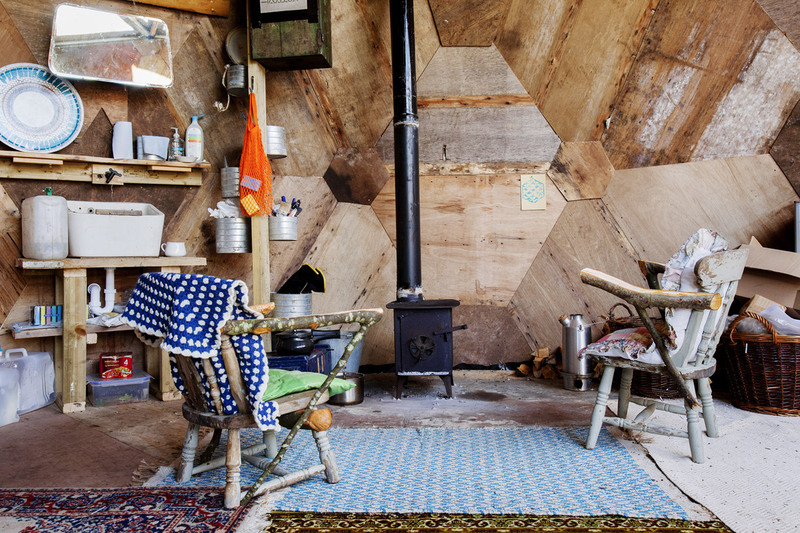 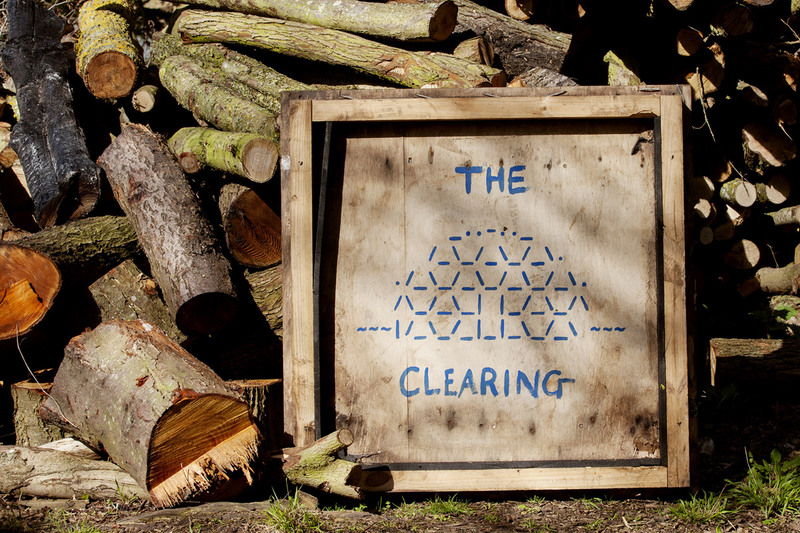 The Clearing is a participatory durational project centred around a geodesic dome built into a bank of the lake as a social space and encampment that generated and nurtured the The Clearing Community. 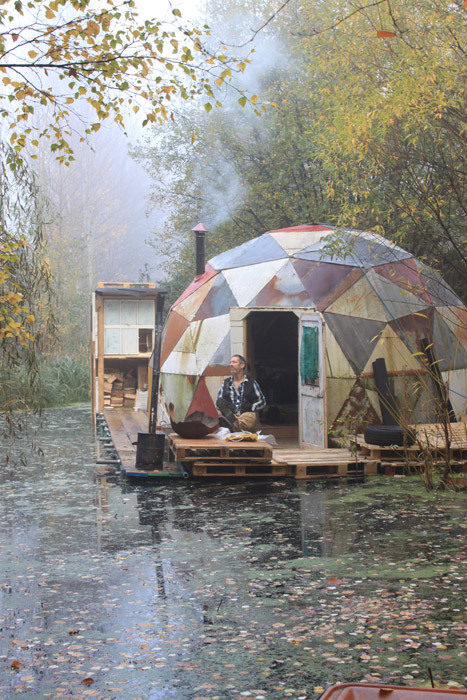 The visitor to the encampment was invited to learn how to live in the world affected by both the social and climate changes that are coming our way. 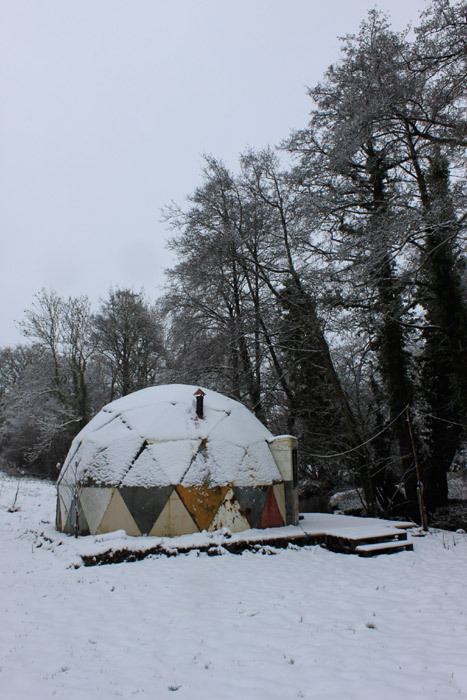 Volunteer caretakers occupied and lived in the dome throughout its first year, and The Clearing hosted a series of radical workshops and gatherings that shared knowledge of how to make fire, construct a radio, consider democracy, deliver a baby, build a compost toilet, read the stars, and learn how to die in the future. 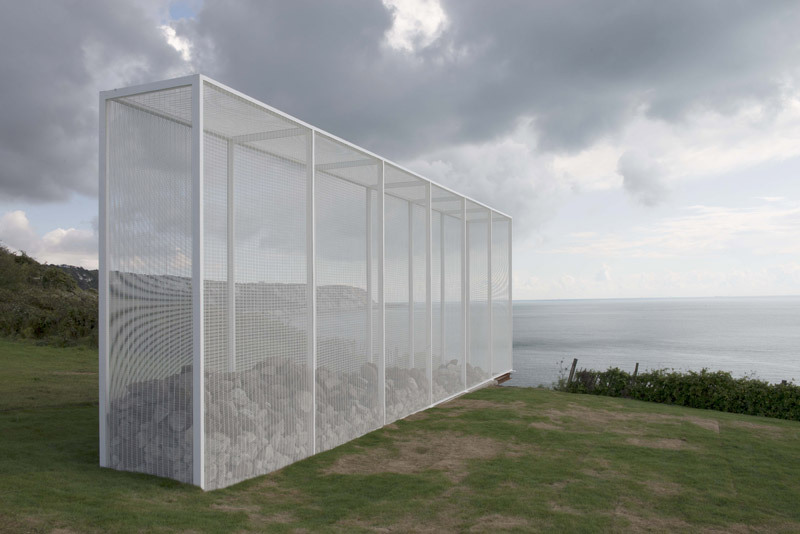 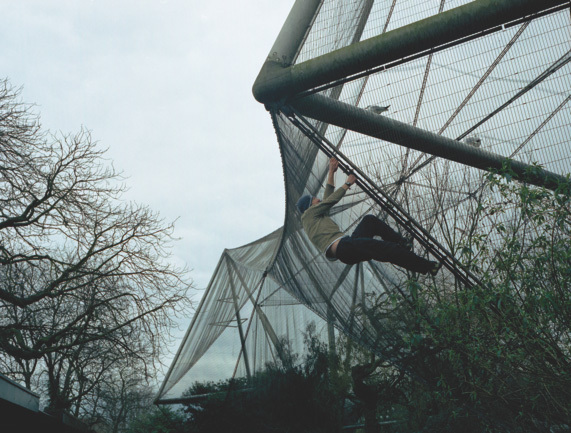 The sculpture is in the form of a cage, or double fence, similar to the fences used around ‘The Jungle’ camp and Eurostar tracks in Calais. 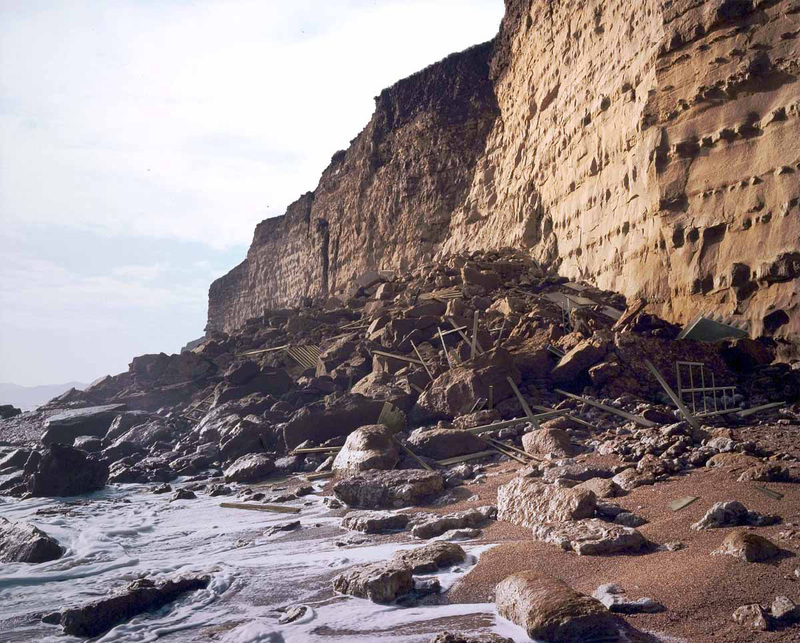 The wall is partially filled with ancient ‘quern’ stones found at this site over millennia; millstones made from the local Greensand stone since the Iron Age. 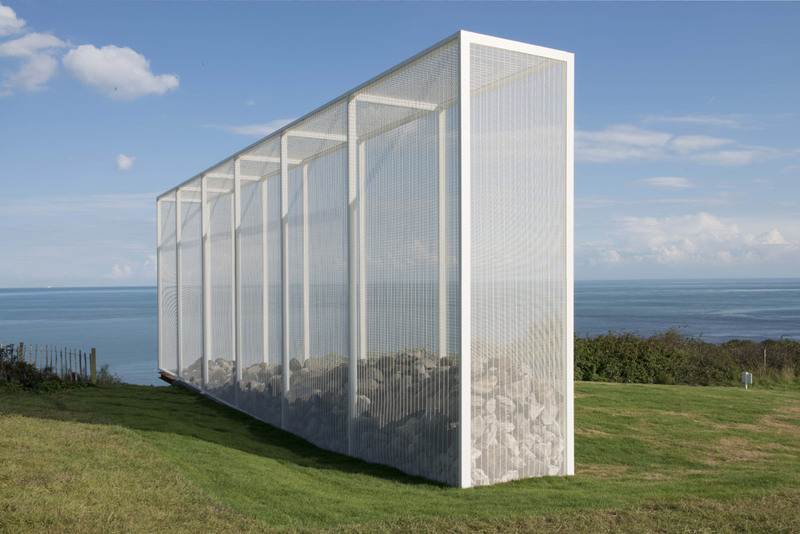 The querns held within the wall act as a kind of delicate historical counterweight, currently preventing the precariously sited sculpture from tipping over the continuously eroding land’s edge. 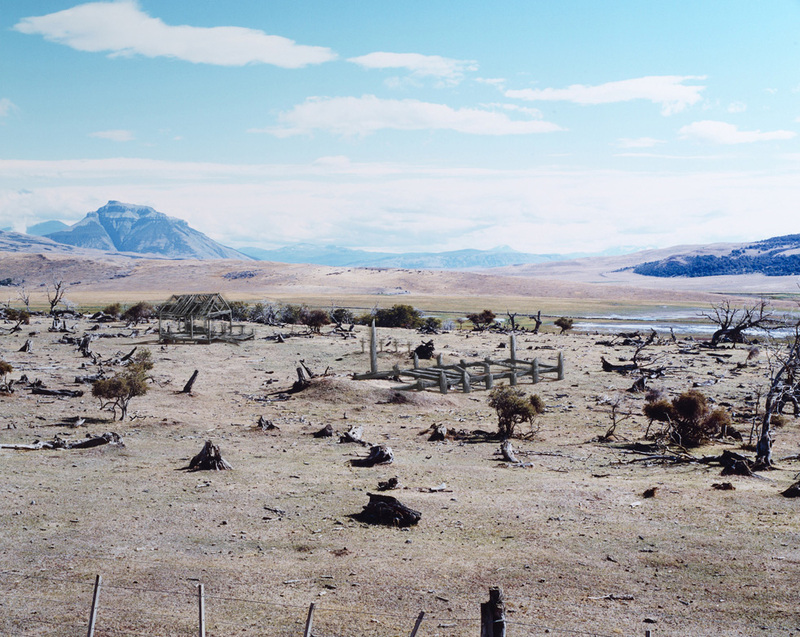 Geological time, the inevitability of the land erosion converse with the precariousness of this border site. 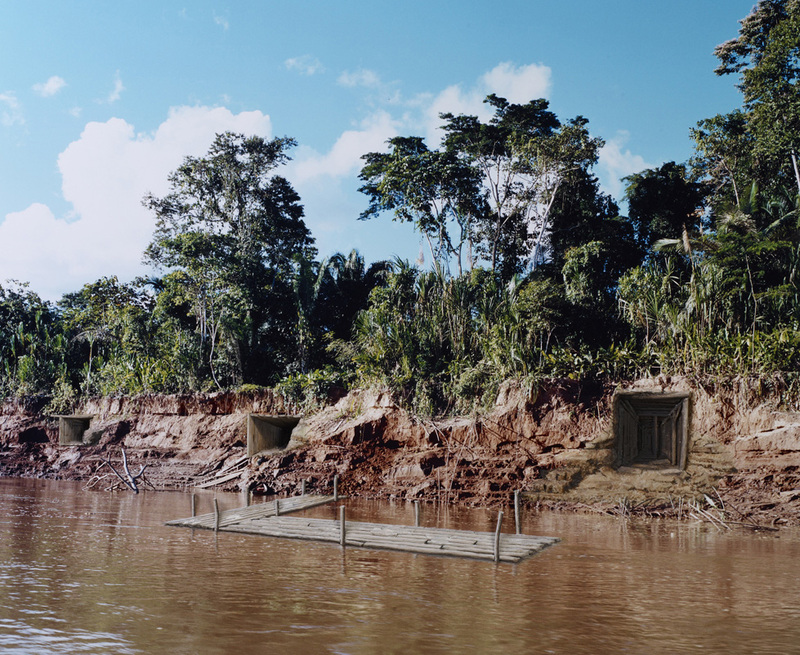 City of the Sun, The Present Order and Arrangements in the Beyond, are all from Hartley's The Jungle series. 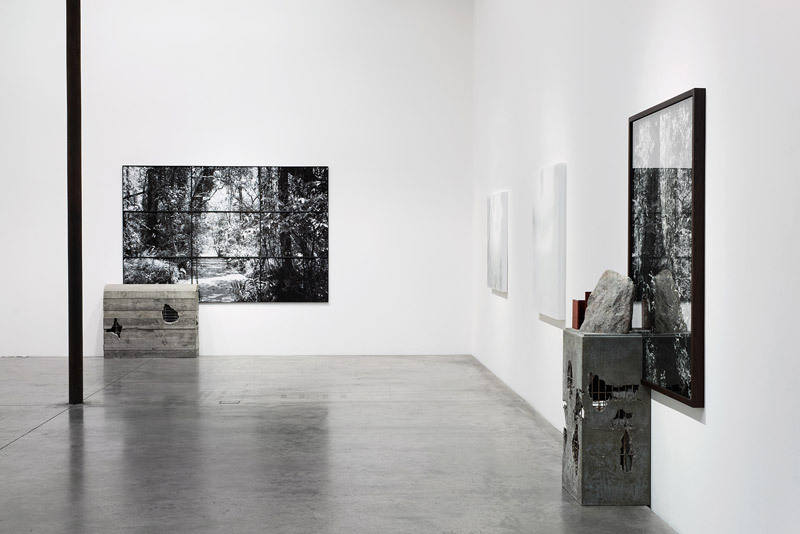 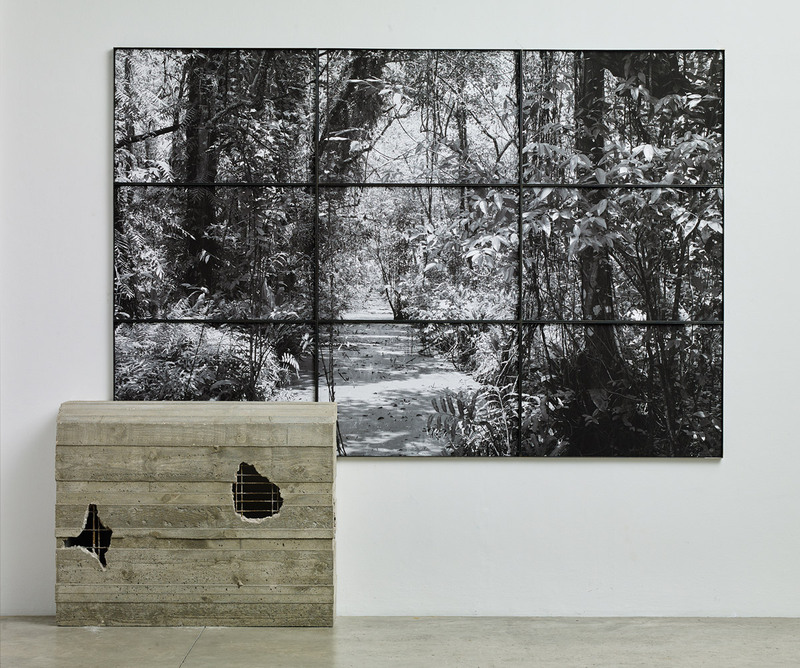 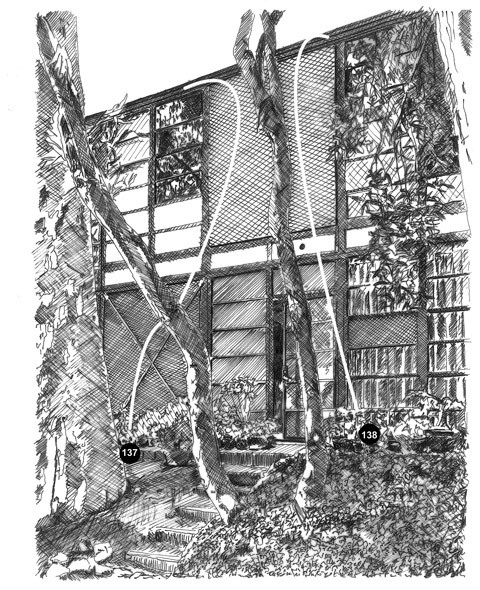 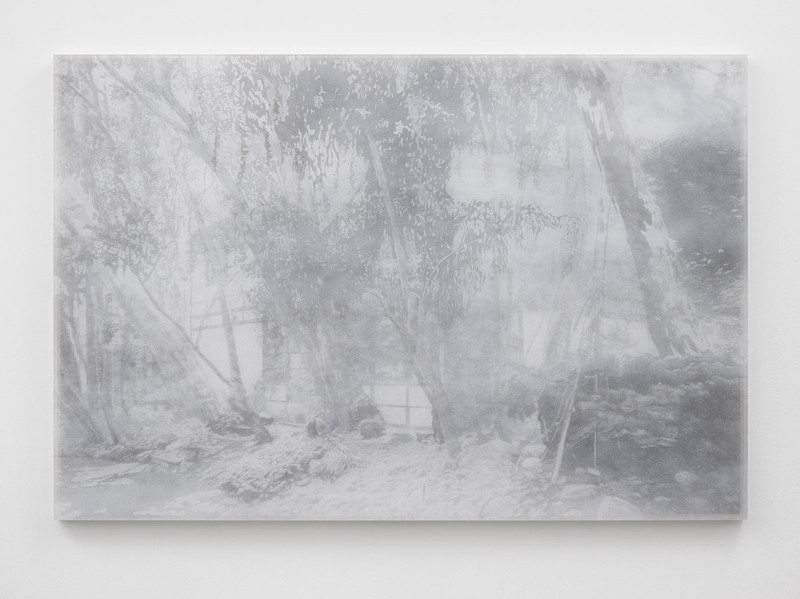 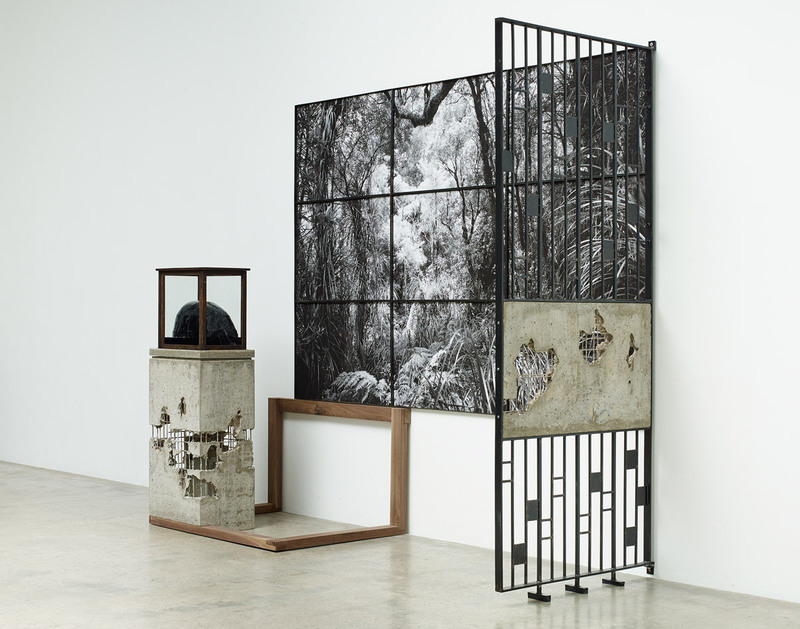 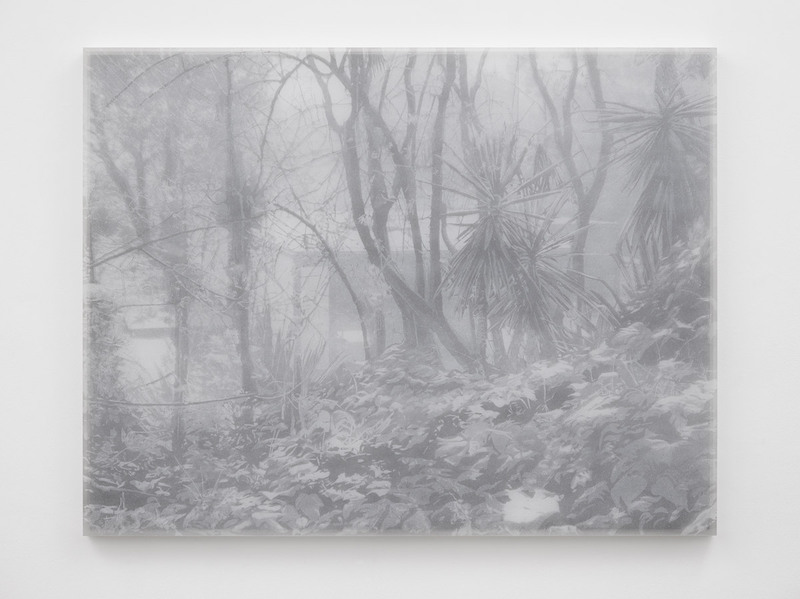 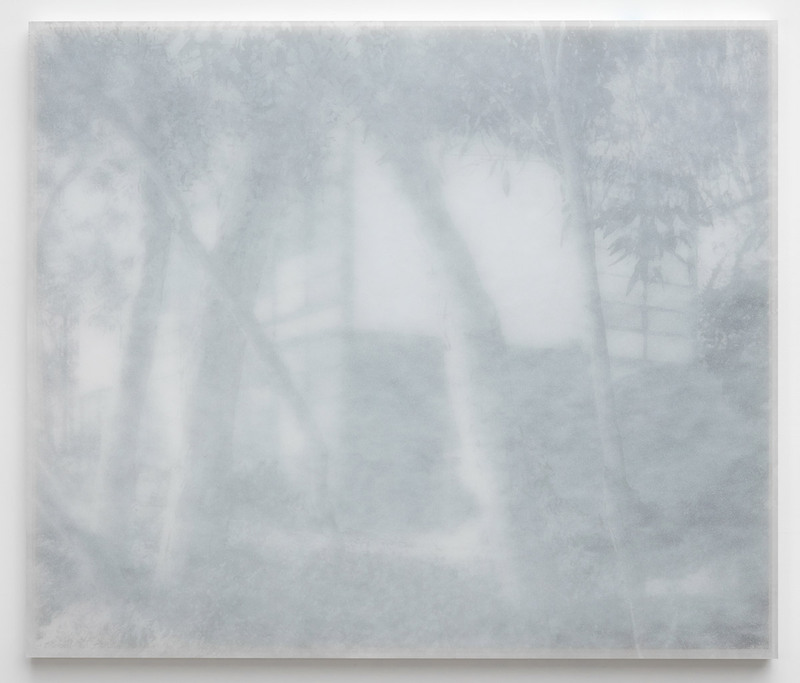 Large scale sculptural works use black and white photographs of the dense jungle vegetation. 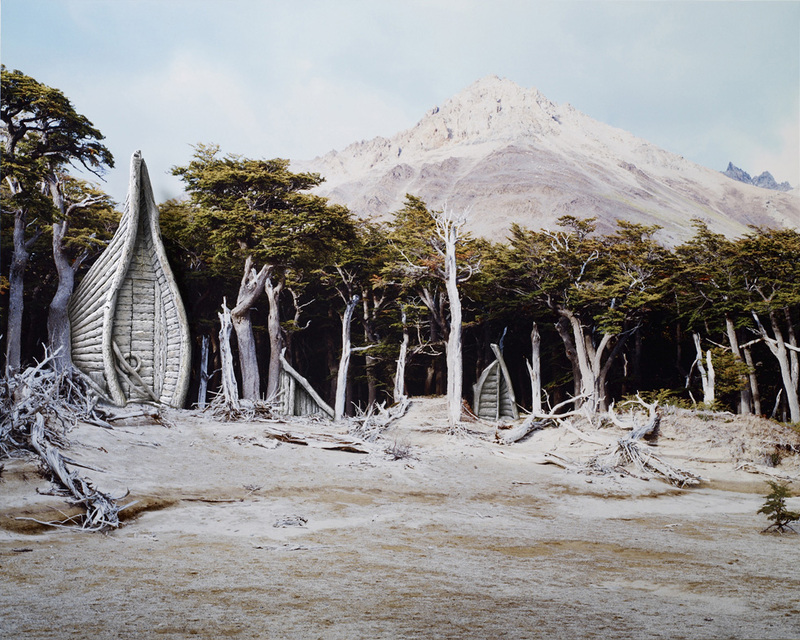 Sculptural appendages of unidentified architectural and archaeological elements merge into the images, propping and framing the encroaching abundant growth of their setting. 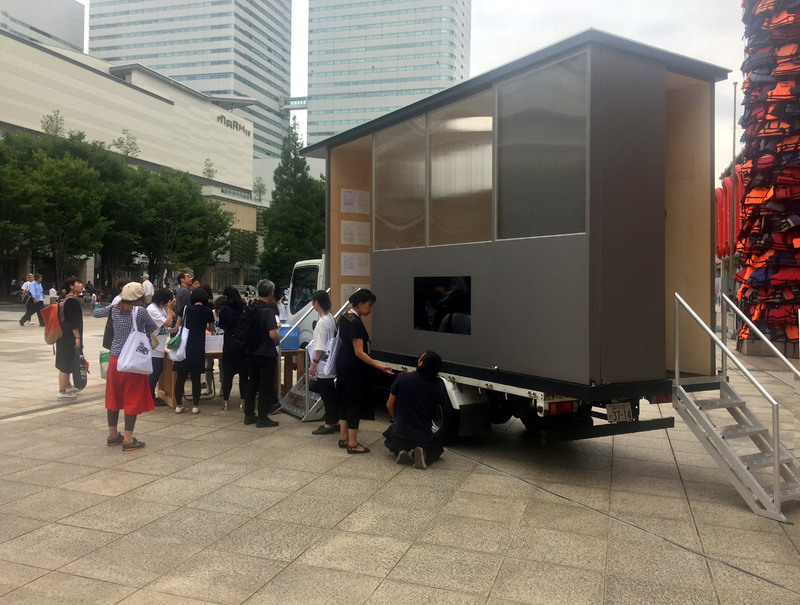 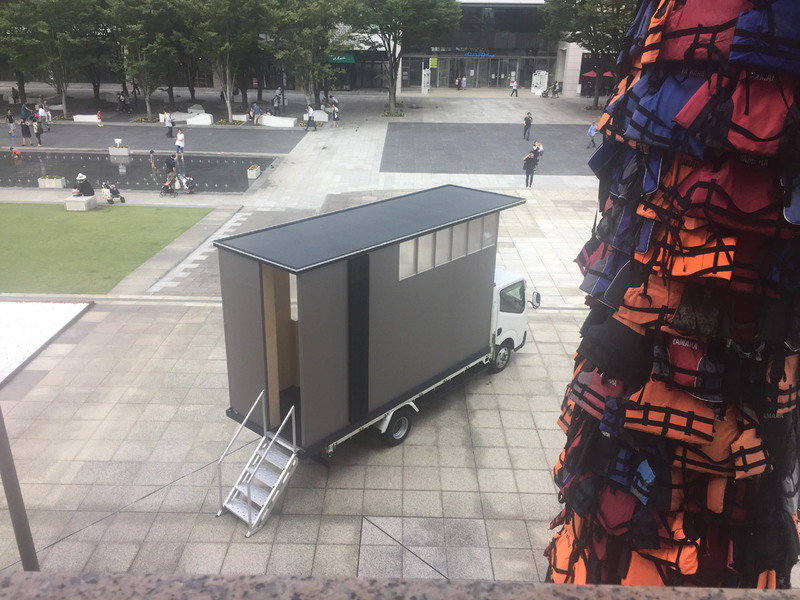 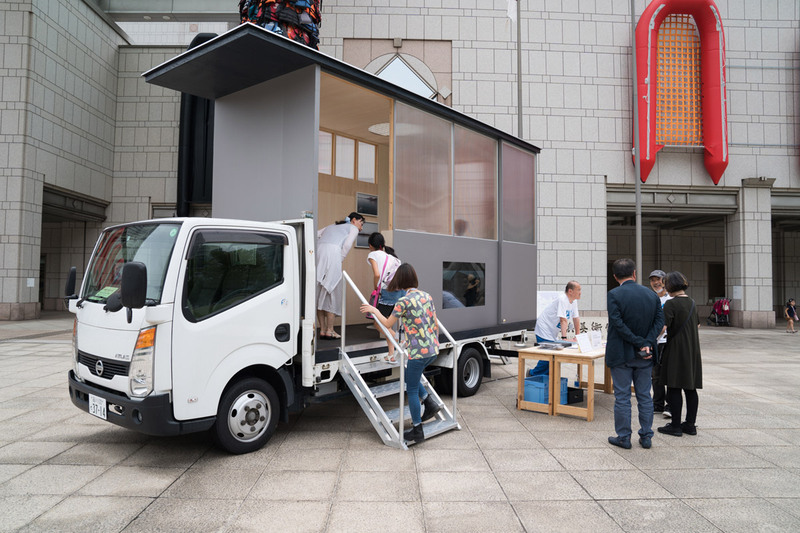 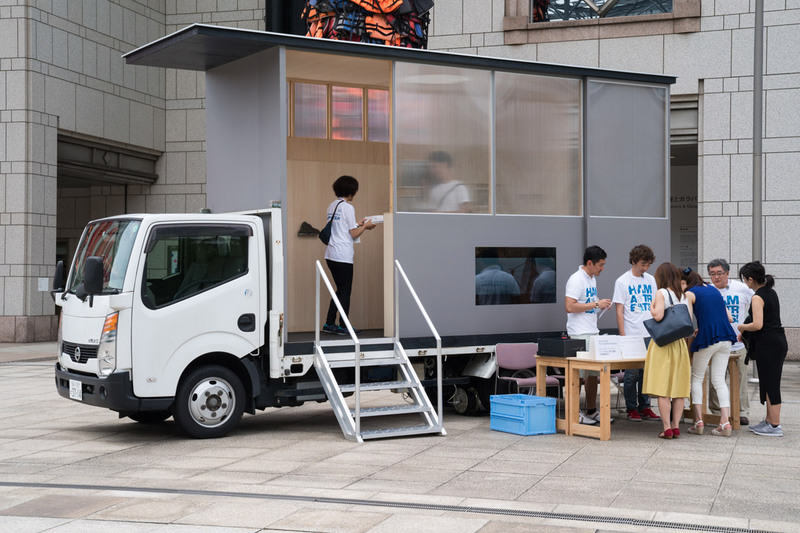 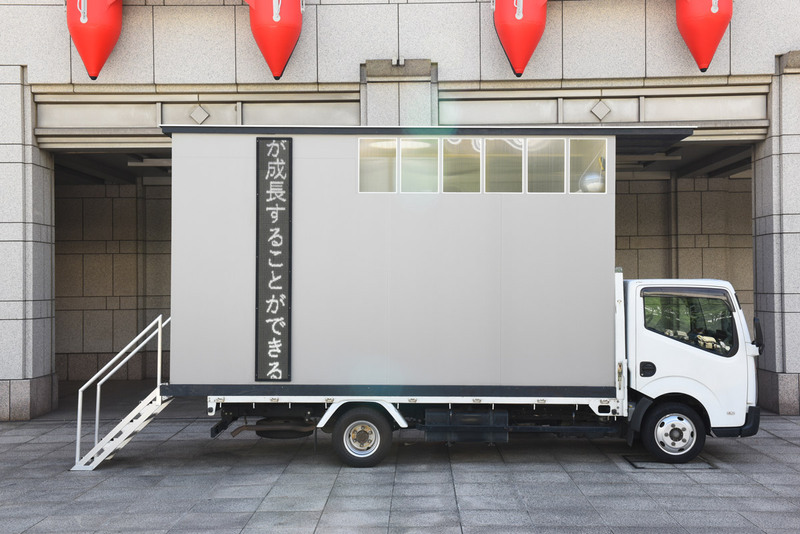 The Nowhere Embassy is a foundationless mobile building transported on the back of a small flatbed truck. 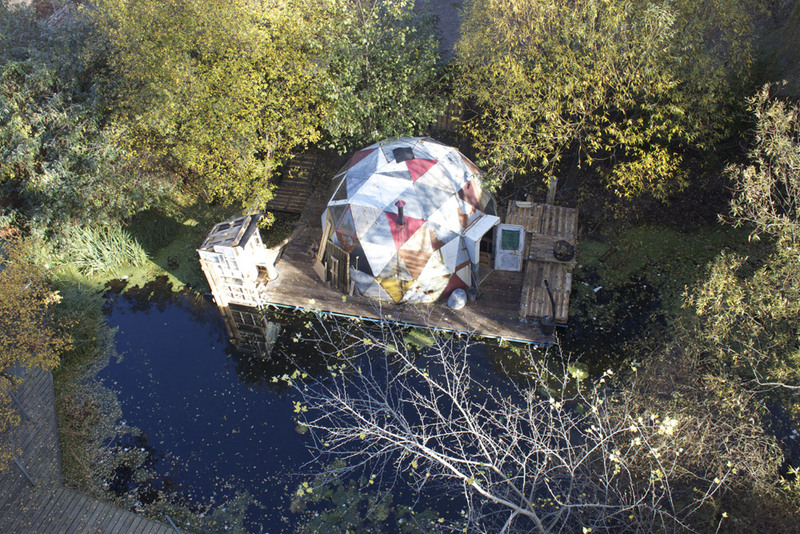 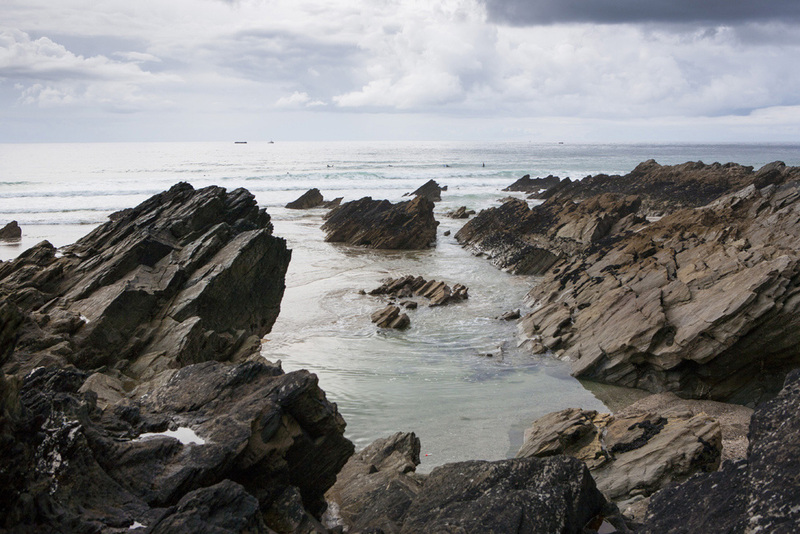 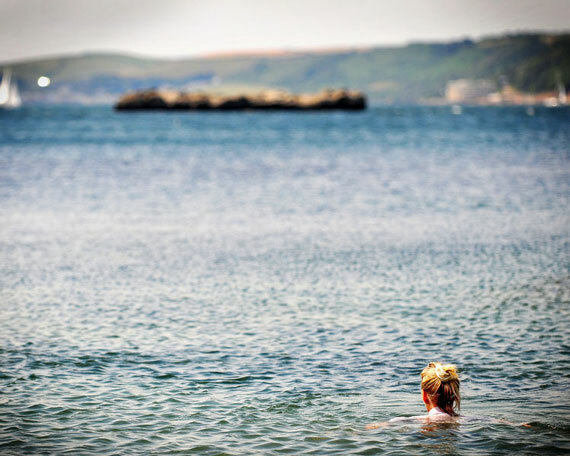 It is an extension of the Nowhereisland project. 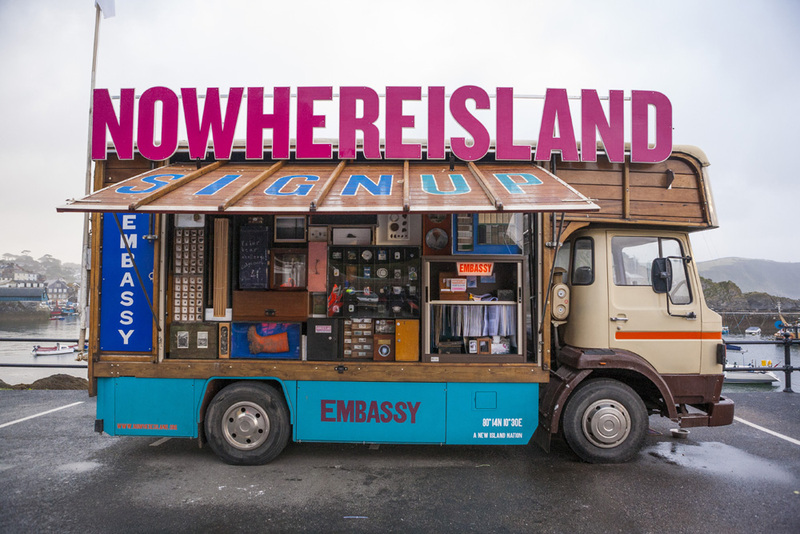 The Nowhere Embassy appears here and there throughout the Triennial like an island adrift. 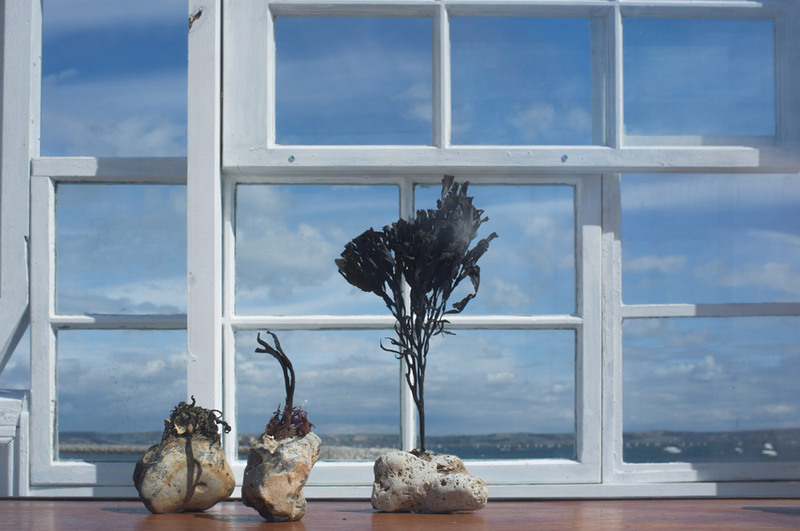 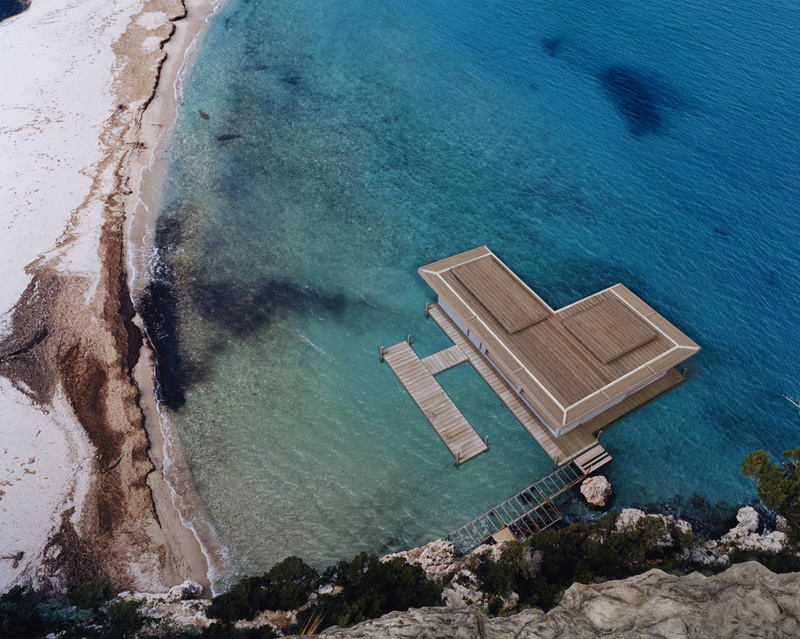 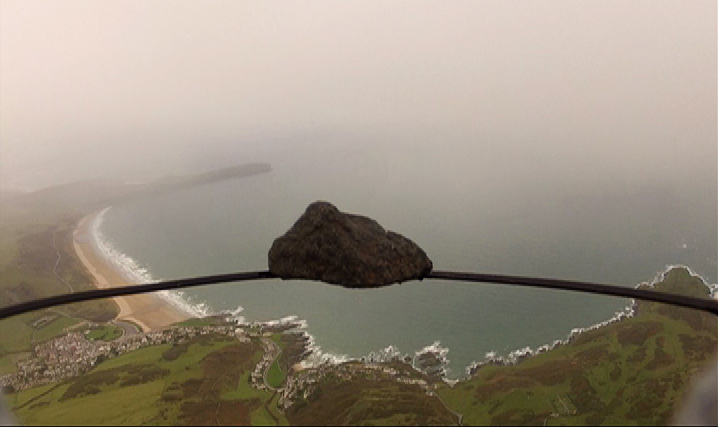 The work sits within the overall curatorial theme of the Triennial Islands, Constellations and Galapagos. 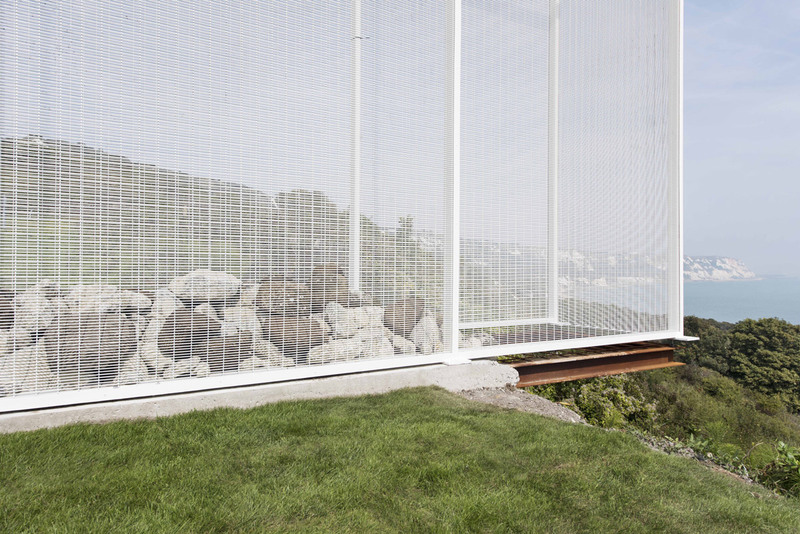 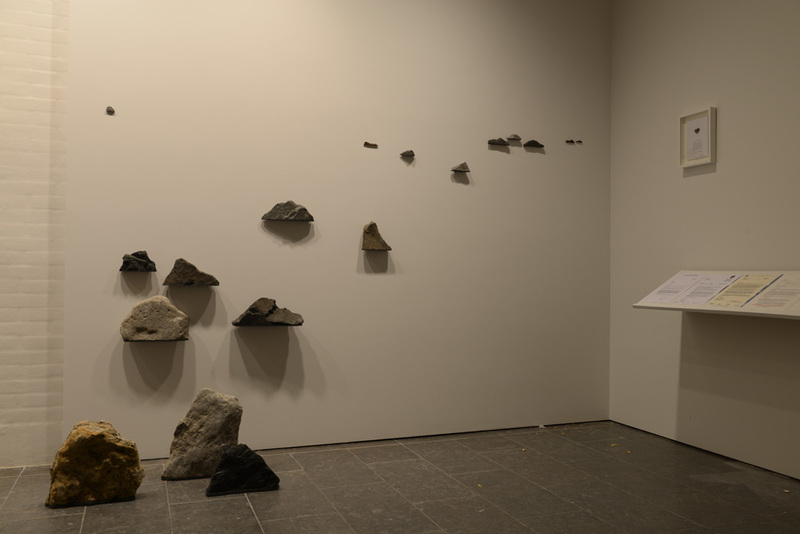 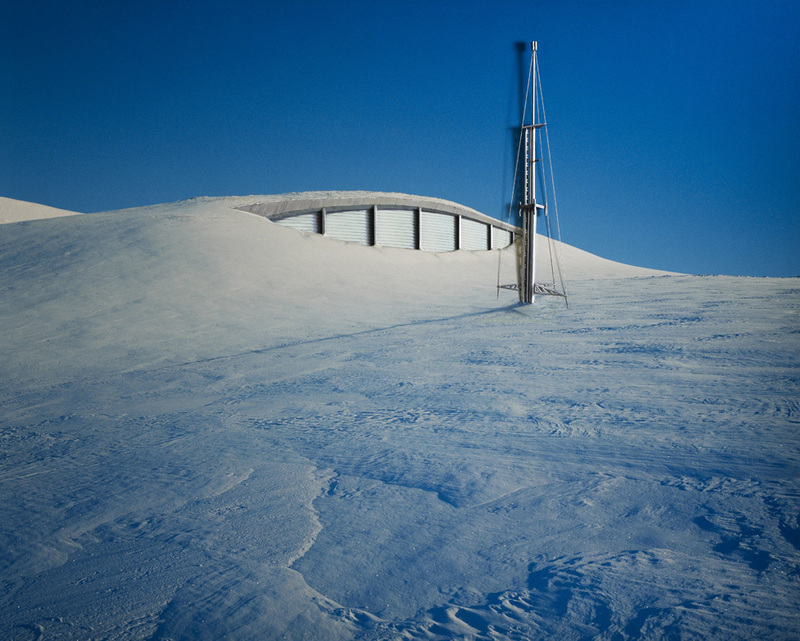 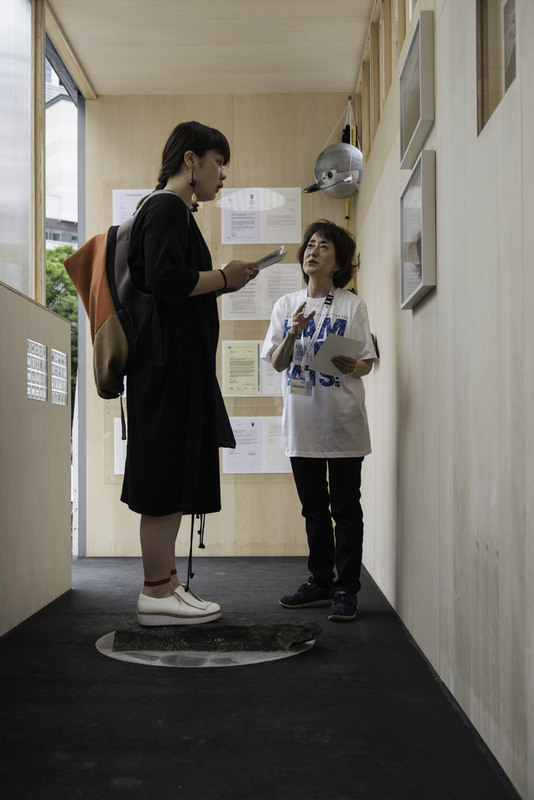 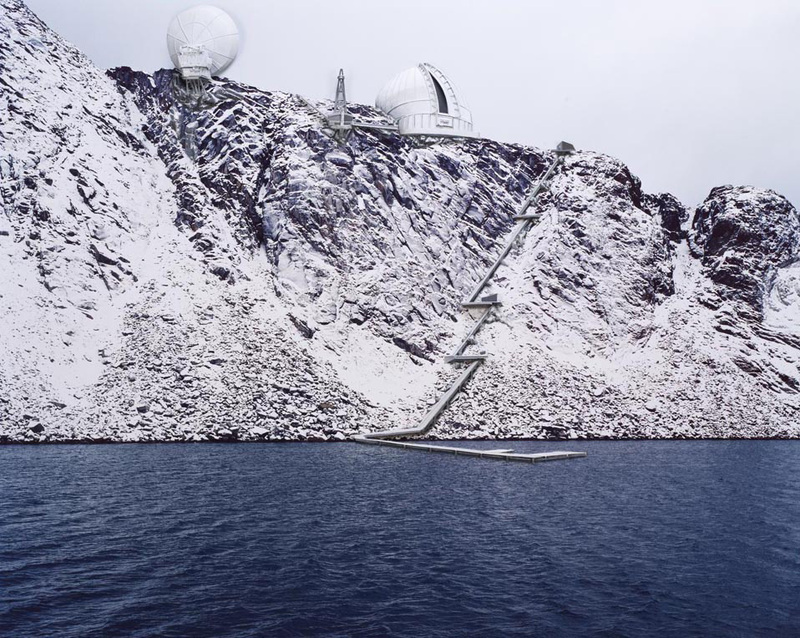 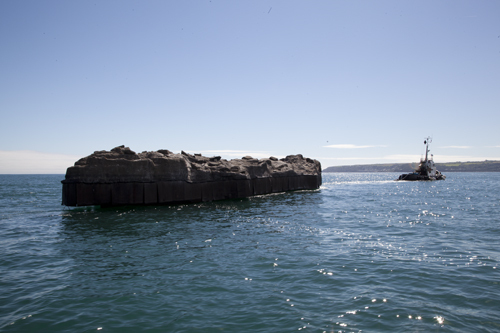 Visitors are invited to visit the Embassy as a supranational space beyond existing national boundaries or jurisdiction; once inside the Embassy, the visitor stands on Nowhereisland's Arctic rocks, transporting them from somewhere to Nowhere. 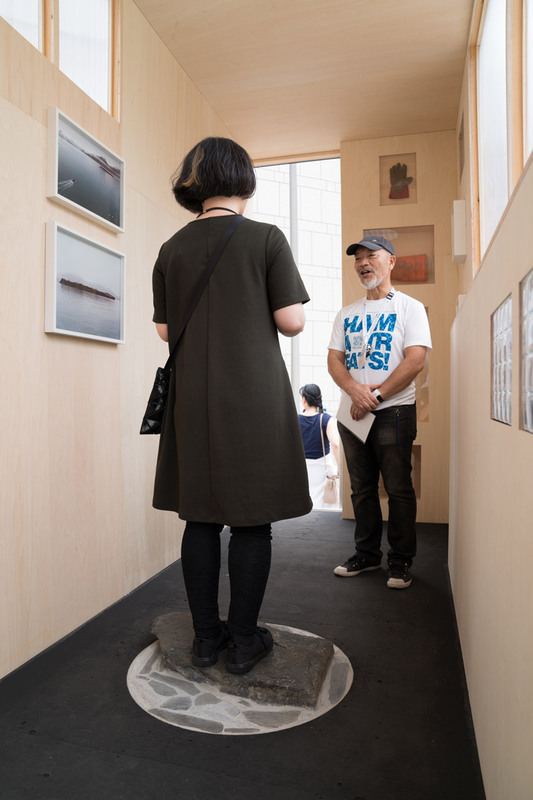 During the triennial, Hartley solicited and recorded propositions from the public to imagine a new future and to voice what they would like to be different. 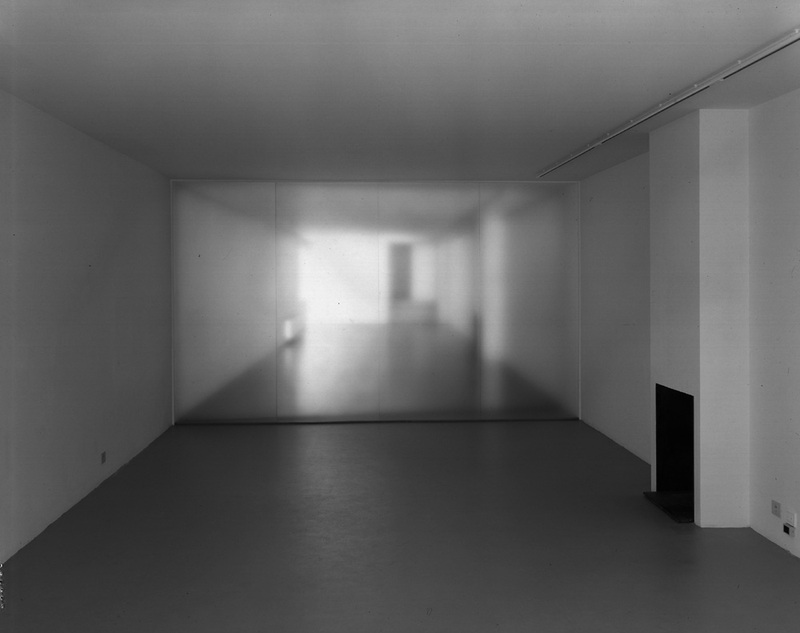 These thoughts where then declared whilst standing on the Nowhere territory. 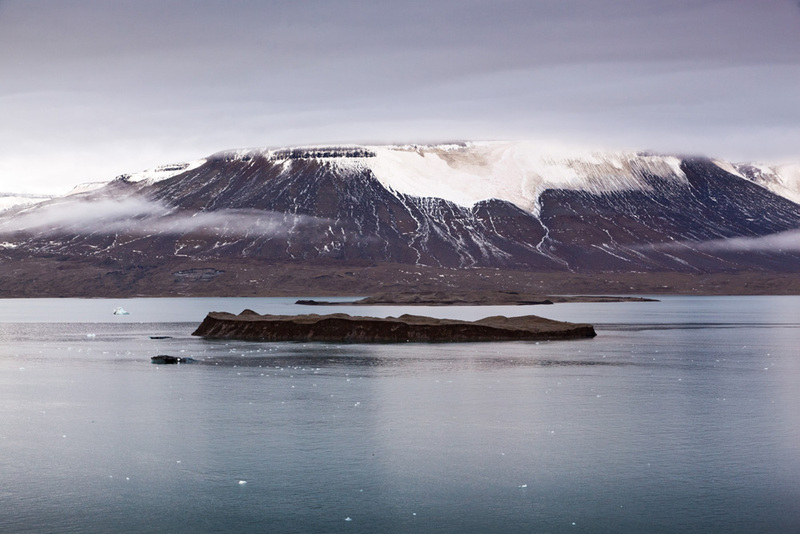 Those who contributed are given a small stone which once formed part of the original arctic island discovered by Hartley in 2004. 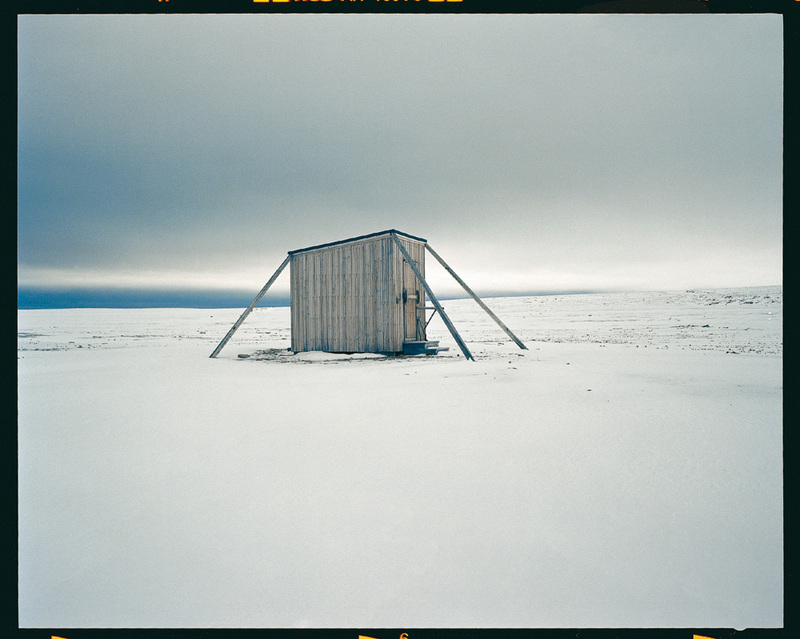 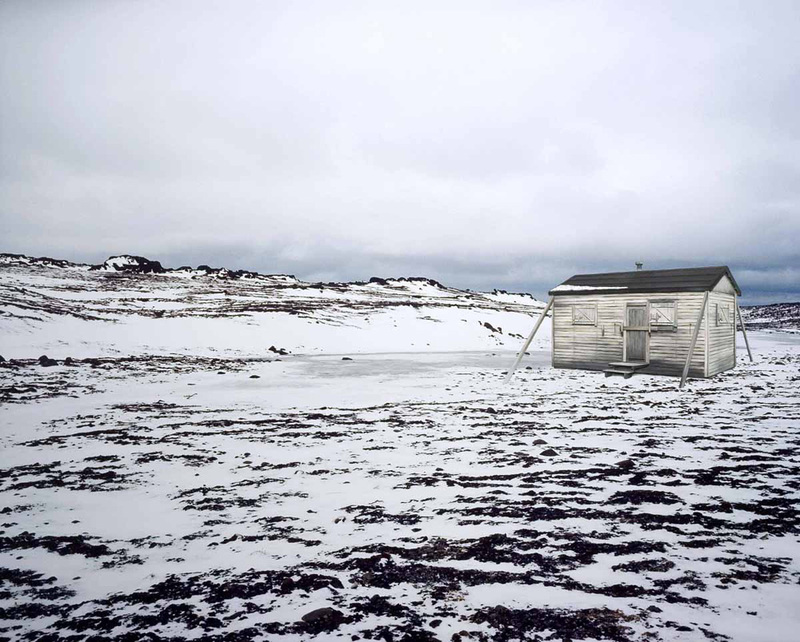 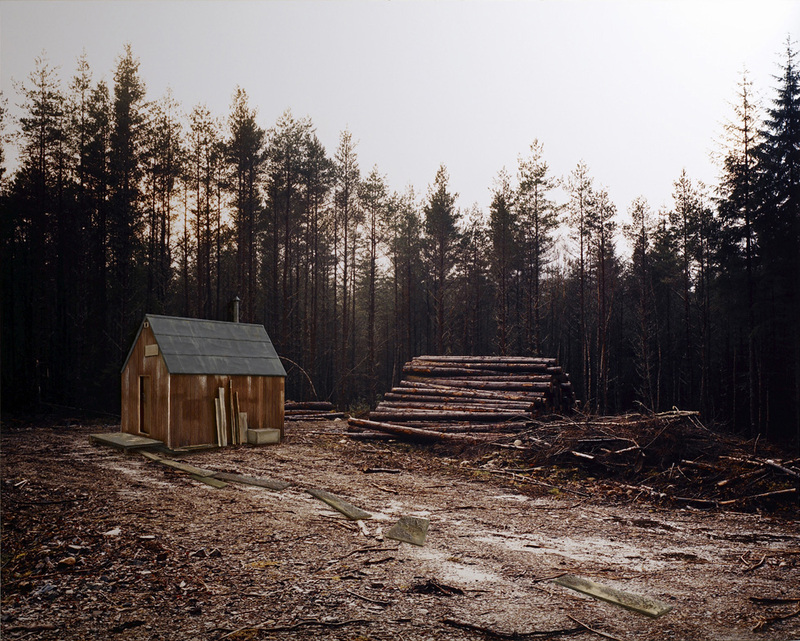 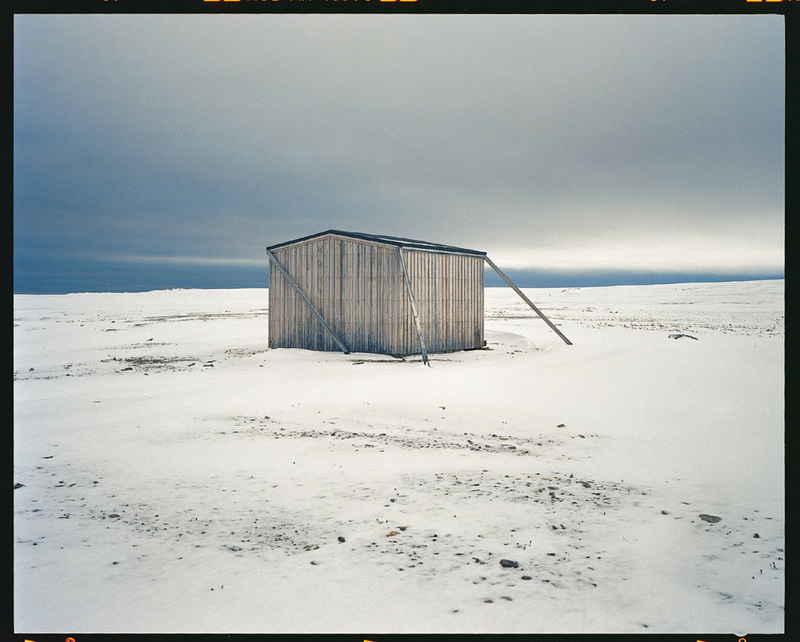 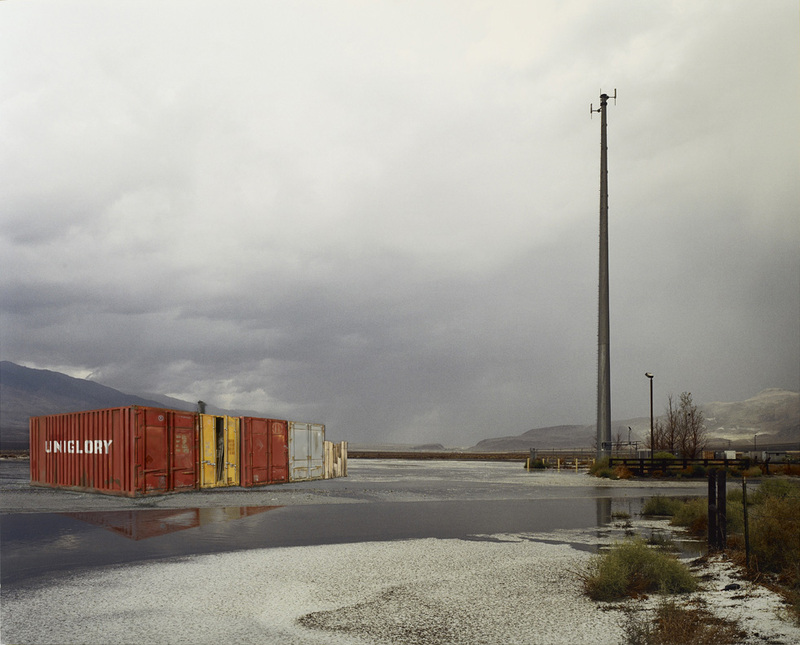 The project provoked thoughts about the nature of nations, territories and belonging. 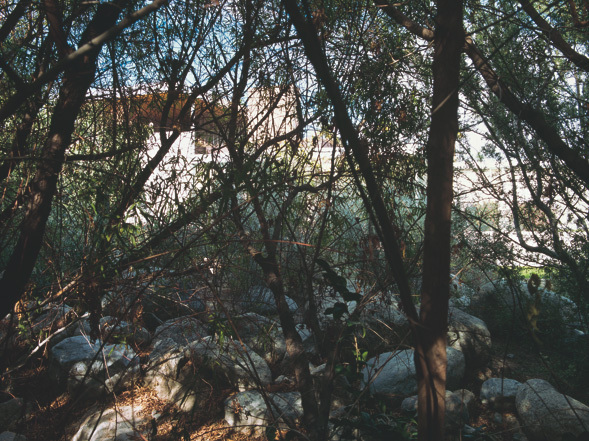 Run on the Bank. 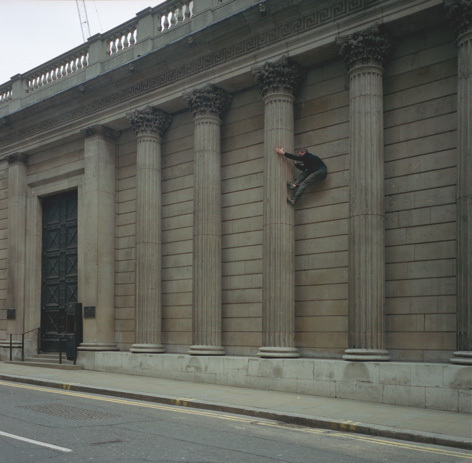 Bank of England.